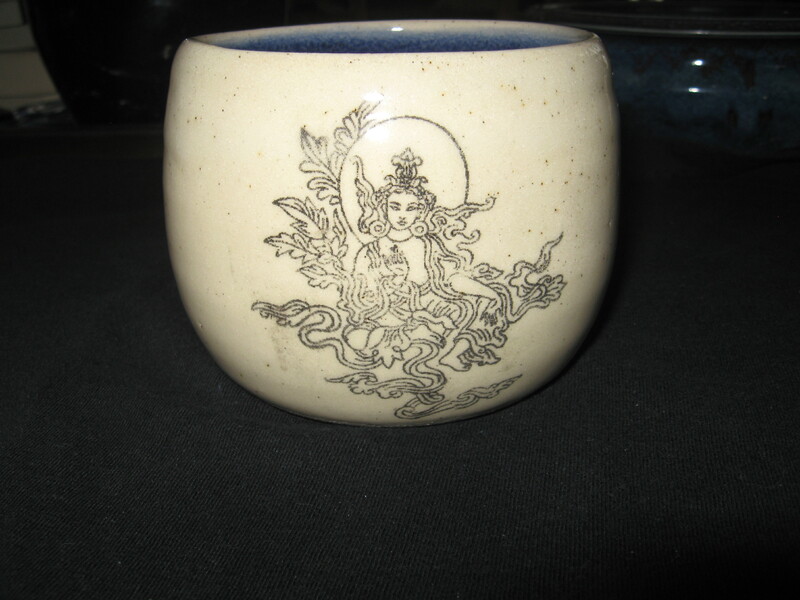 This marvelous mug is adorned with a flowing Buddha and measures roughly 500 ml / 2 cups / 16 oz. 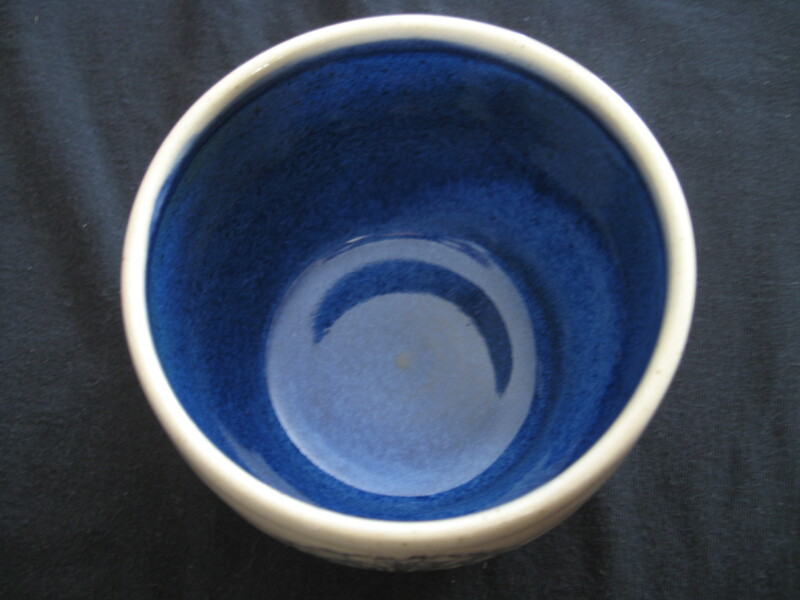 in size. 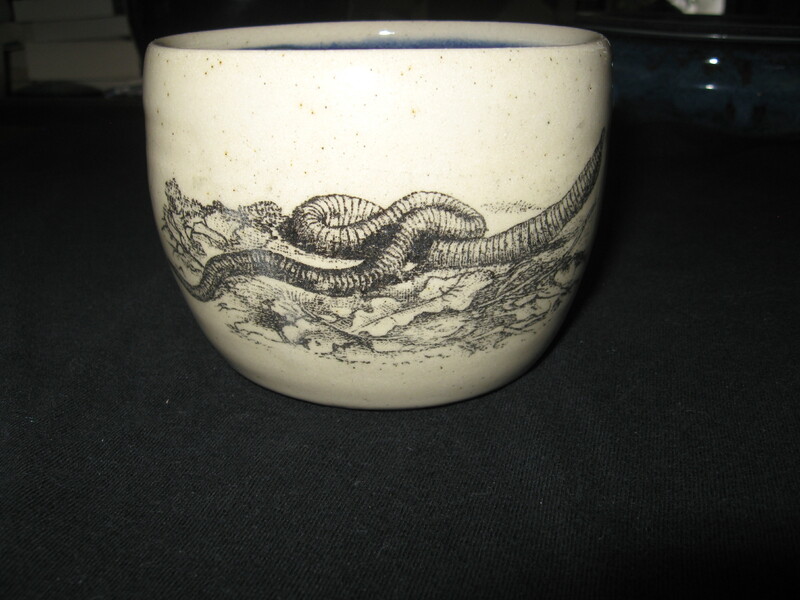 This marvelous mug displays a wriggly earth worm rambling through the leaves and grass. 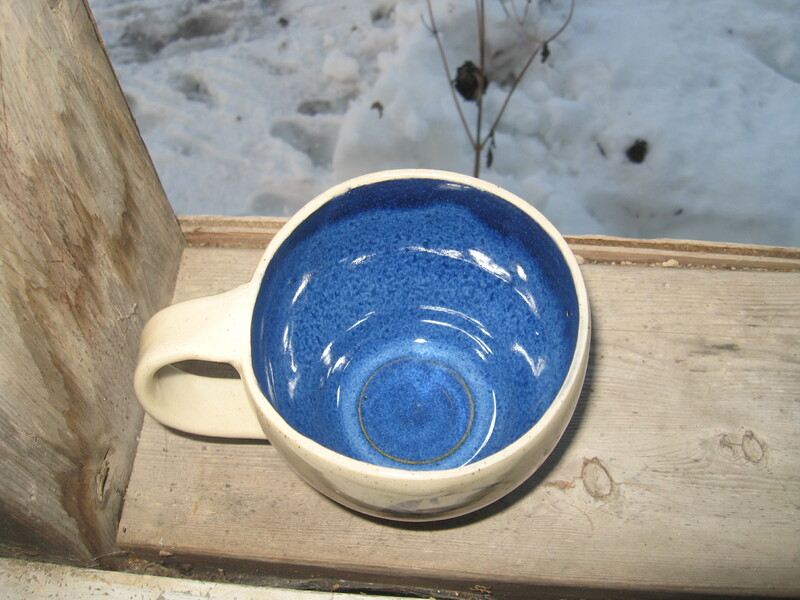 It measures roughly 500 ml / 2 cups / 16 oz. 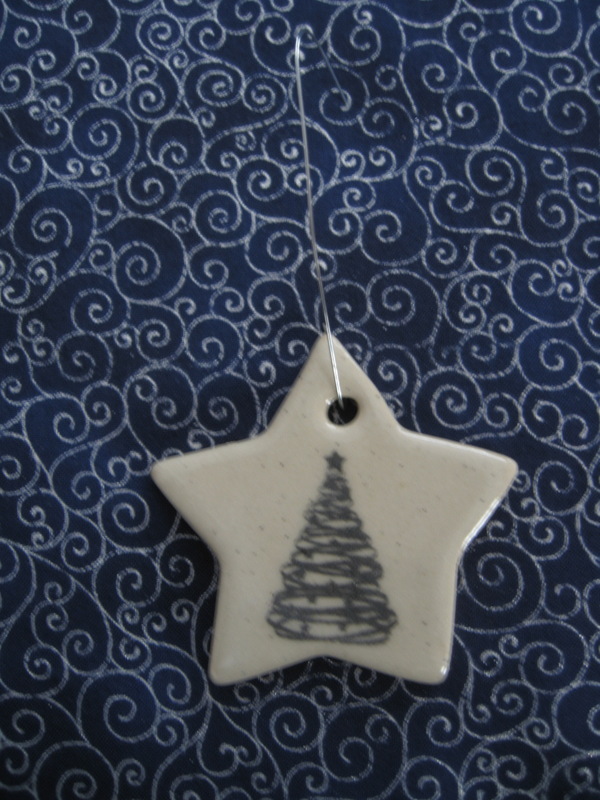 in size. 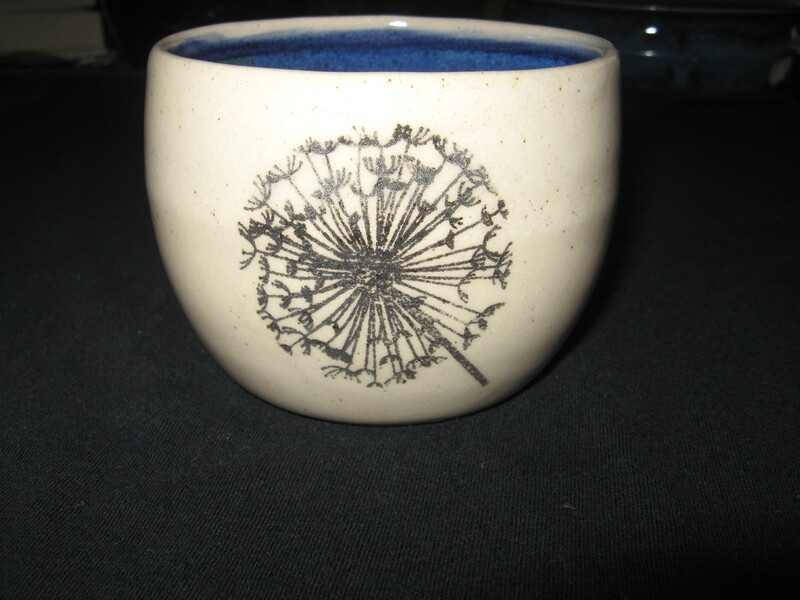 This marvelous mug displays a stylized dandelion and measures roughly 500 ml / 2 cups / 16 oz. 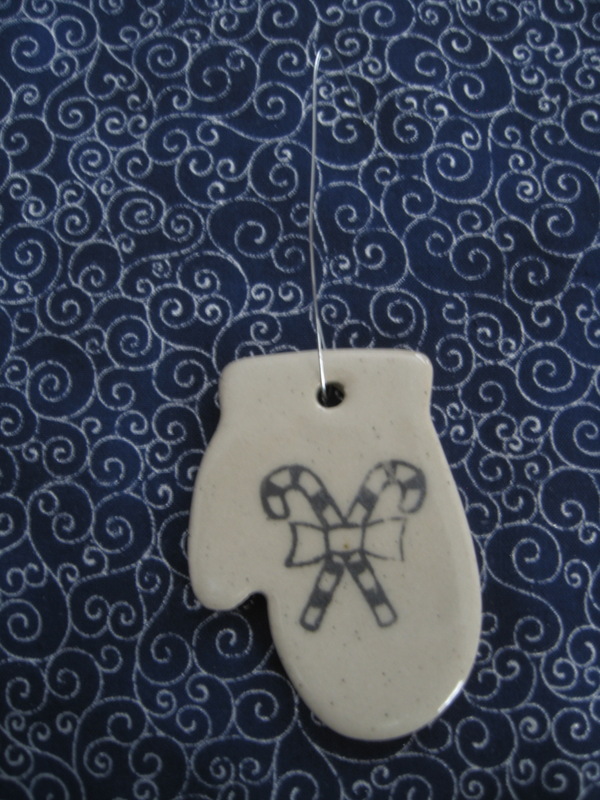 in size. 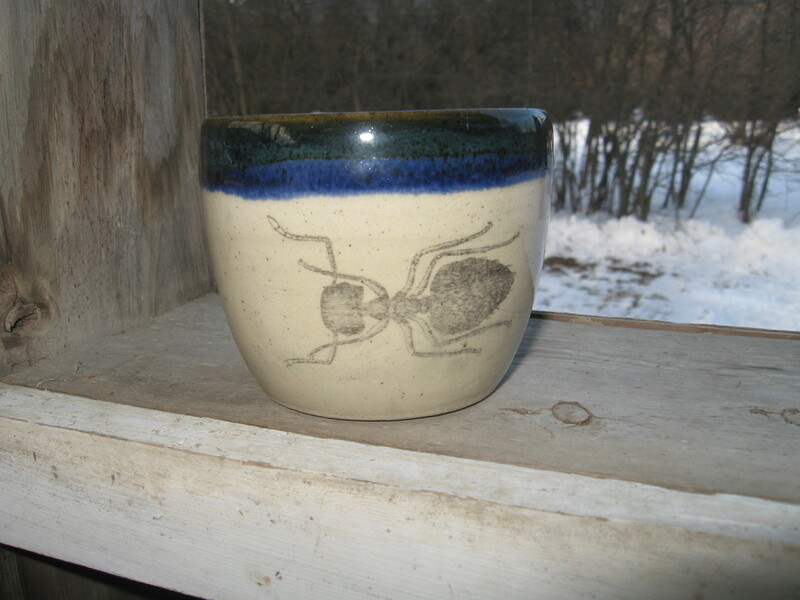 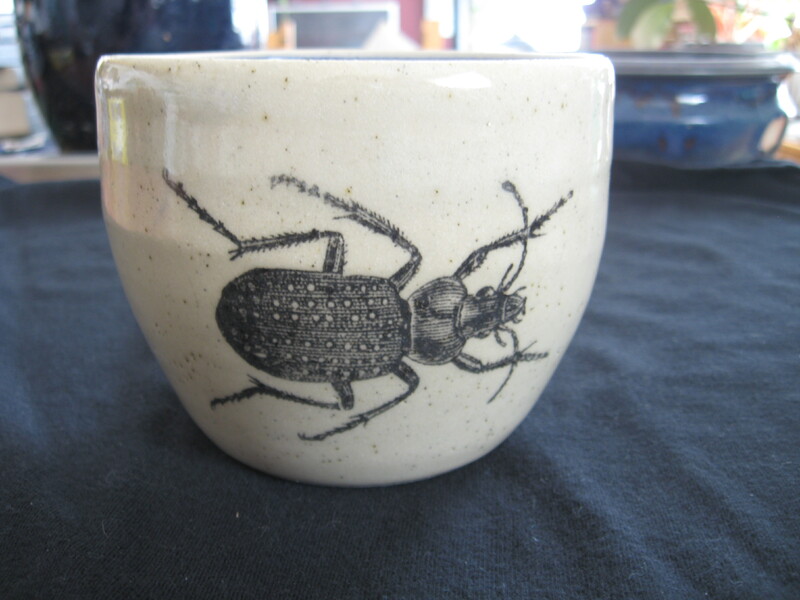 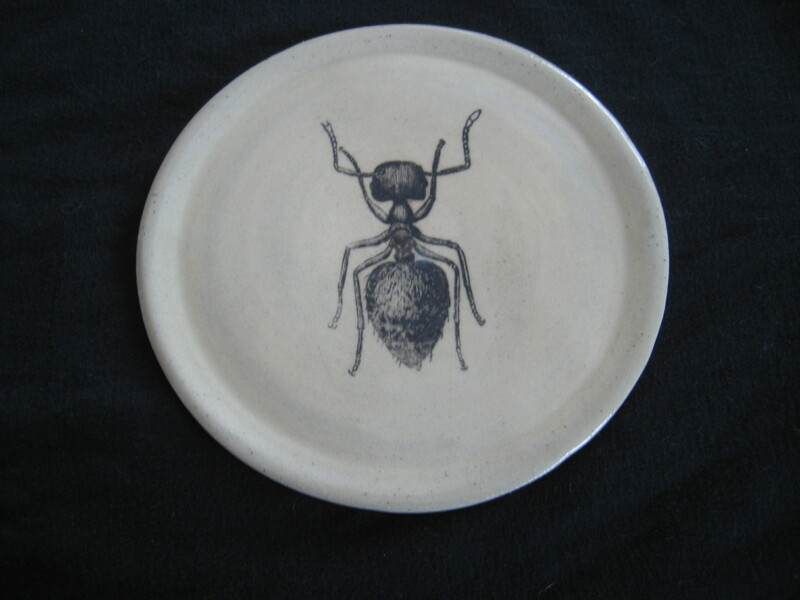 This marvelous mug is adorned with a spotted ground beetle. 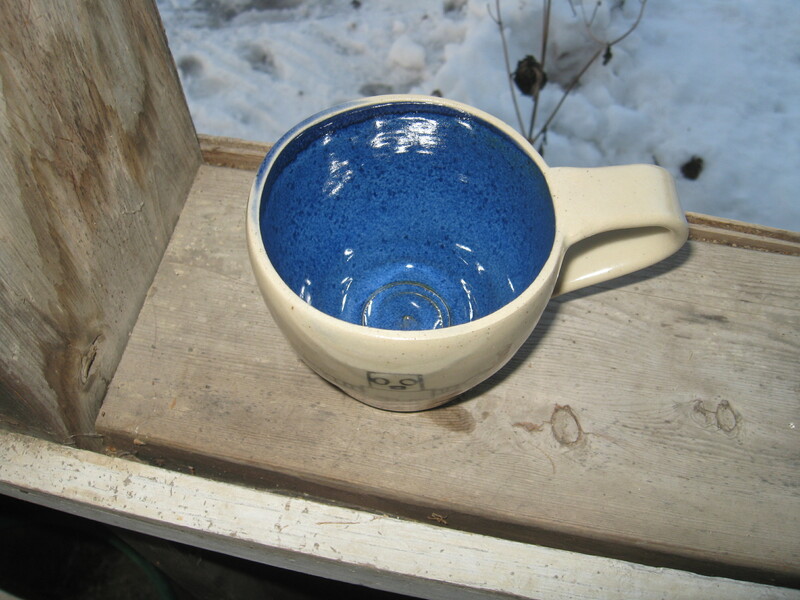 It measures roughly 500 ml / 2 cups / 16 oz. 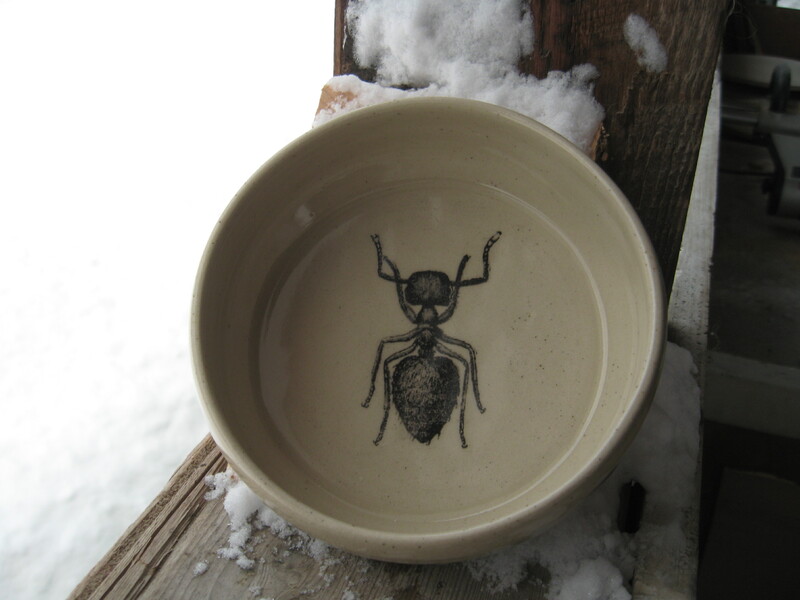 in size. 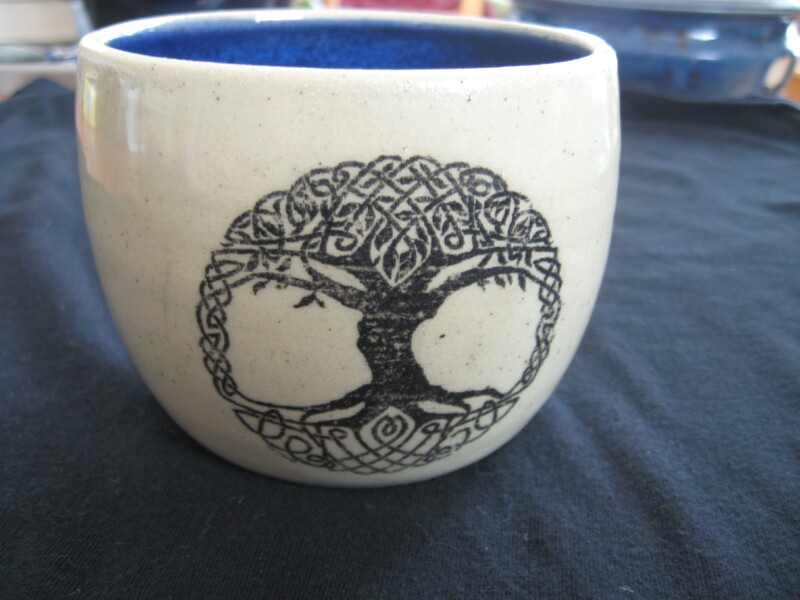 This marvelous mug displays a Norse tree of life / Yggdrasil tree design and it measures roughly 500 ml / 2 cups / 16 oz. 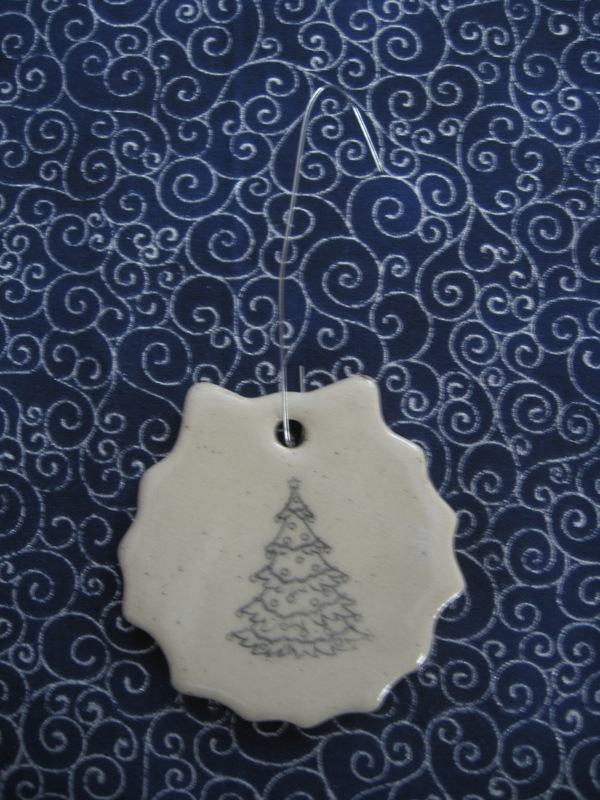 in size. 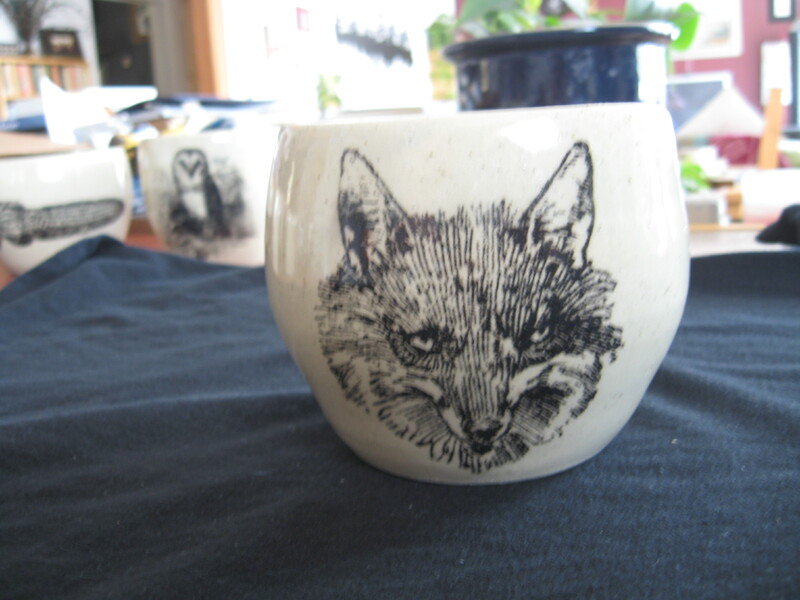 This marvelous mug is adorned with a wily fox. 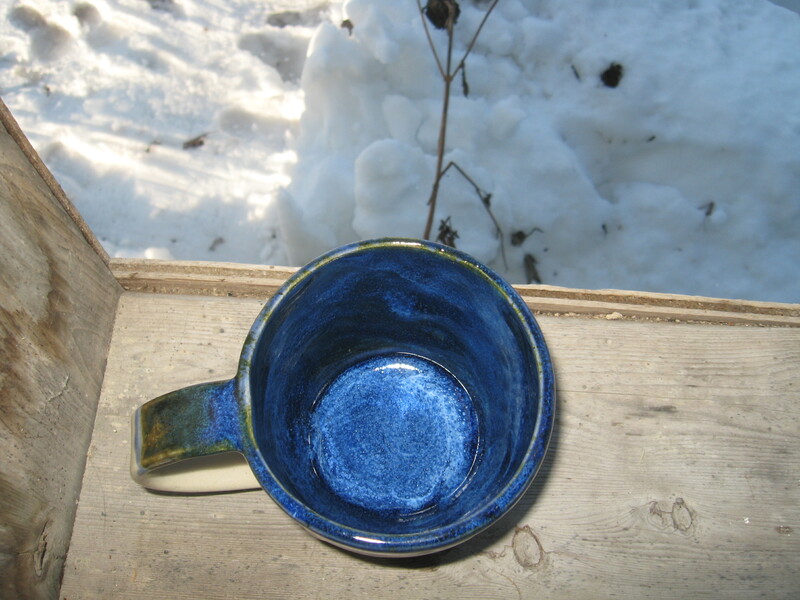 It measures roughly 500 ml / 2 cups / 16 oz. 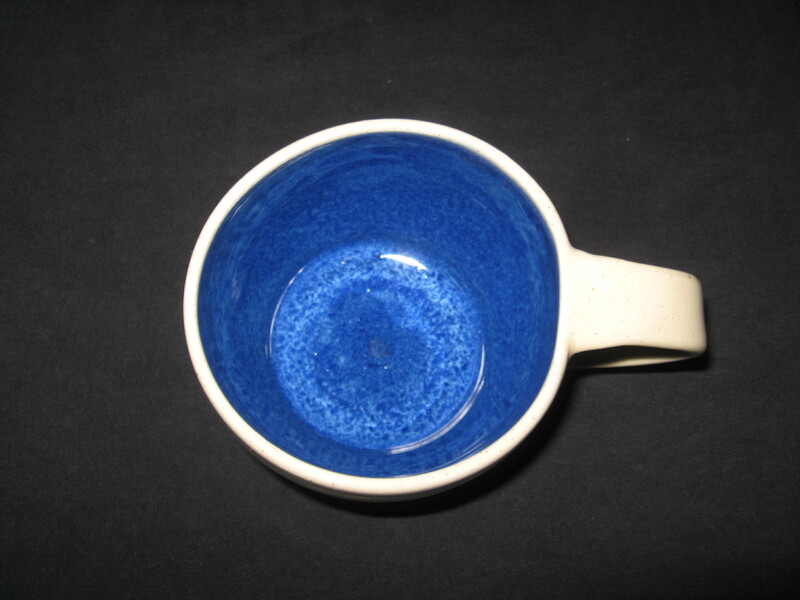 in size. 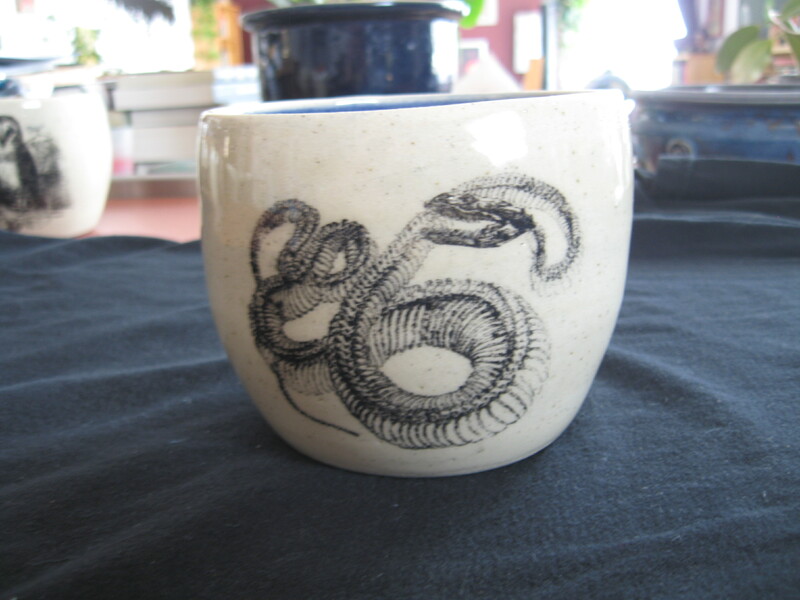 This marvelous mug is adorned with a winding snake skeleton. 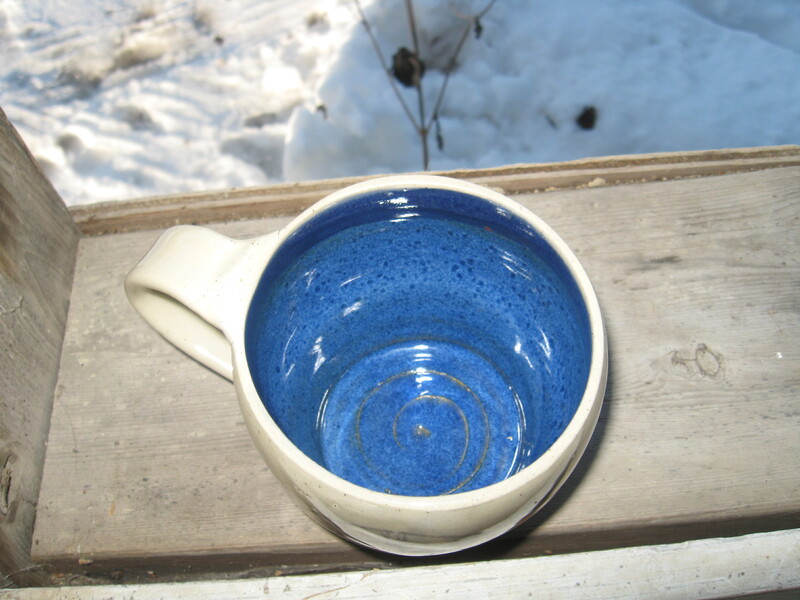 It measures roughly 500 ml / 2 cups / 16 oz. 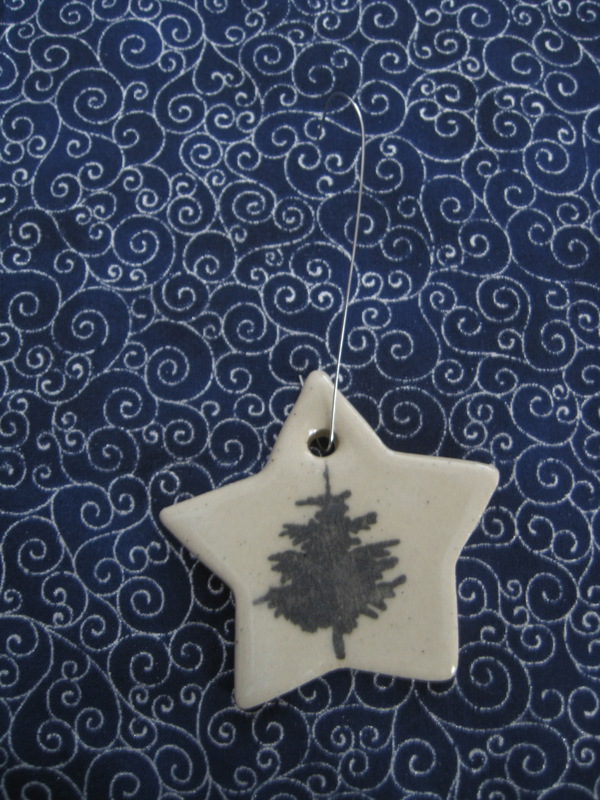 in size. 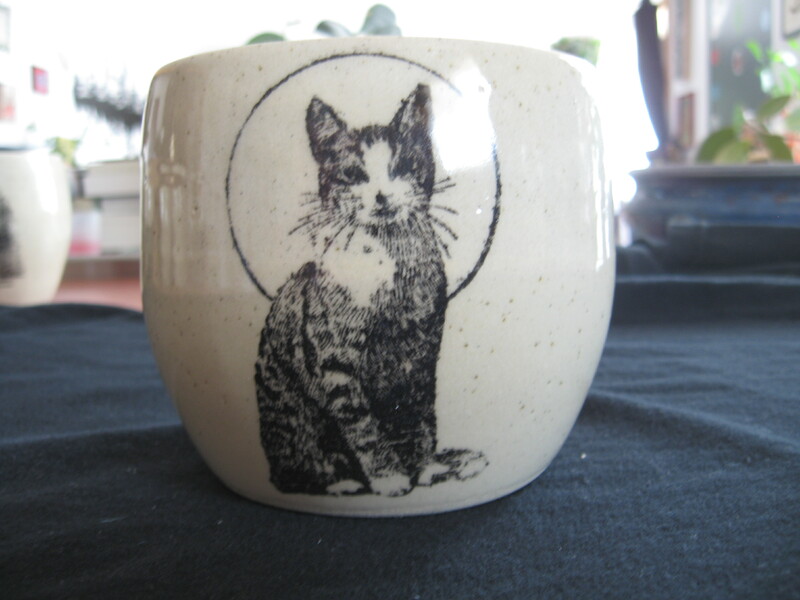 This marvelous mug displays a highly stylized cat and it measures roughly 500 ml / 2 cups / 16 oz. 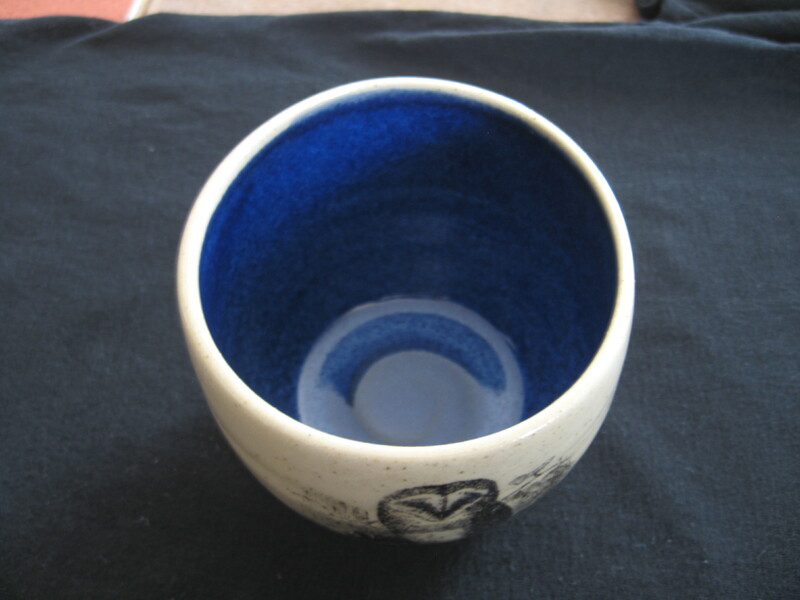 in size. 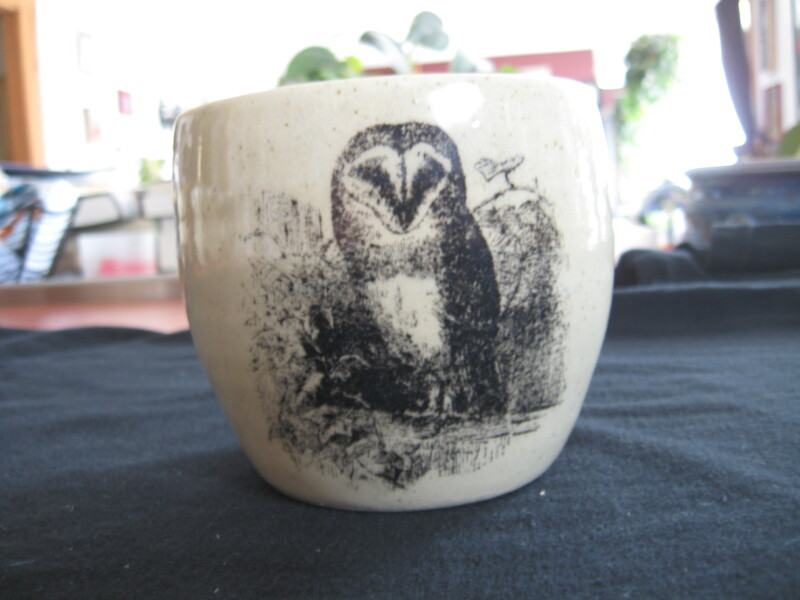 This marvelous mug displays a mischievous barn owl looking at you. 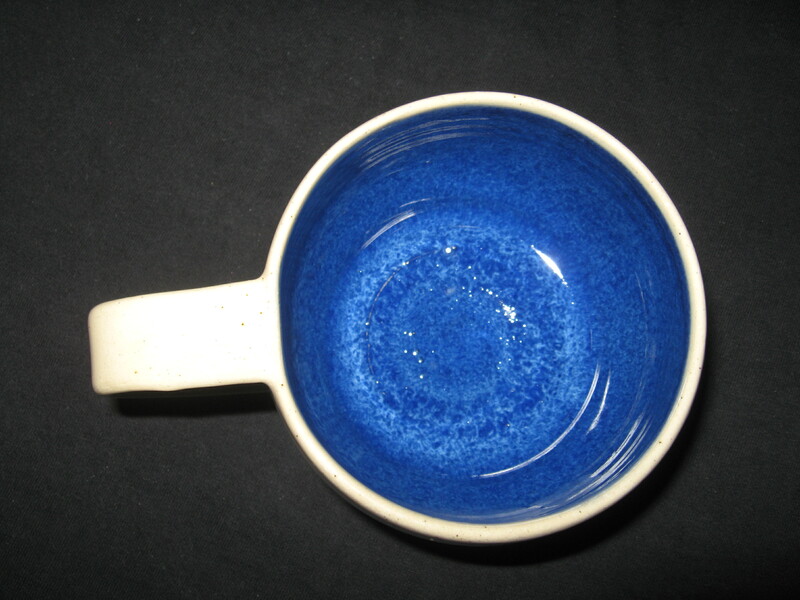 It measures roughly 500 ml / 2 cups / 16 oz. 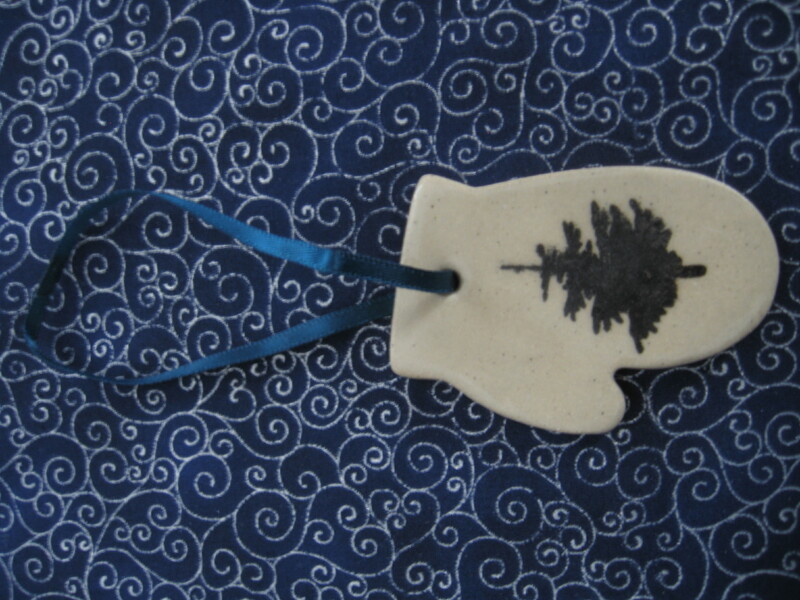 in size. 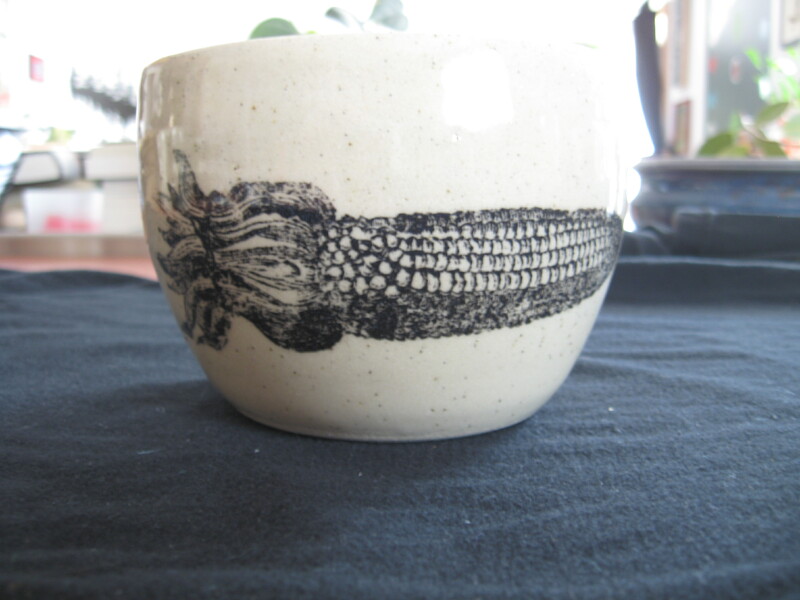 This marvelous mug displays a vintage illustration of a corn cob. 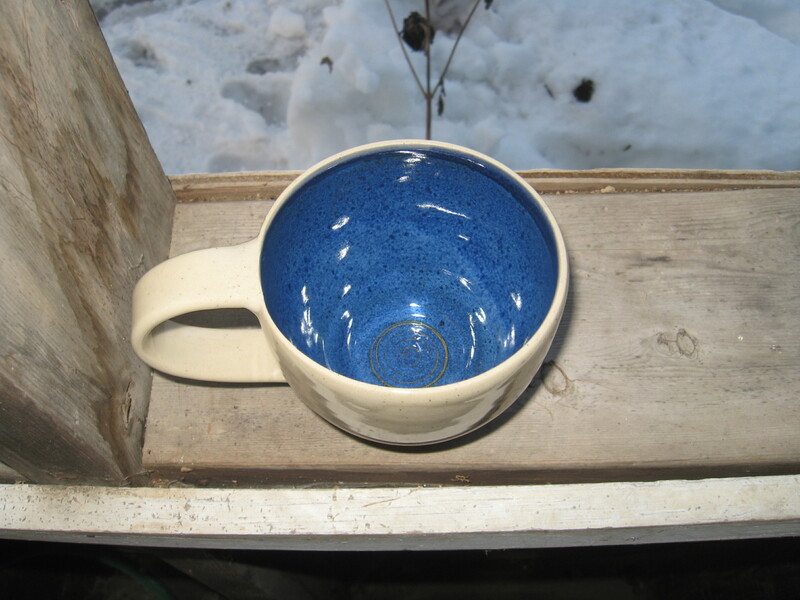 It measures roughly 500 ml / 2 cups / 16 oz. 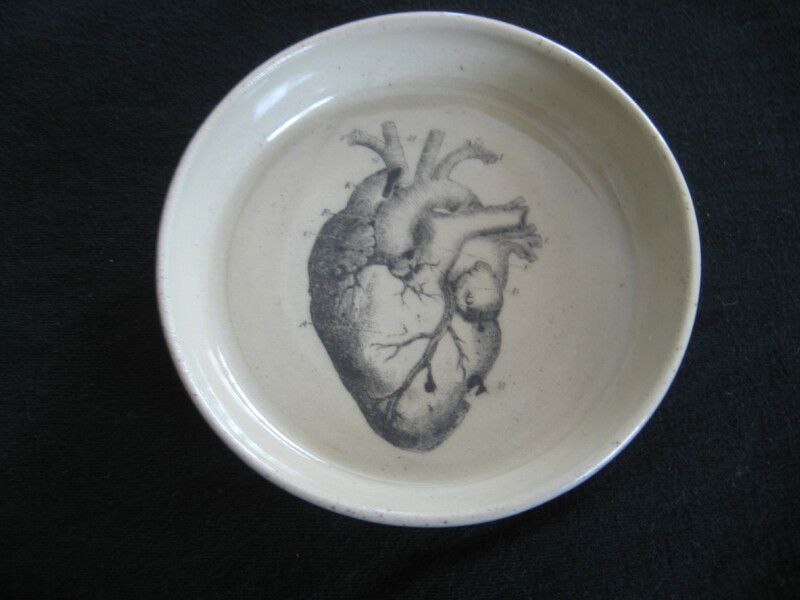 in size. 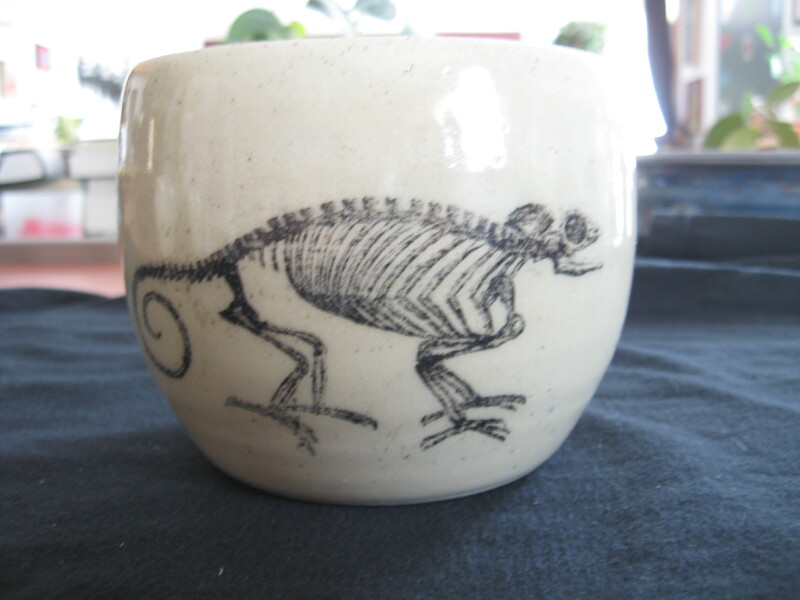 This marvelous mug displays a camelion skeleton and it is roughly 500 ml / 2 cups / 16 oz. 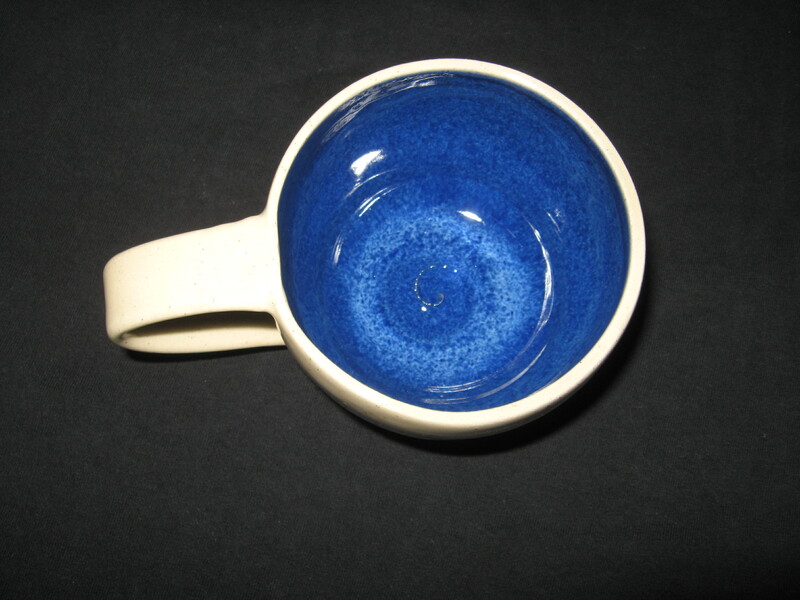 in size. 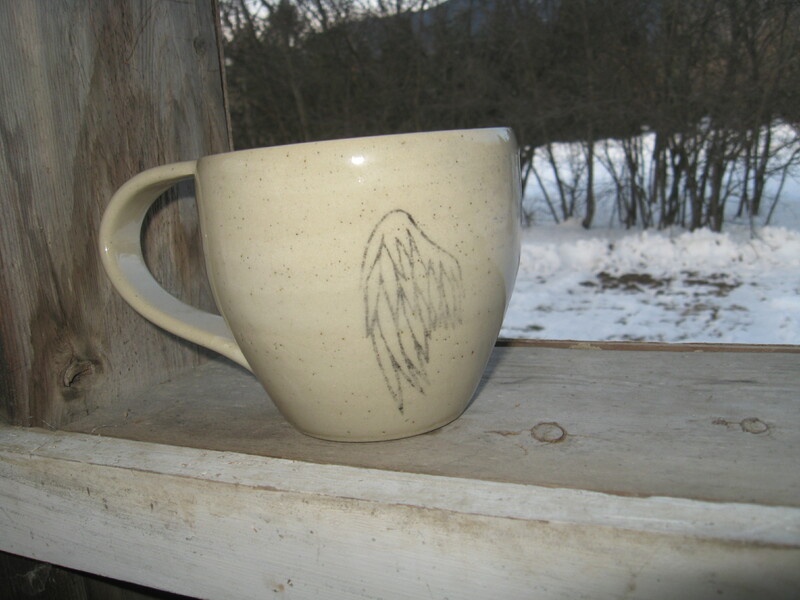 This marvelous mug is adorned with a wrapped dead bird – toe tag and all. 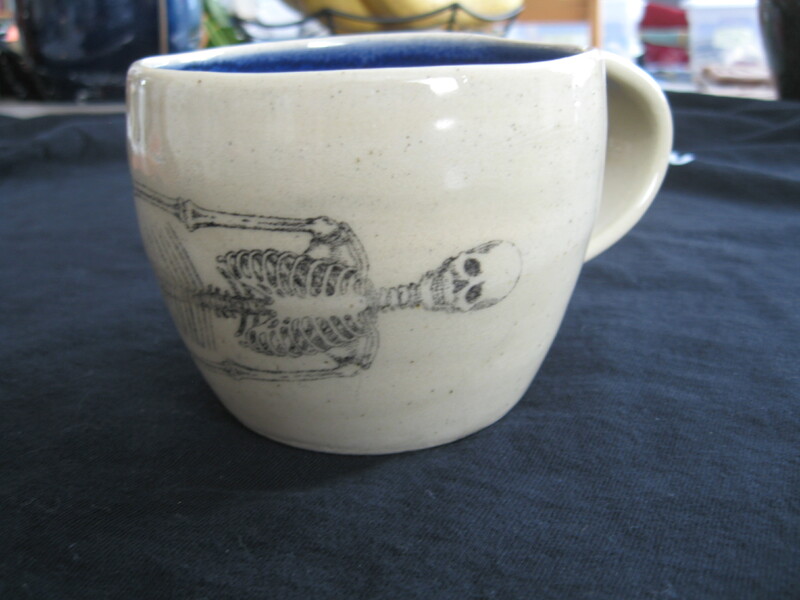 It measures roughly 500 ml / 2 cups / 16 oz. 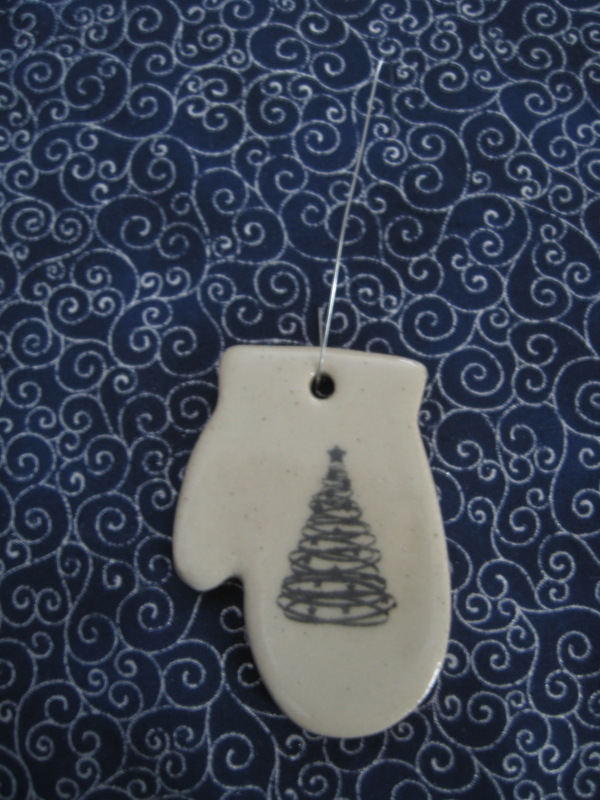 in size. 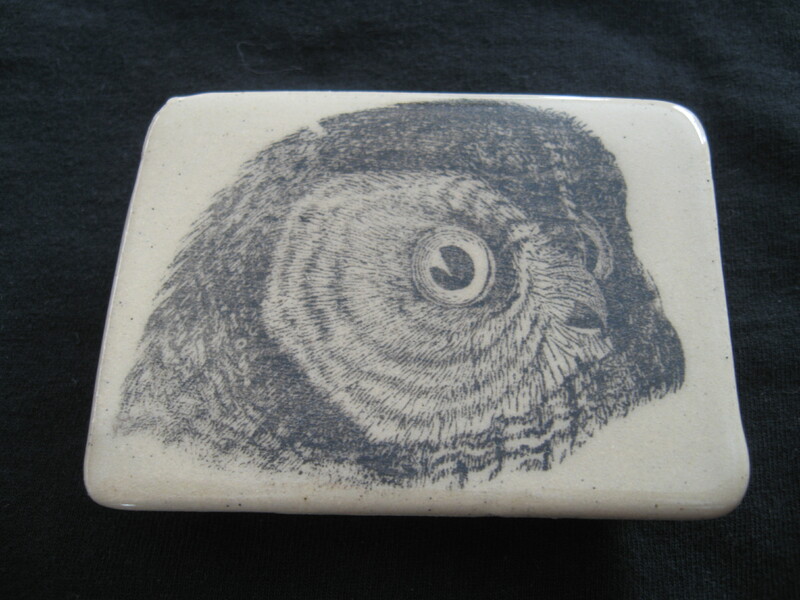 This bewitching belt buckle is adorned with an owl’s head watching every move you make…and every breath you take. 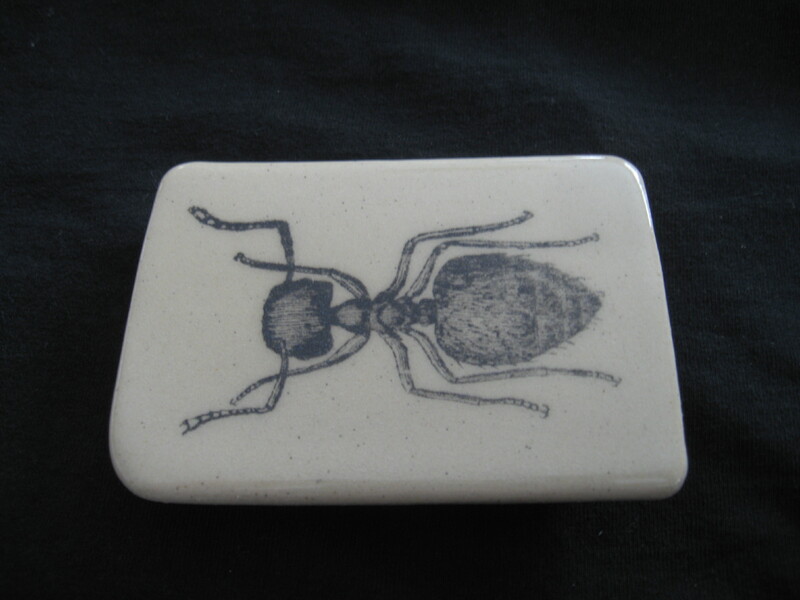 This bewitching belt buckle displays a fury little ant in the pant…s. 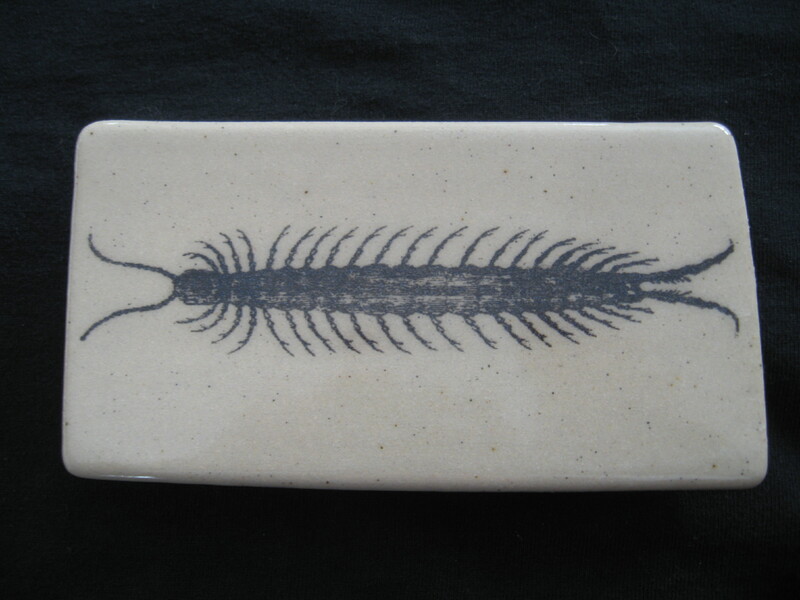 This bewitching belt buckle displays a centipede burrowing his way into your heart. 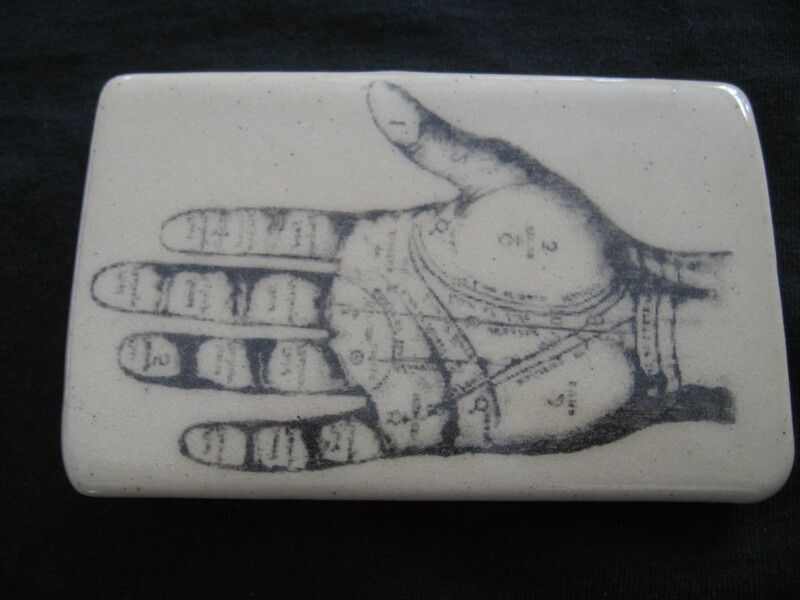 This bewitching belt buckle displays a palmistry hand open for a reading. 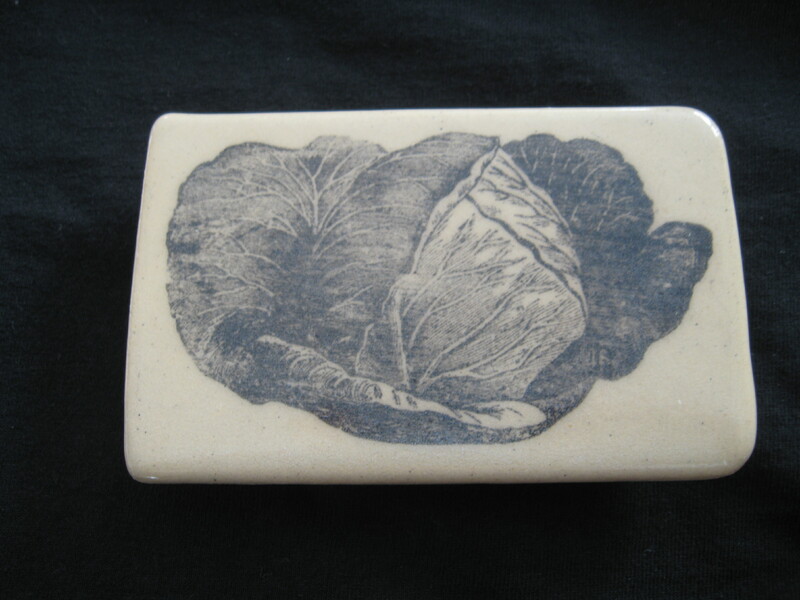 This bewitching belt buckle illustrates a randy head of cabbage. 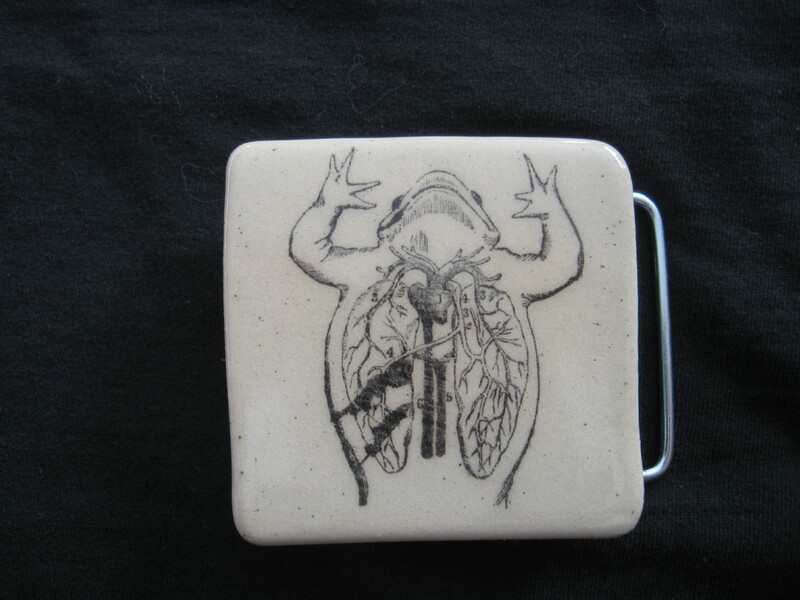 This bewitching belt buckle displays an anatomical frog open for your perusal. 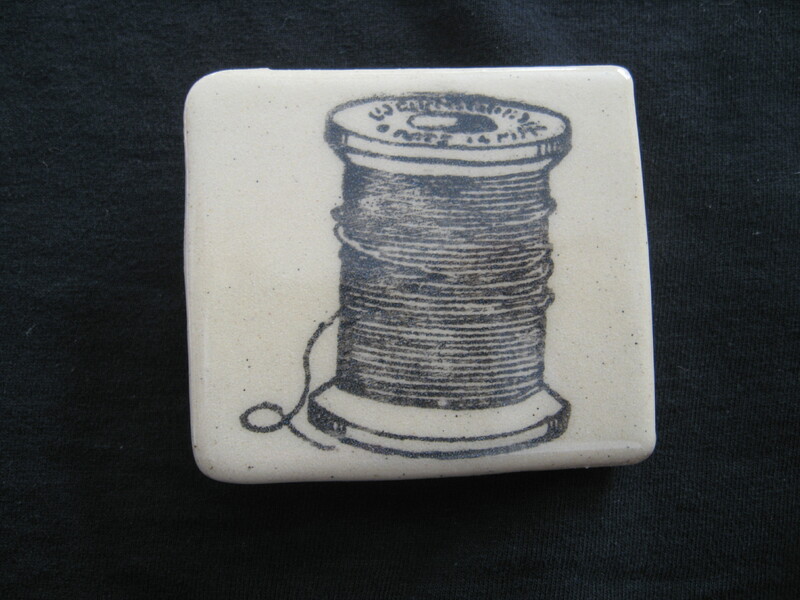 This bewitching belt buckle displays a spool of thread. 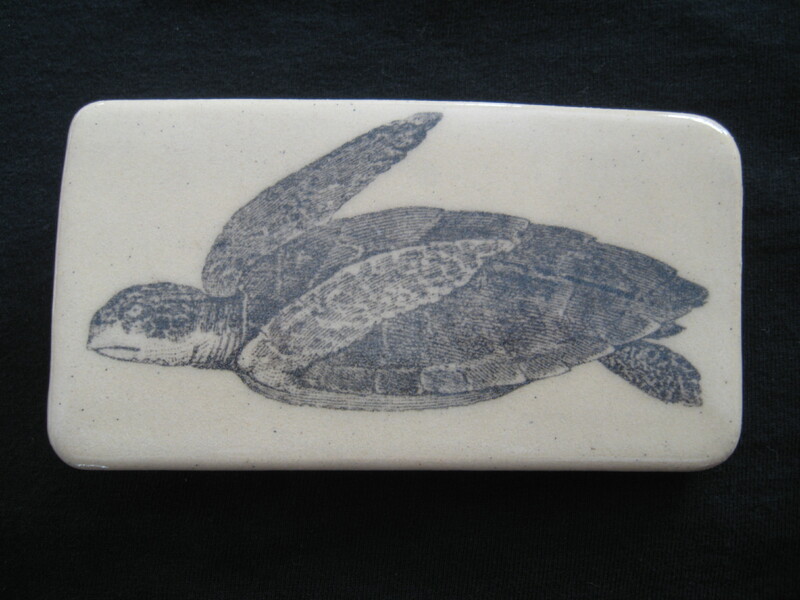 This bewitching belt buckle displays a grouchy sea turtle with a frowny face. 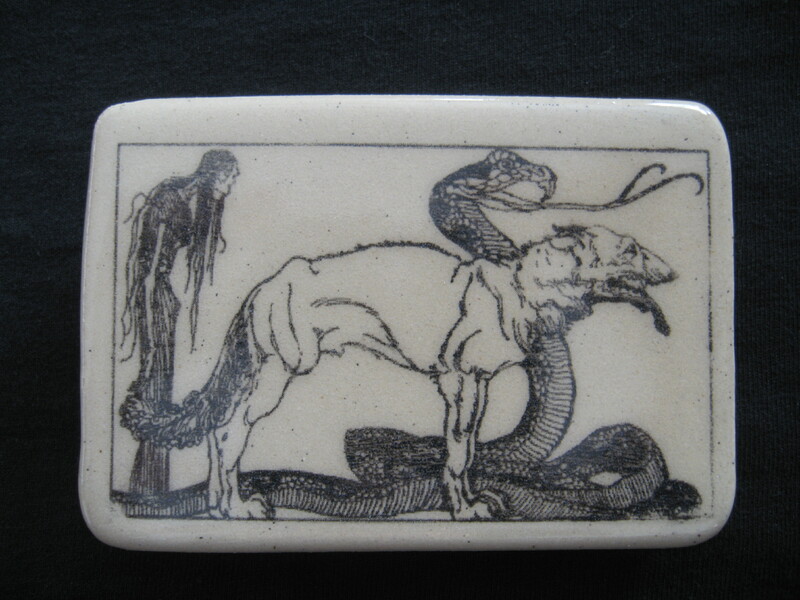 This bewitching belt buckle displays the Norse God Loki and his characteristic lupine and serpentine friends. 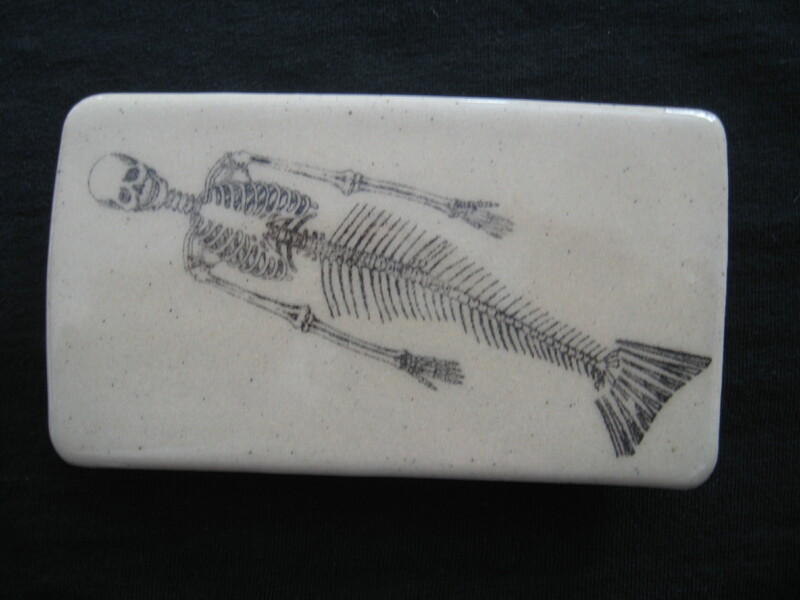 This bewitching belt buckle has captured a merskeleton swimming on your belly. 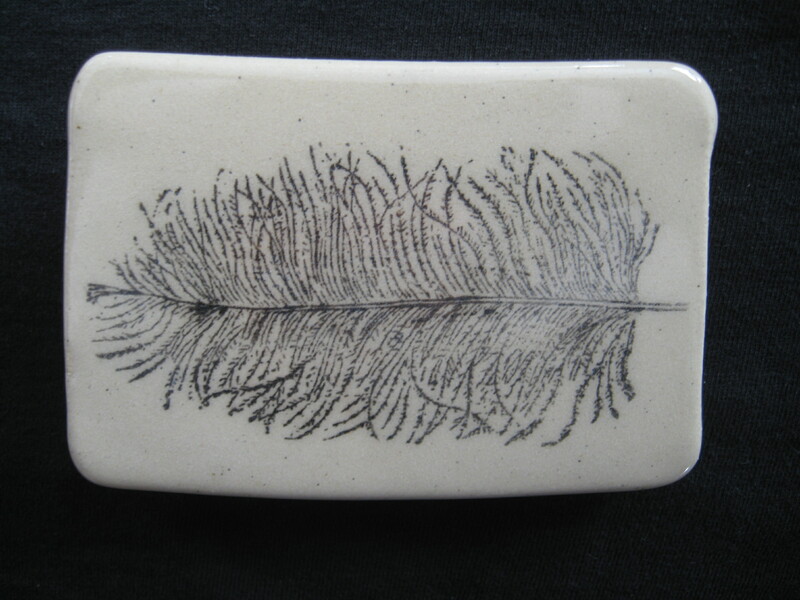 This bewitching belt buckle displays a plumed feather gently swaying in the breeze. 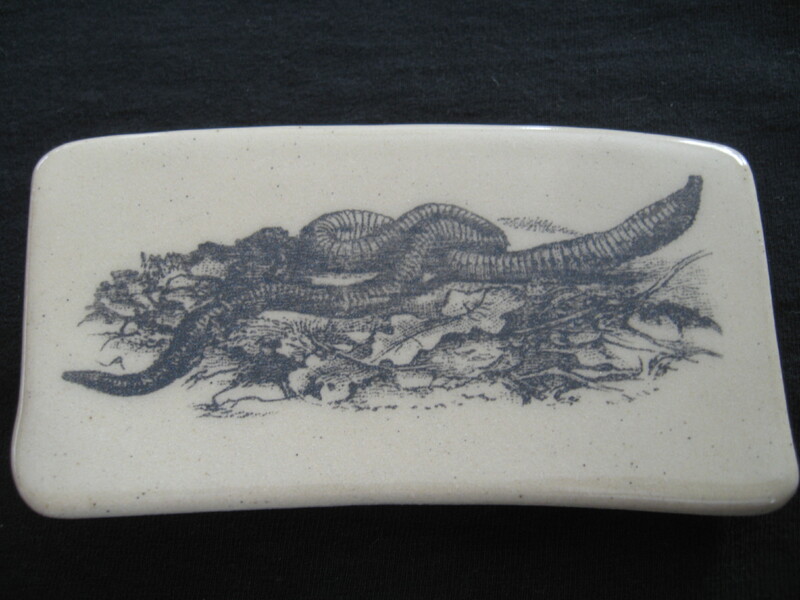 This bewitching belt buckle displays a wriggly little worm basking in the soil and leaves. 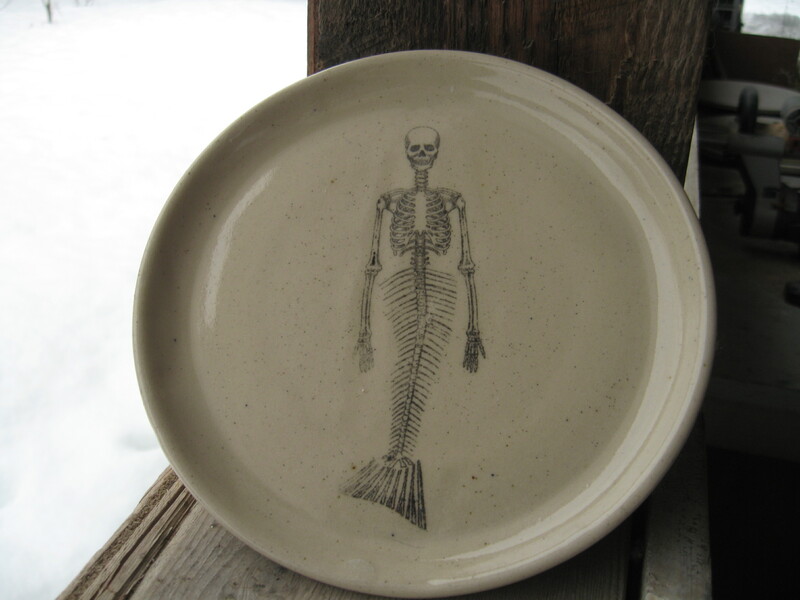 This marvelous mug displays a little merperson skeleton. 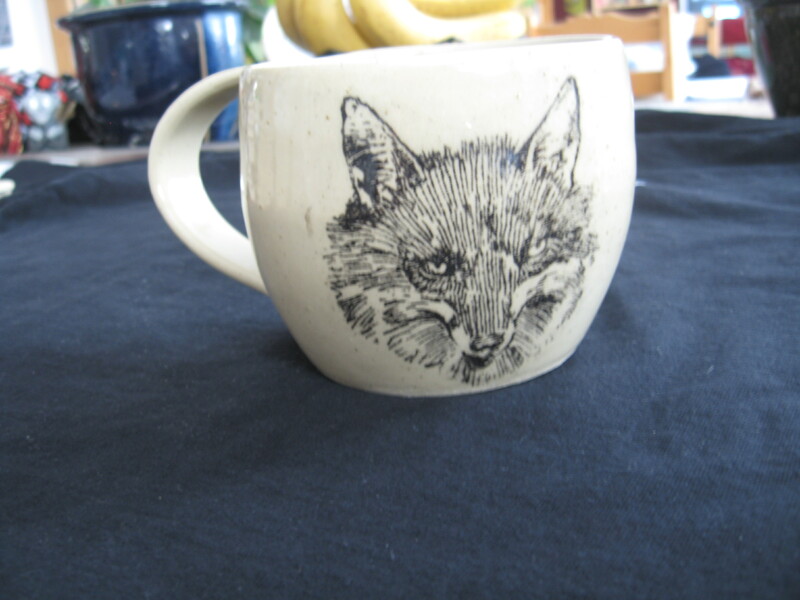 This marvelous mug is adorned with a sneaky little fox head…sly little bugger. 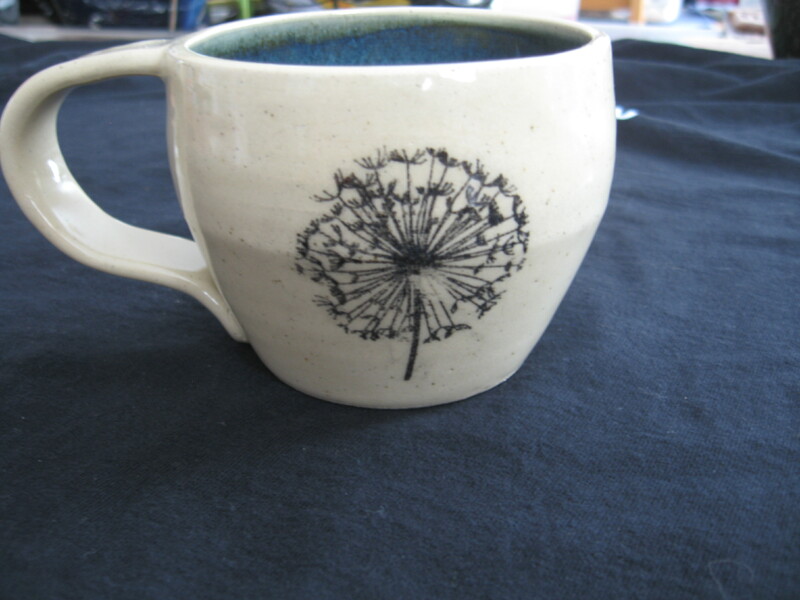 This marvelous mug is adorned with a dandelion puff. 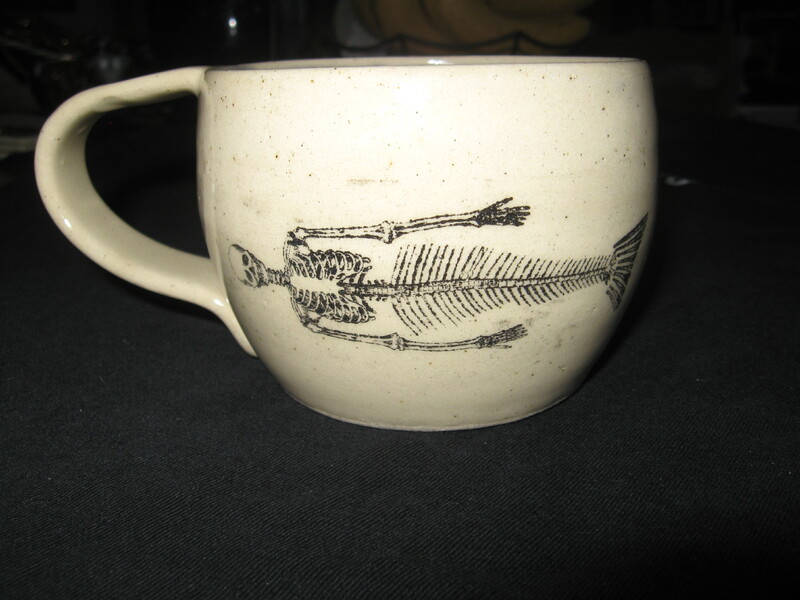 This marvelous mug is luxuriously wrapped in a merman skeleton. 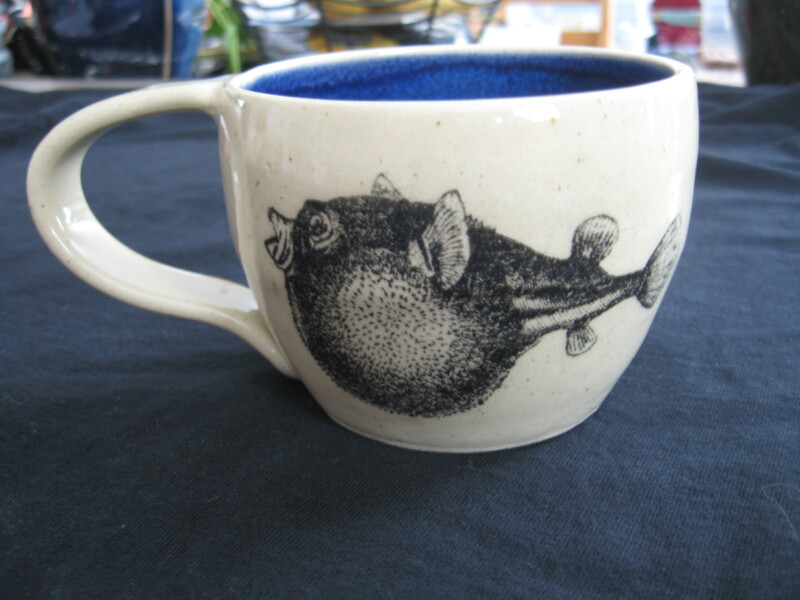 This marvelous mug displays a sly little puffer fish puff, puff, puffing away. 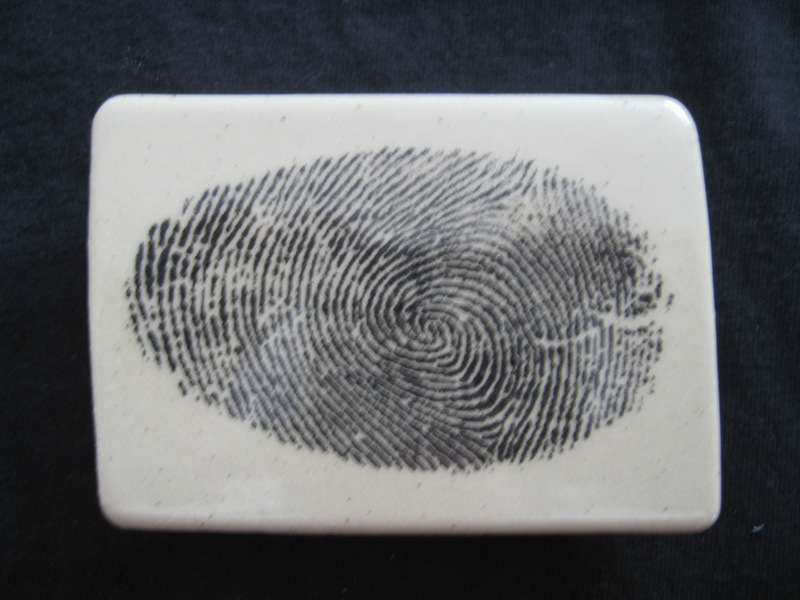 This bewitching belt buckle displays a large fingerprint. 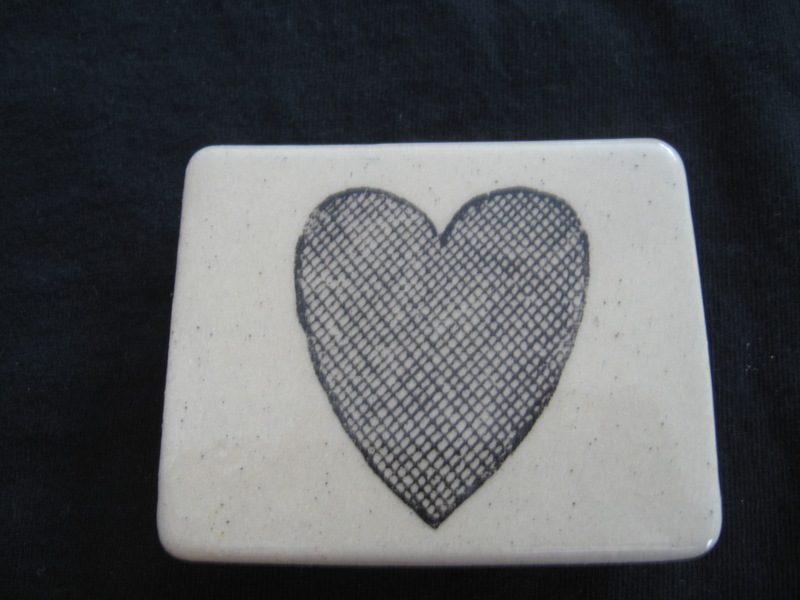 A fine crosshatched heart is burnished deep into this bewitching belt buckle. 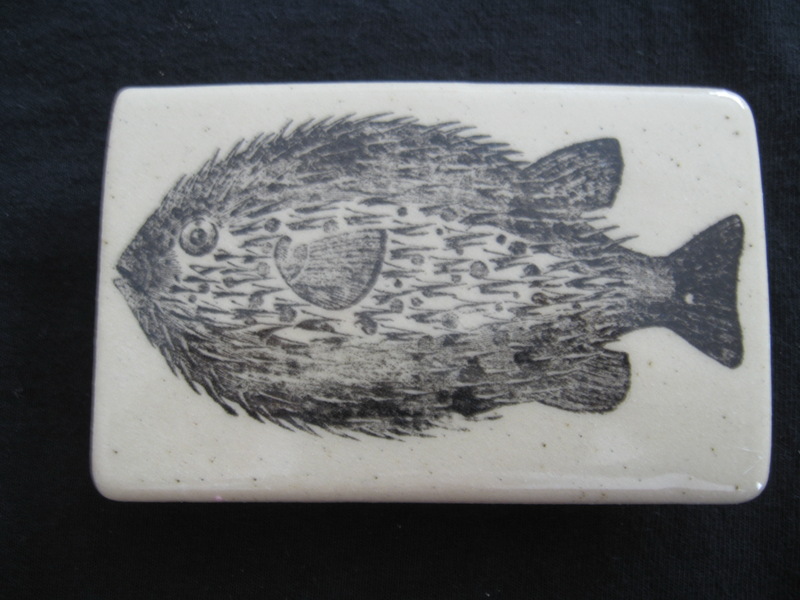 This bewitching belt buckle shows a puffer fish puff, puff, puffing along. 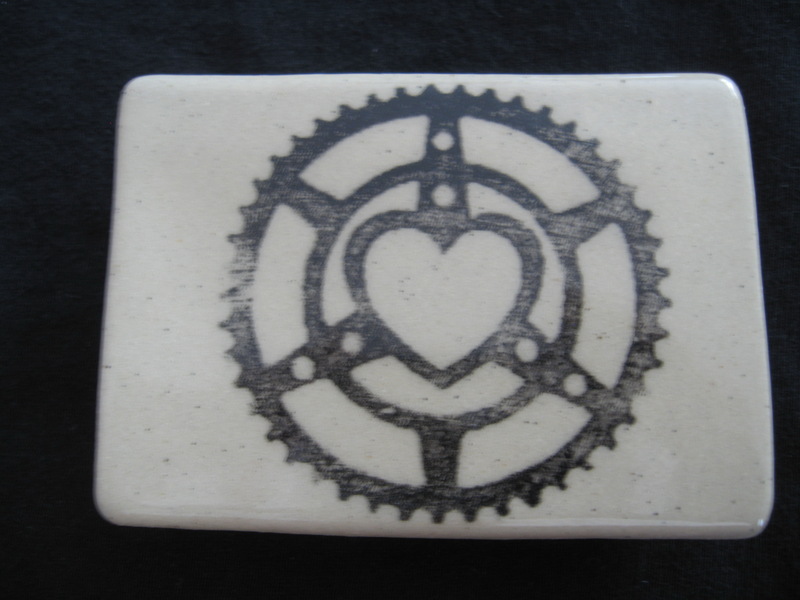 This bewitching belt buckle indicates a gear with a heart in the middle. 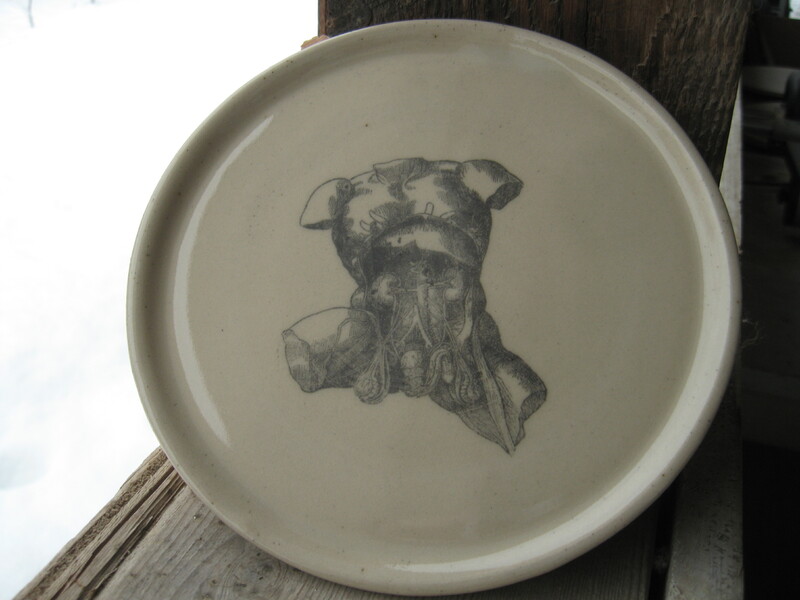 Mmm, robot love. 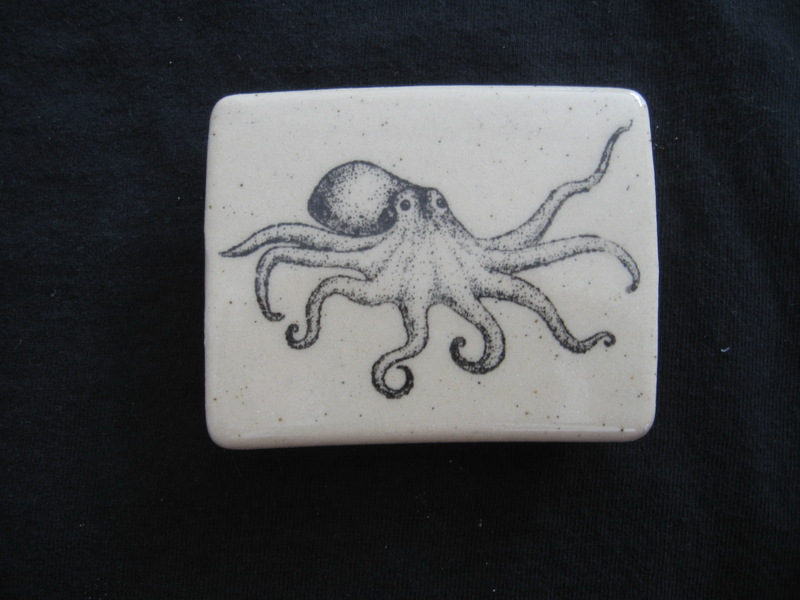 This bewitching belt buckle has an octopus gently creeping across its surface. 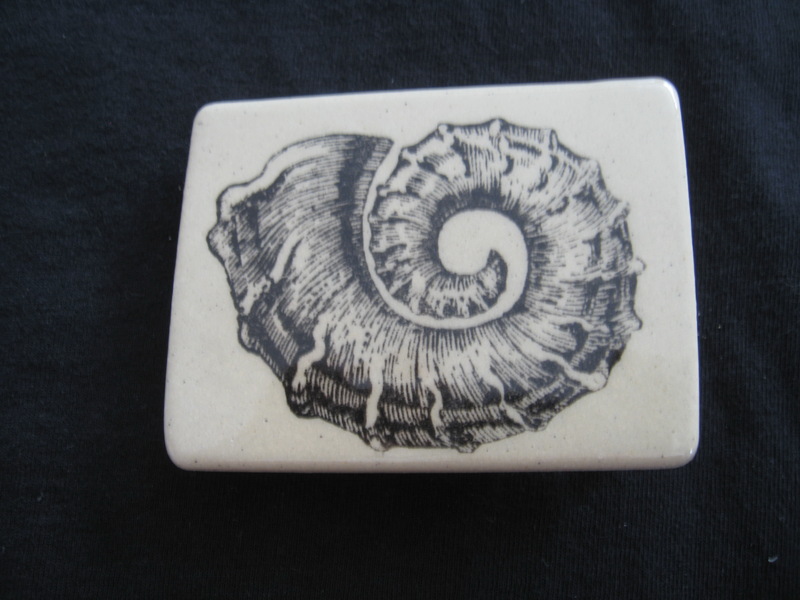 This bewitching belt buckle is adorned with a nautiloid in all its spiral glory. 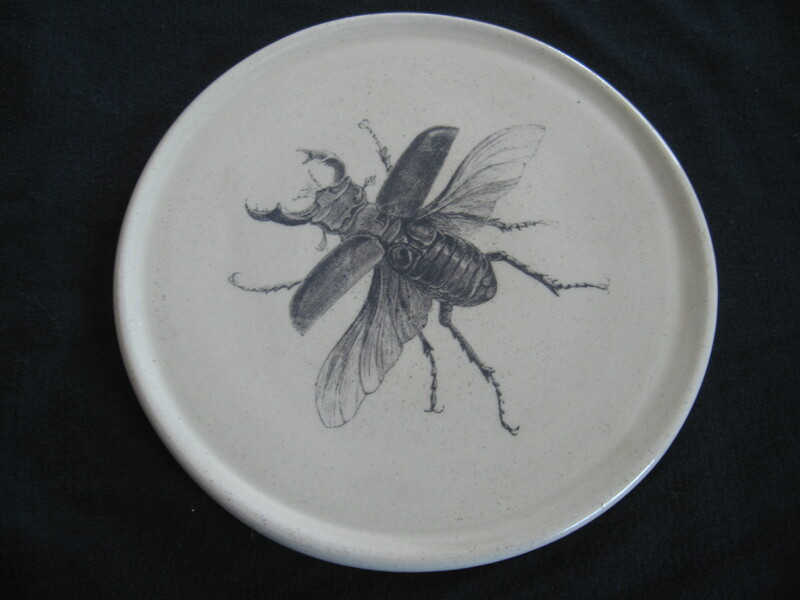 This bewitching buckle is graced with an open stag beetle ready to take flight. 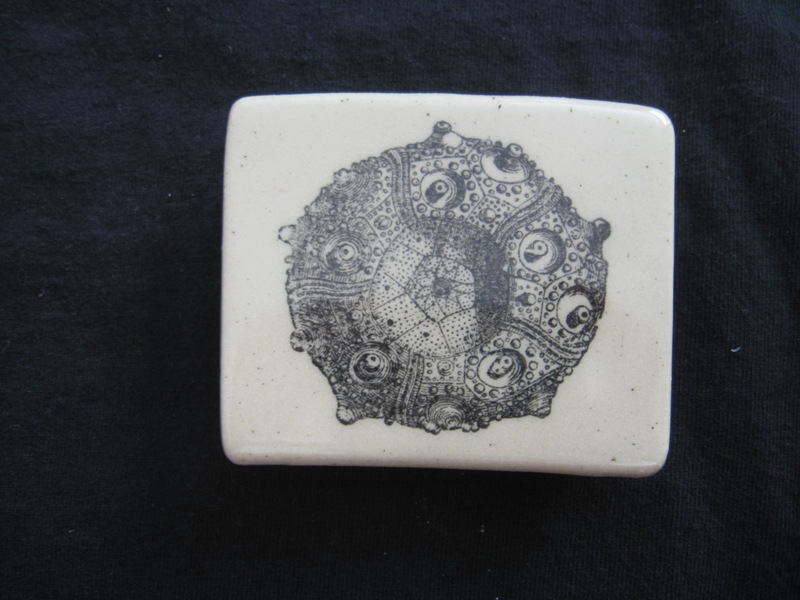 This bewitching buckle is graced with a detailed and delicate cidaris or pencil sea urchin. 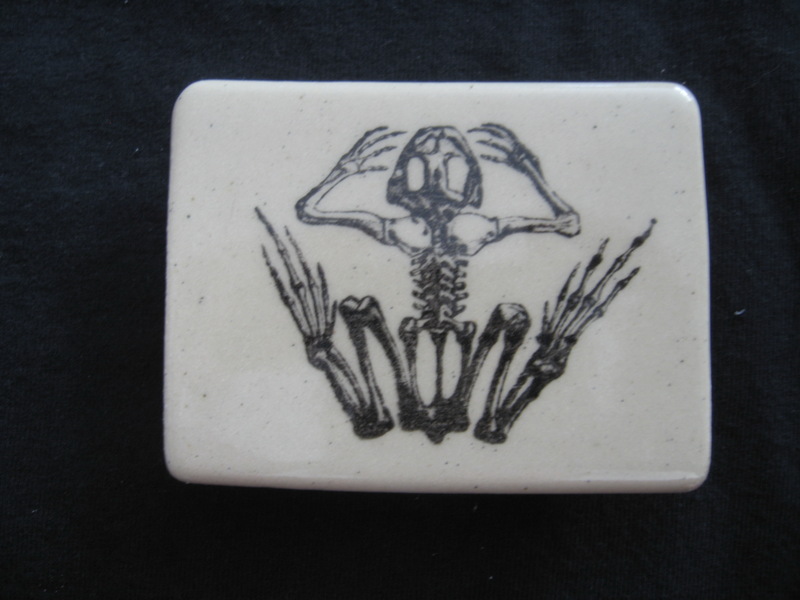 This bewitching buckle displays a beautiful frog skeleton. 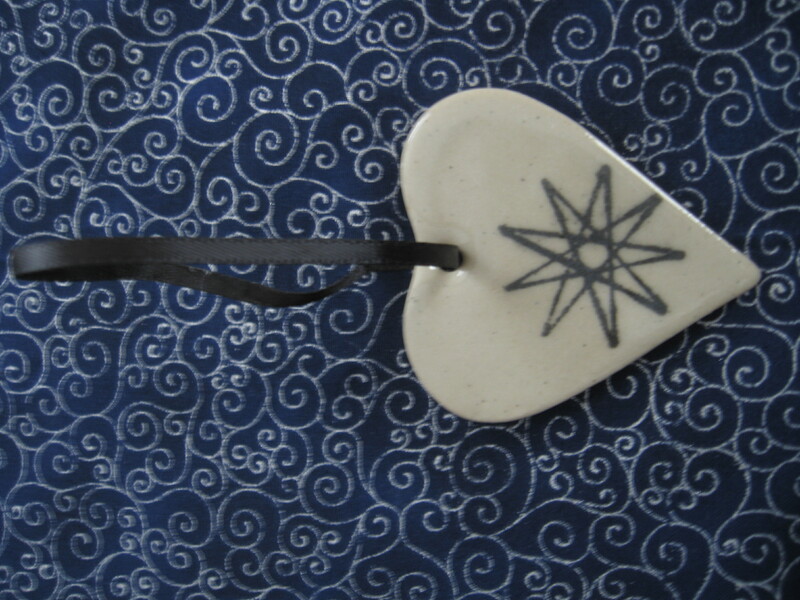 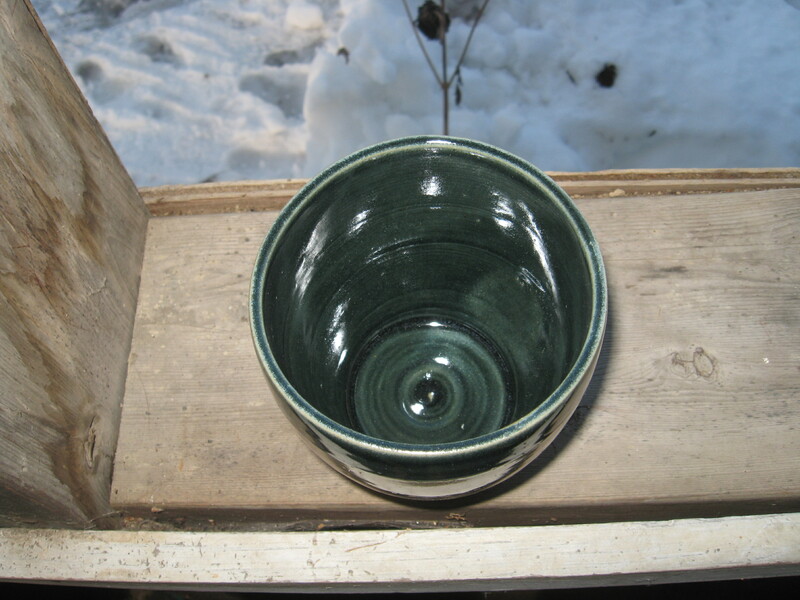 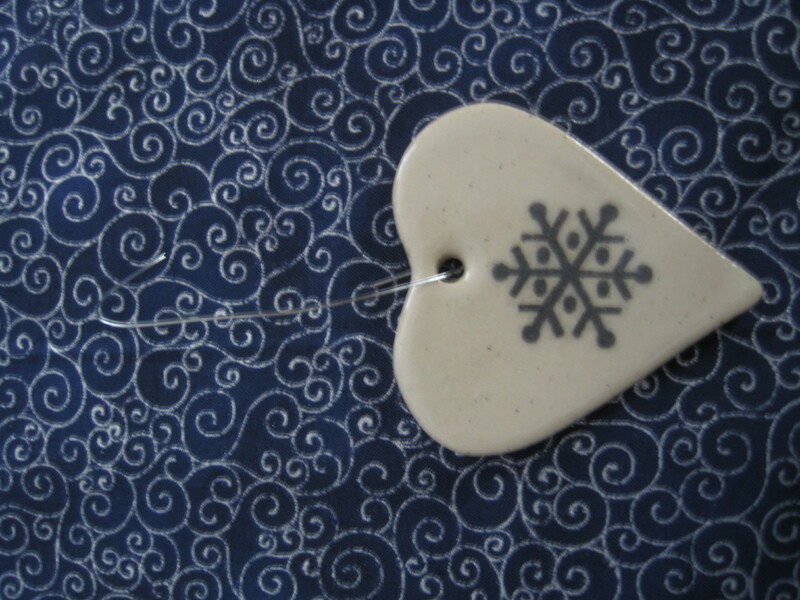 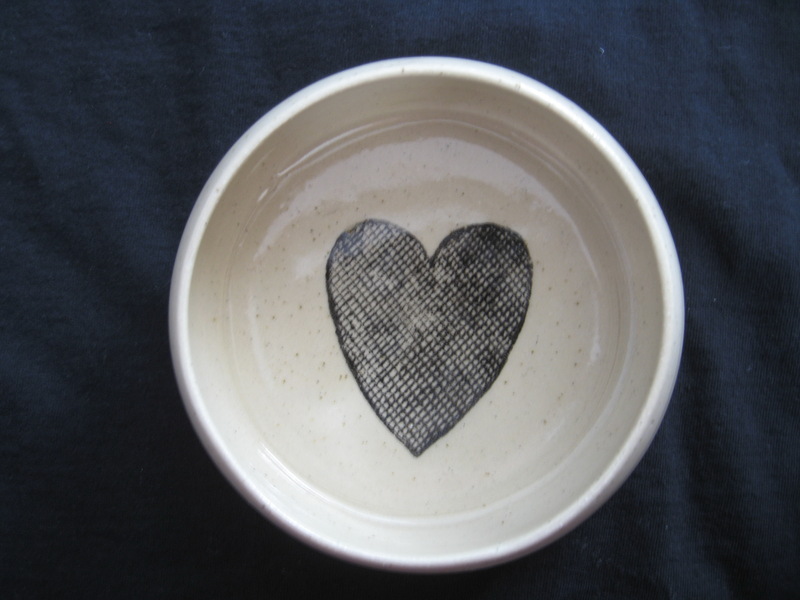 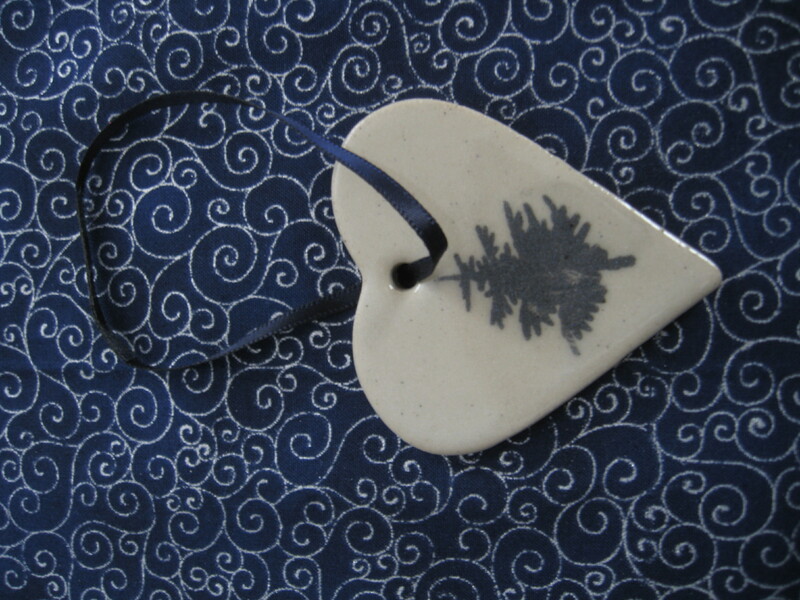 This large beautiful bowl illustrates a crosshatched heart. 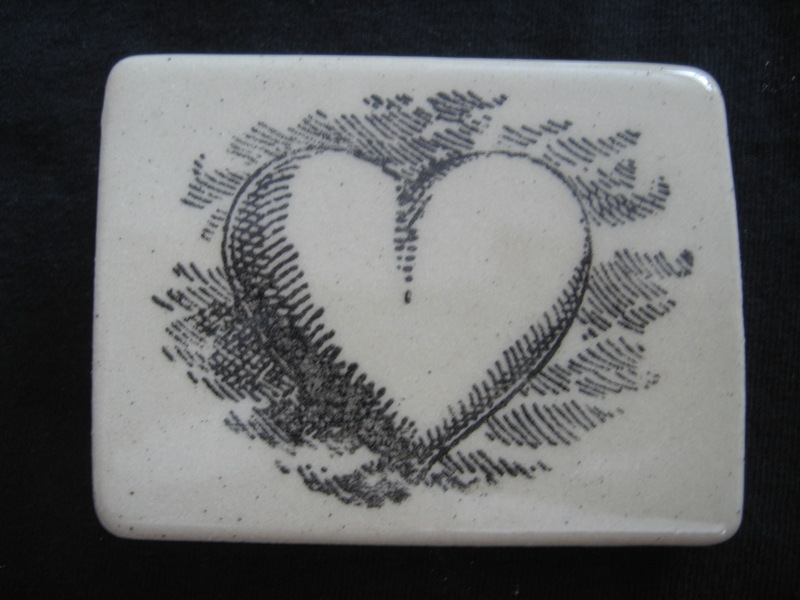 This bewitching belt buckle illustrates a shaded heart. 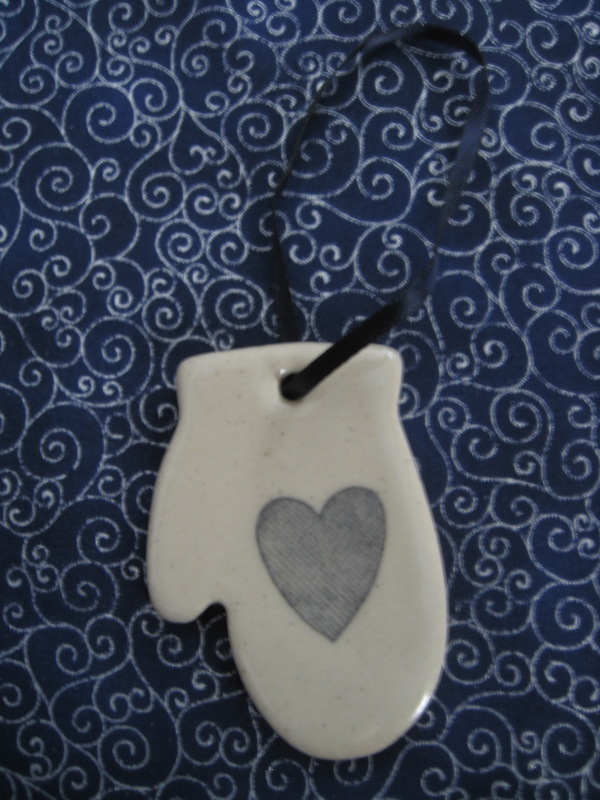 I choo-choo-choo-choose you. 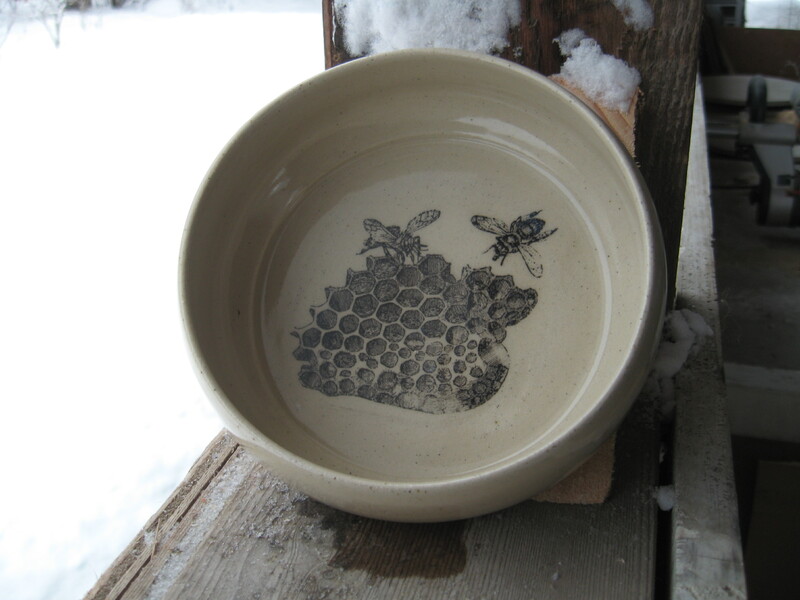 This beautiful bowl is graced with a honey comb and two hovering bees. 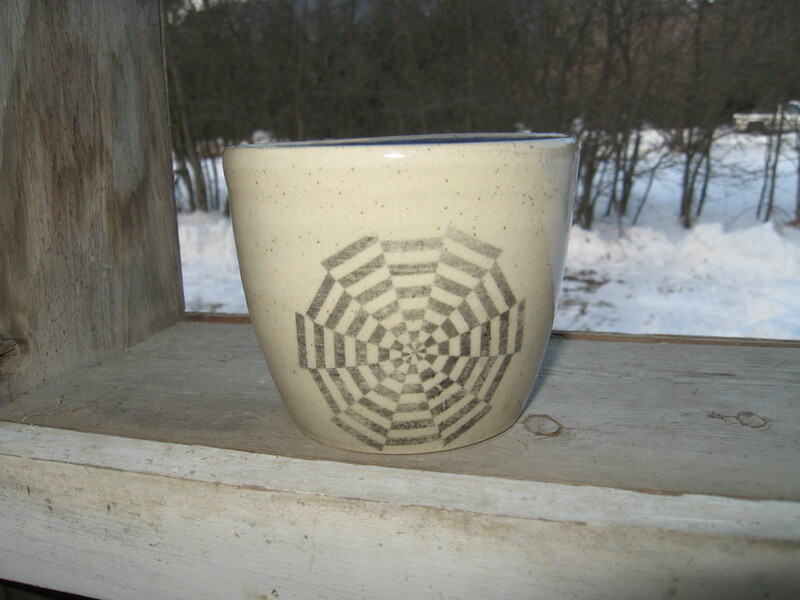 Mmmm, honey. 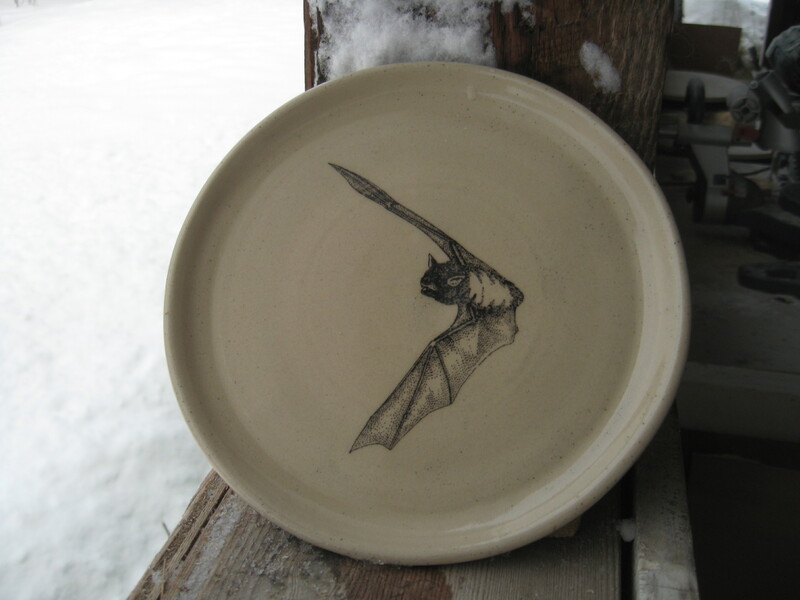 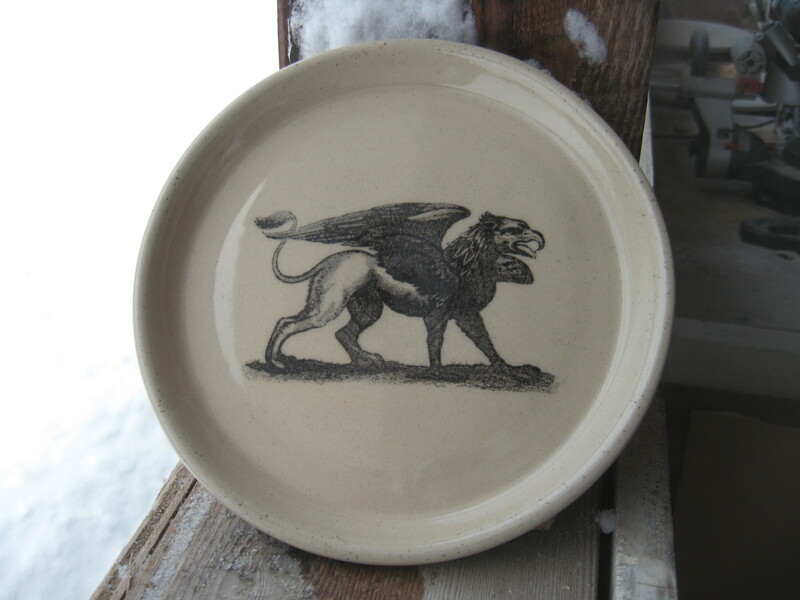 Here is a saucy gryphon protecting his precious plate…grrr. 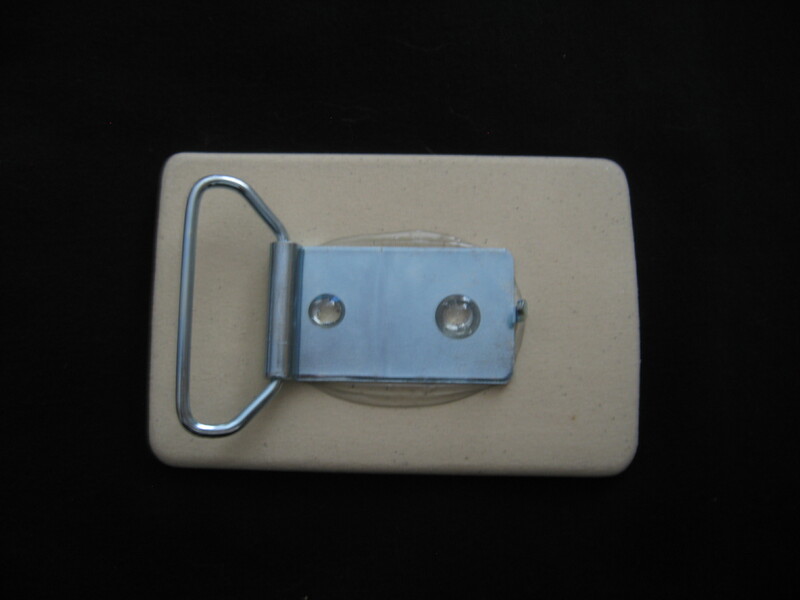 Arrr, here be the bewitching buckle that pleases me eyeballs. 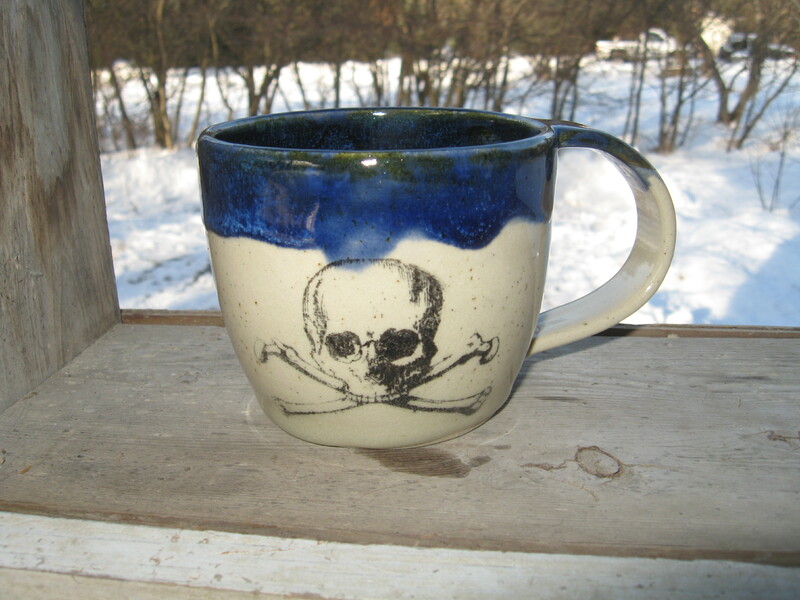 Jolly Roger tastiness. 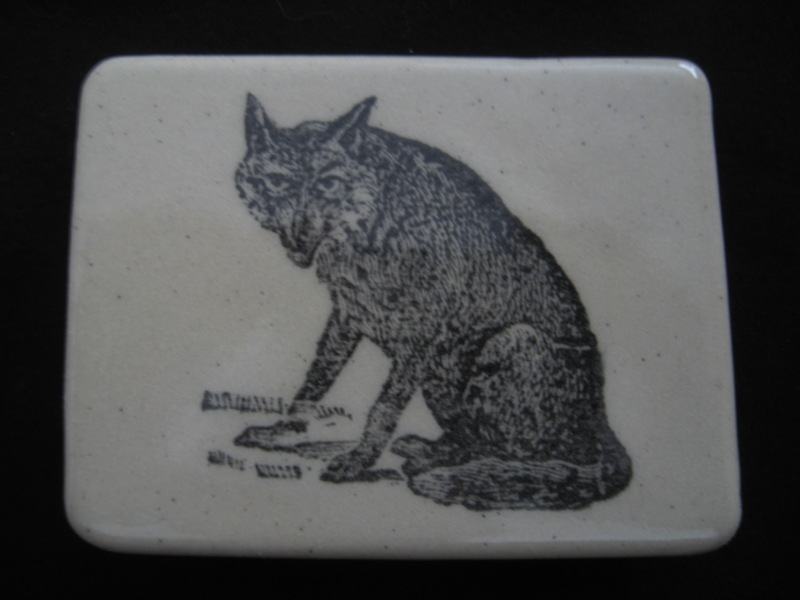 A foxy fox is waiting for you on this bewitching belt buckle. 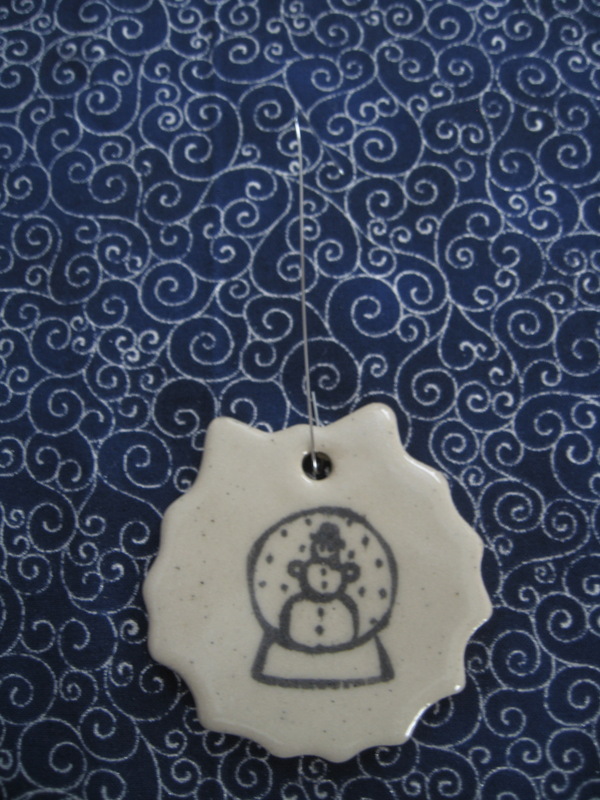 Silly little fox. 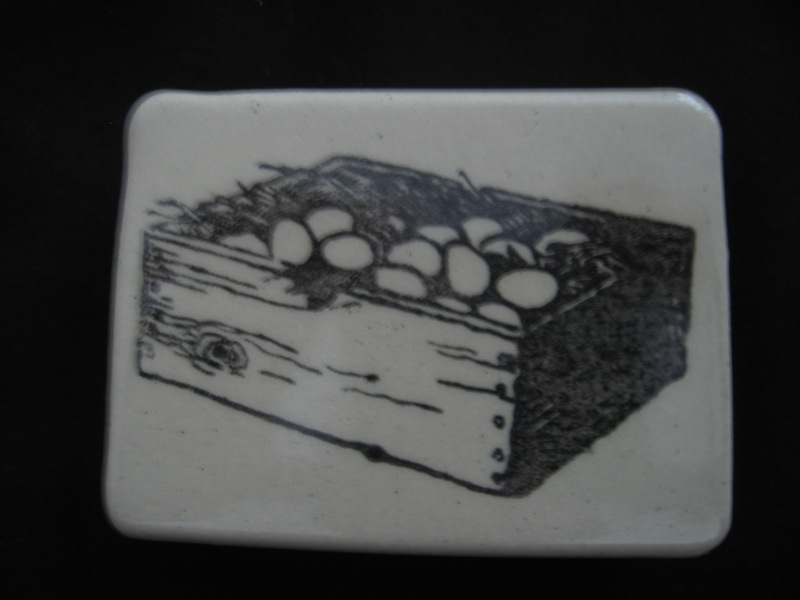 This bewitching buckle displays a box of fresh eggs for your enjoyment…or maybe just because you with you were the Egg Man – coo coo catchoo. 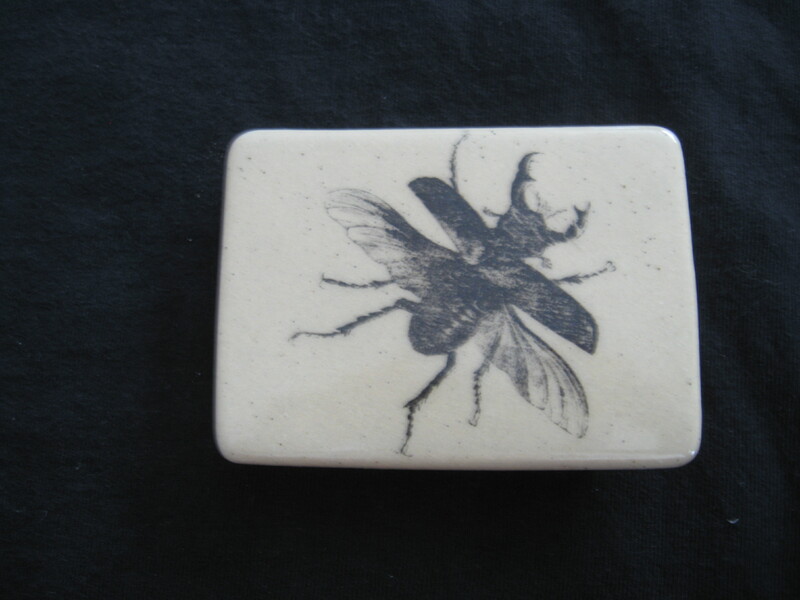 This wee little Bumble Bee has graciously offered to adorn this bewitching belt buckle. 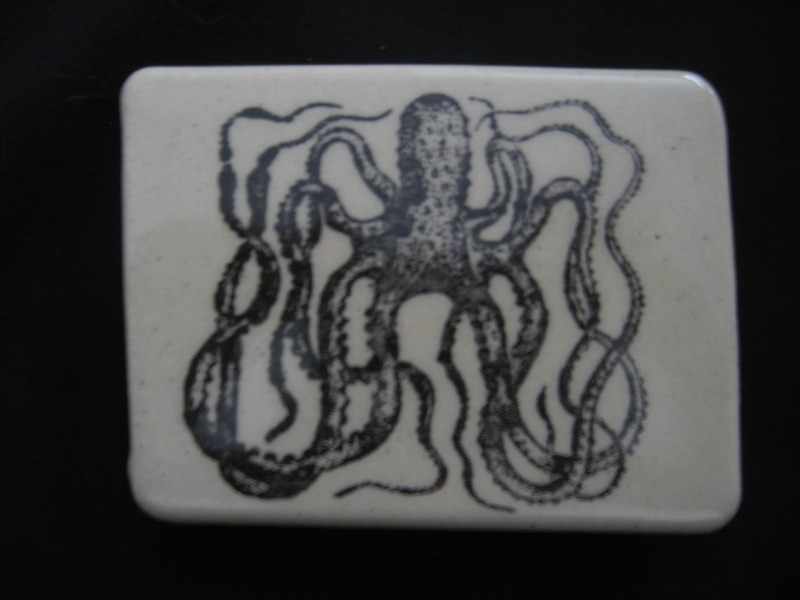 This bewitching belt buckle has confined a tightly wrapped octopus. 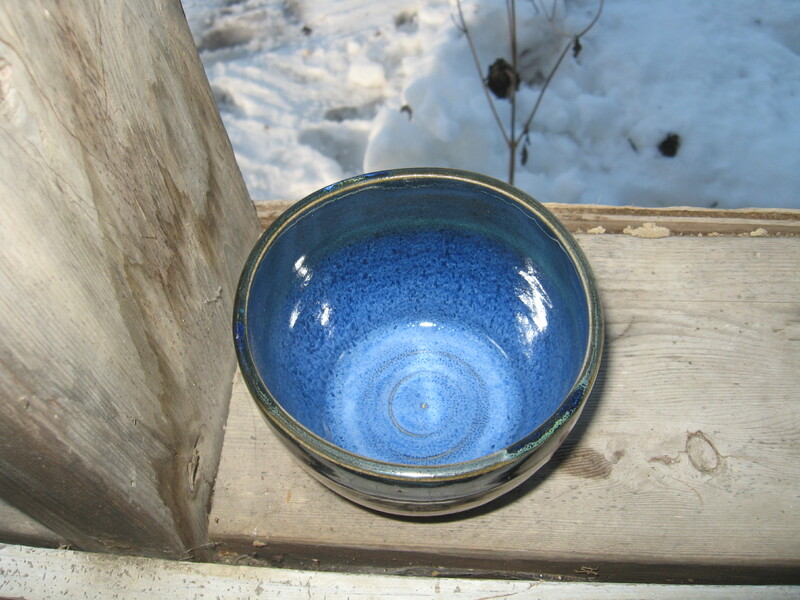 Unfortunately, the high gloss of the surface glaze makes it almost impossible to capture a clear, crisp image. 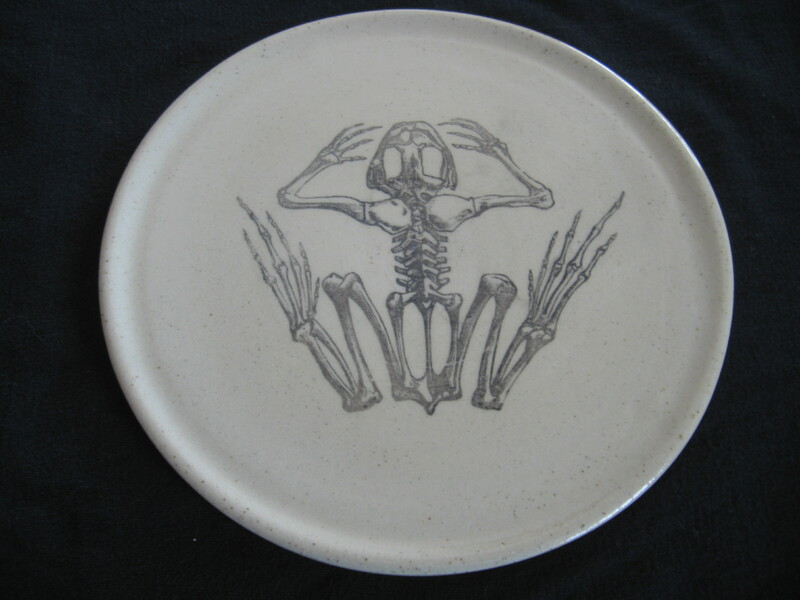 Grrrr. 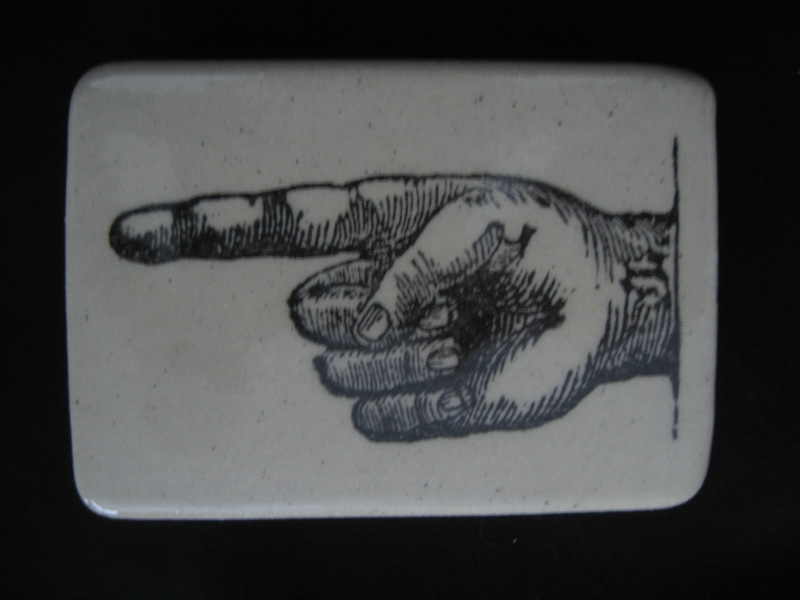 This bewitching buckle displays a pointing hand…this way, bub. 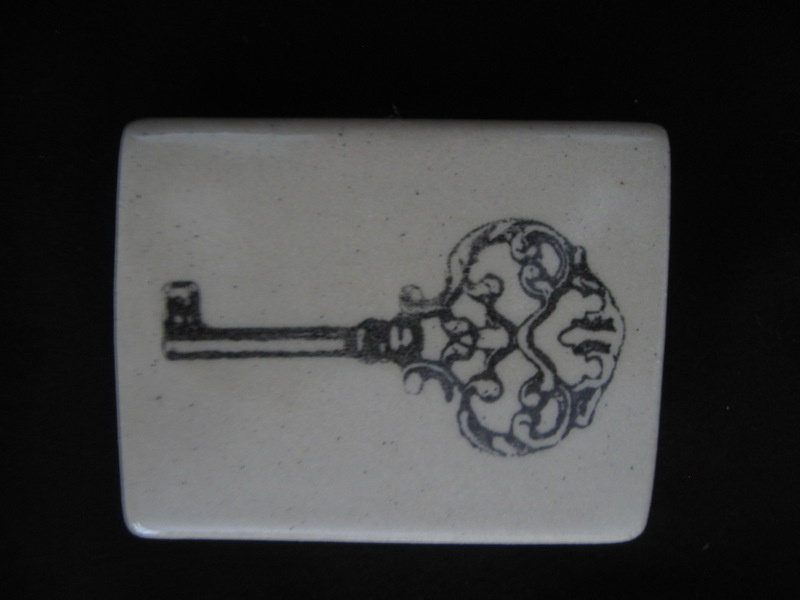 This bewitching belt buckle illustrates an ornate key. 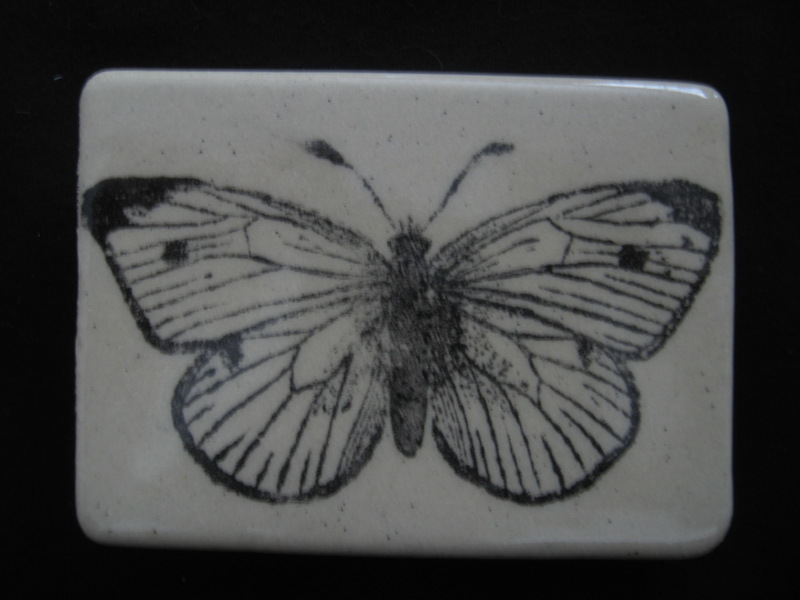 This bewitching belt buckle has captured a butterfly on it’s surface. 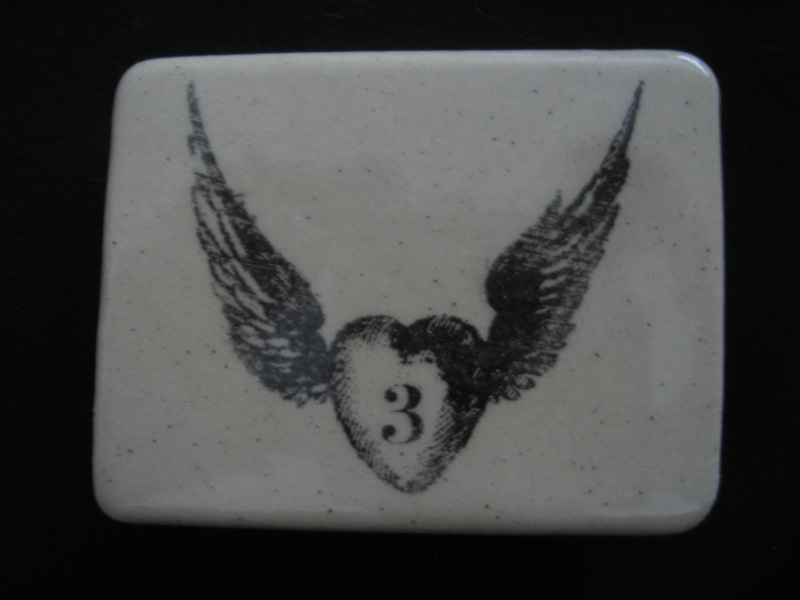 This bewitching belt buckle is adorned with a heart with wings and the number 3. 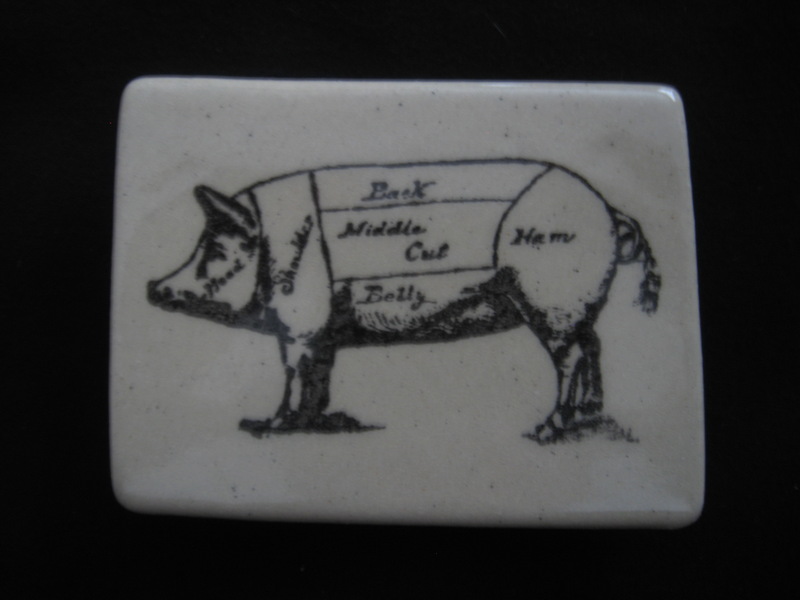 This bewitching buckle is graced with a piggy off to the market. 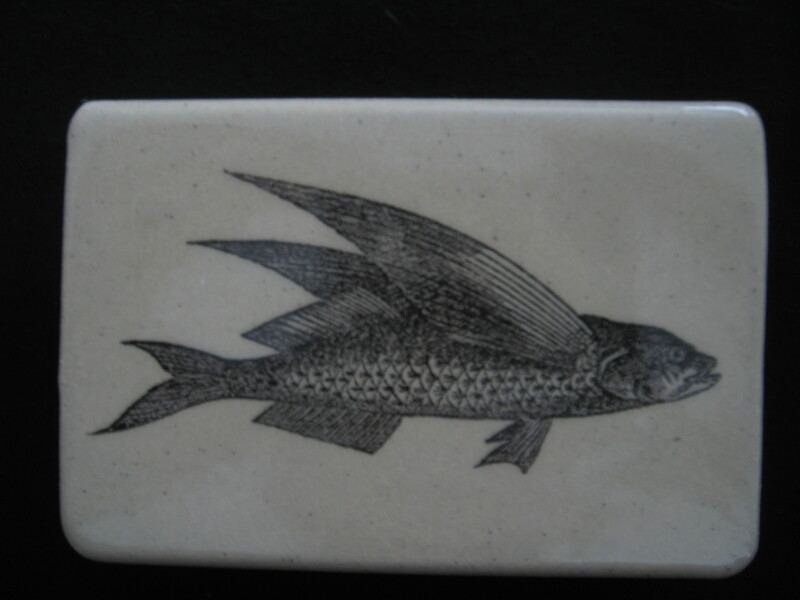 This bewitching belt buckle displays a flying fish. 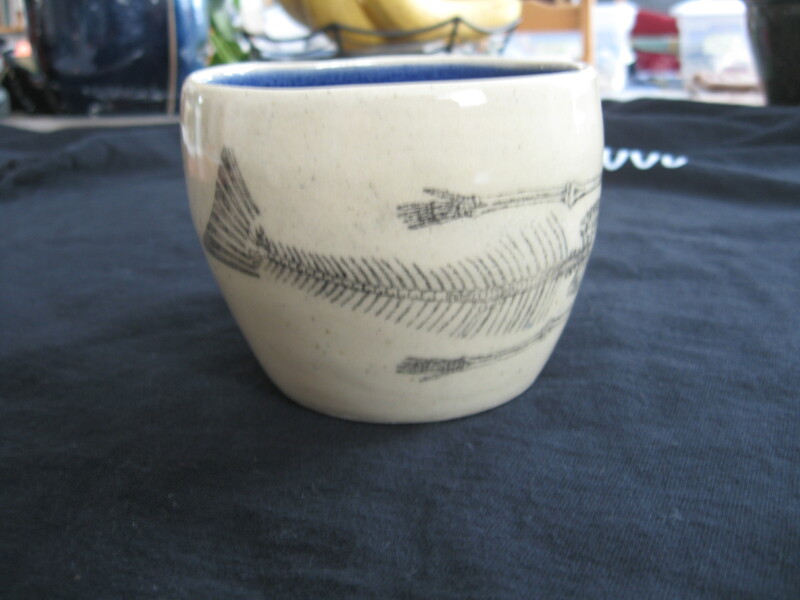 There is some reflection in this image that I could not eliminate; therefore, the fish image does not actually have white shadows on it. 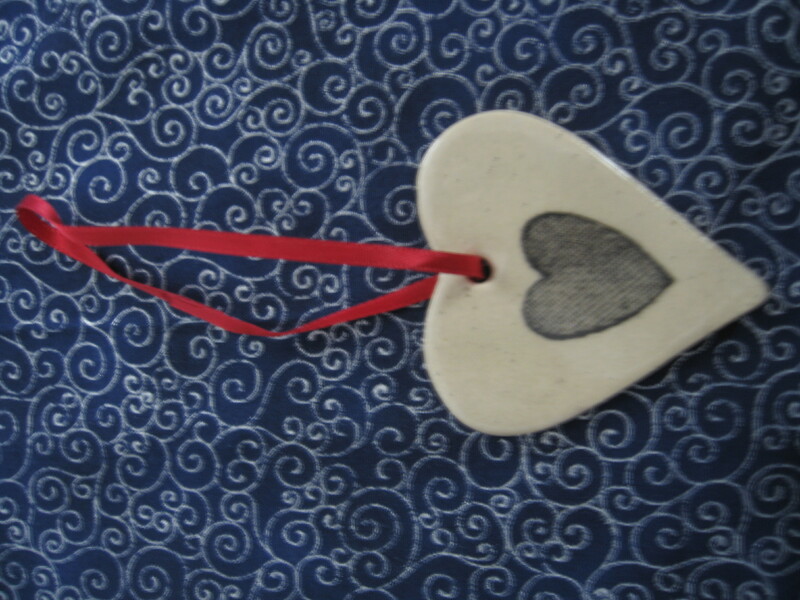 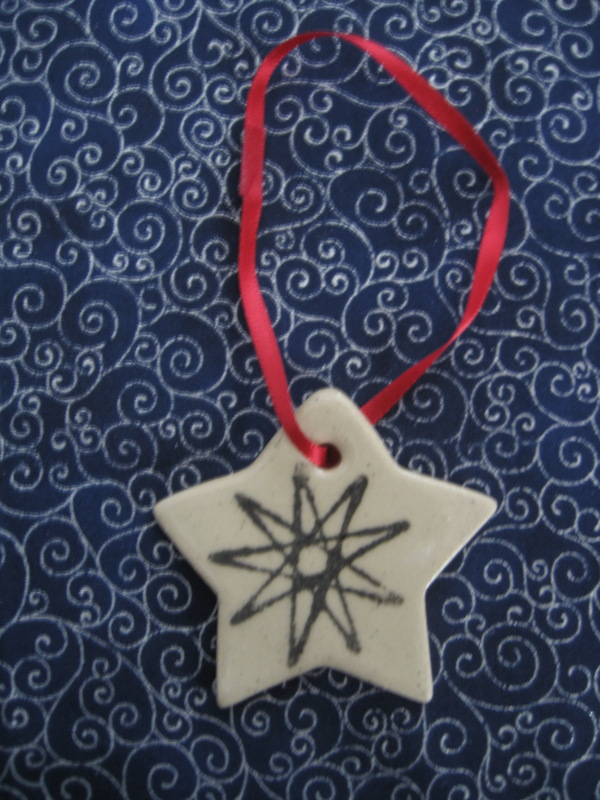 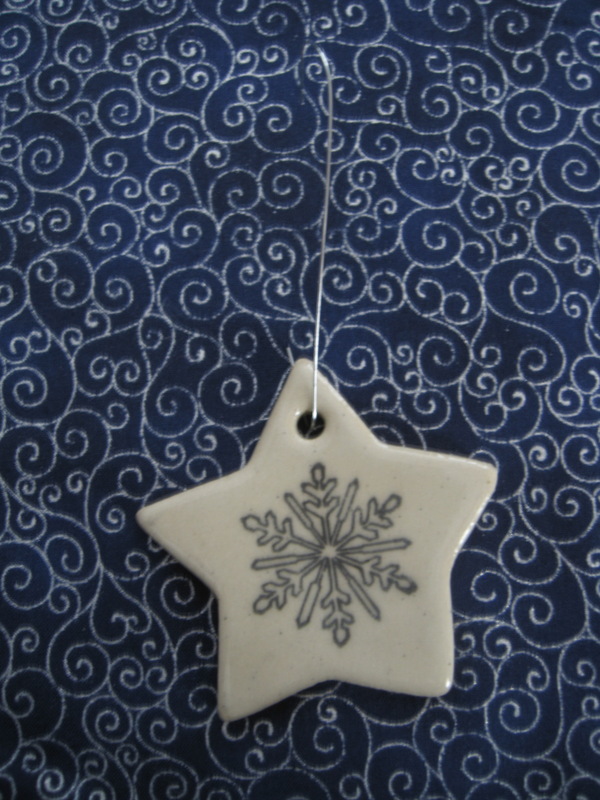 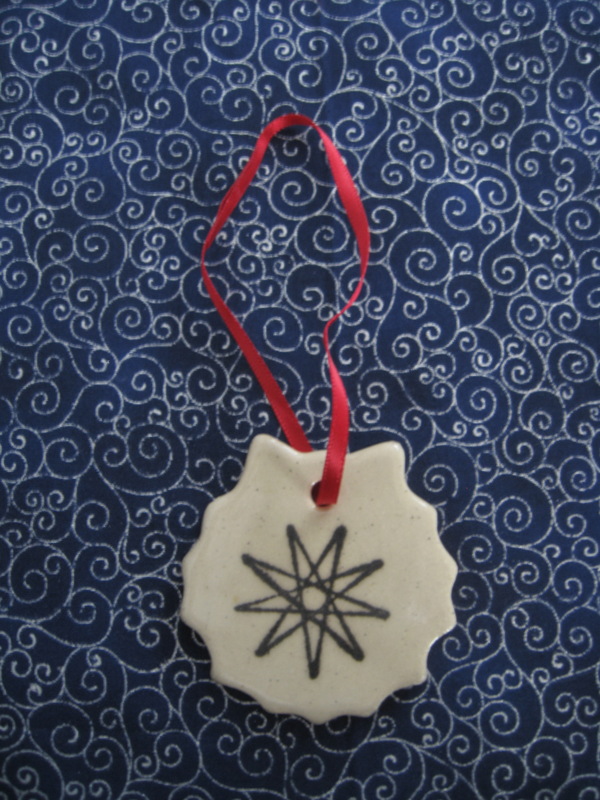 As with all decorations, each one will come with a ribbon, in the colour of your choosing, or a silver hook. 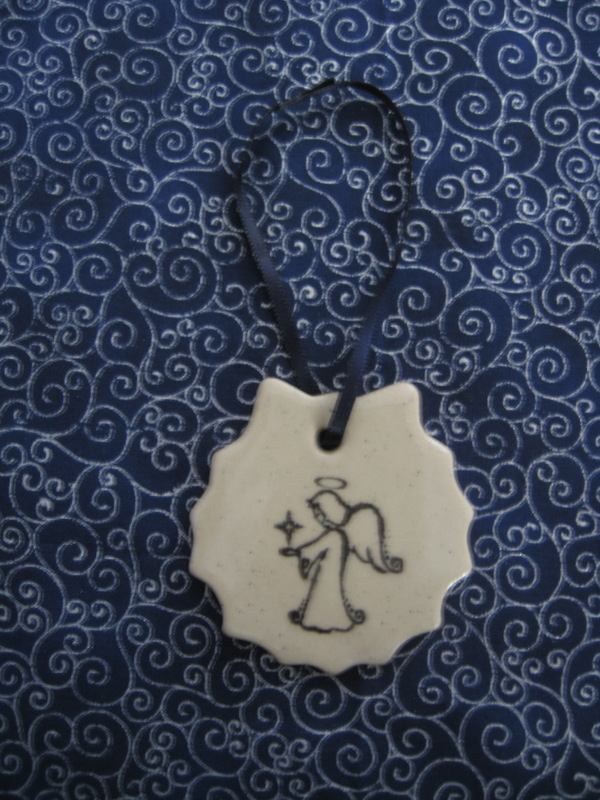 Also, you may choose any image to place on any decoration. 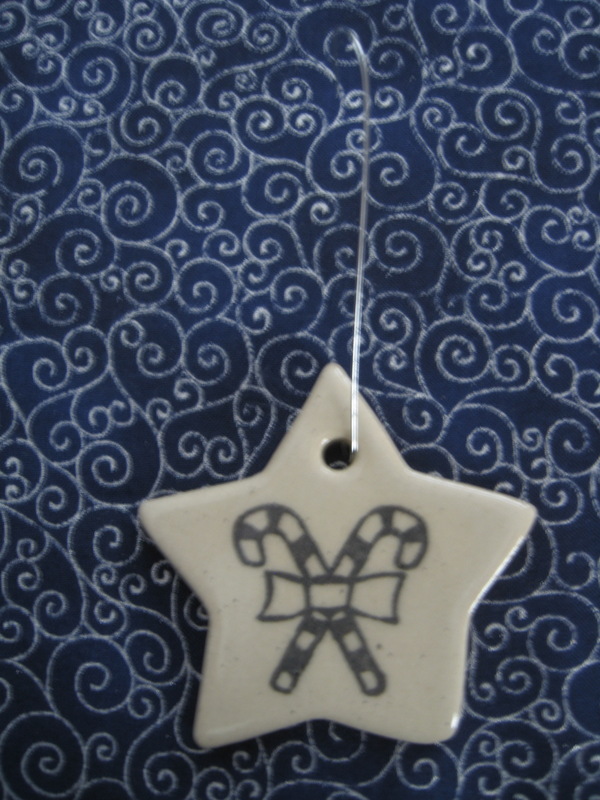 As with all decorations, you have the choice of a ribbon, in the colour of your choosing, or a silver hook as accoutrement. 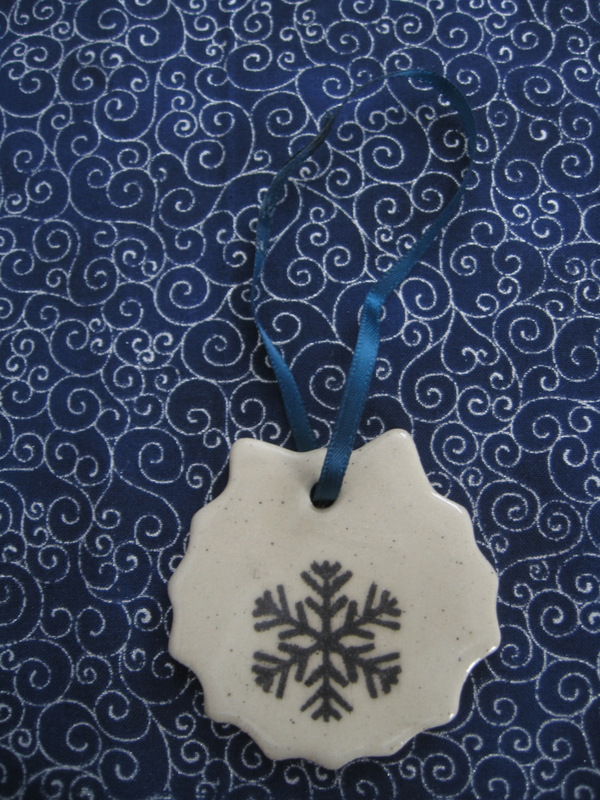 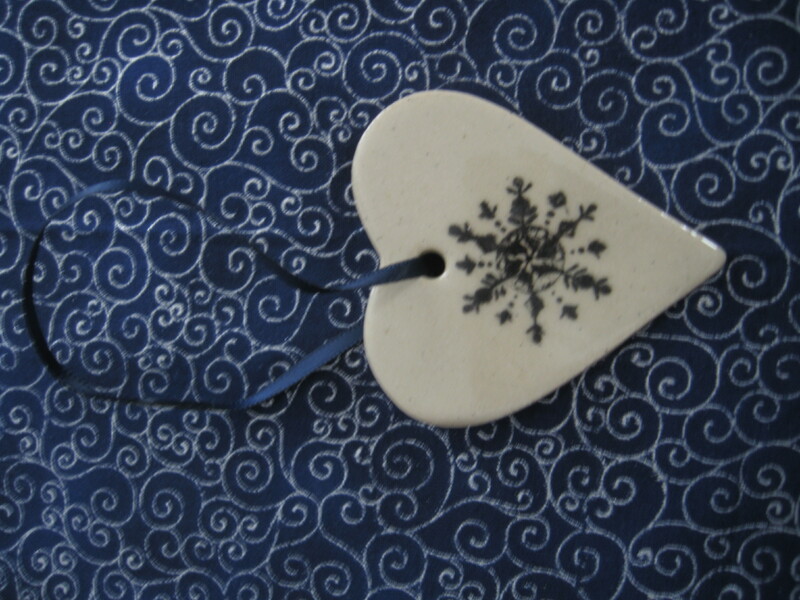 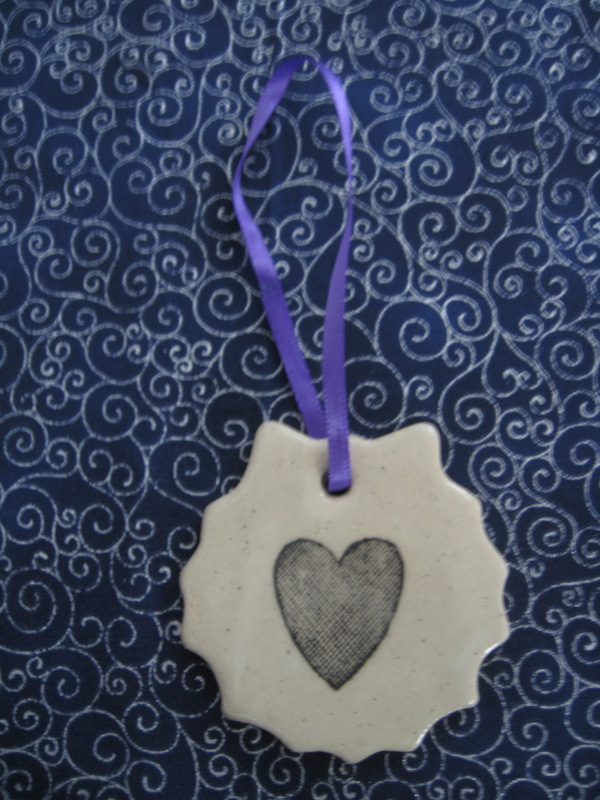 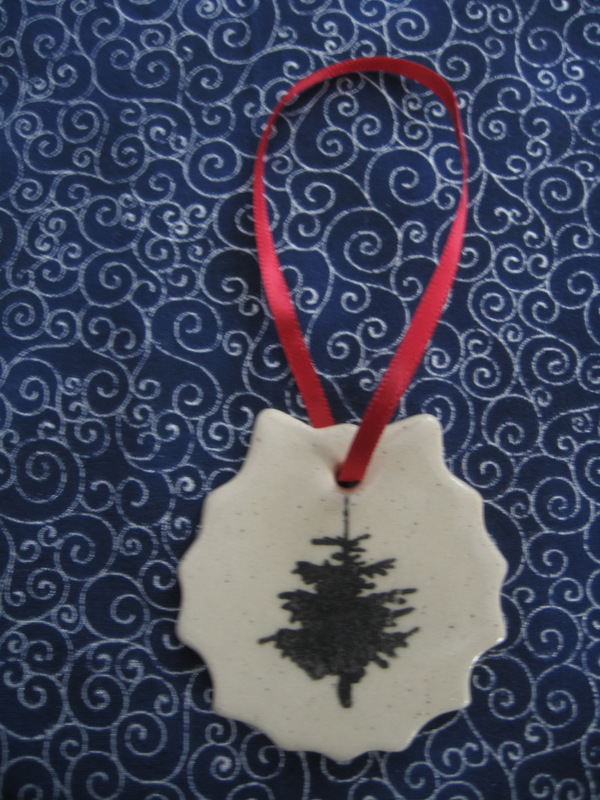 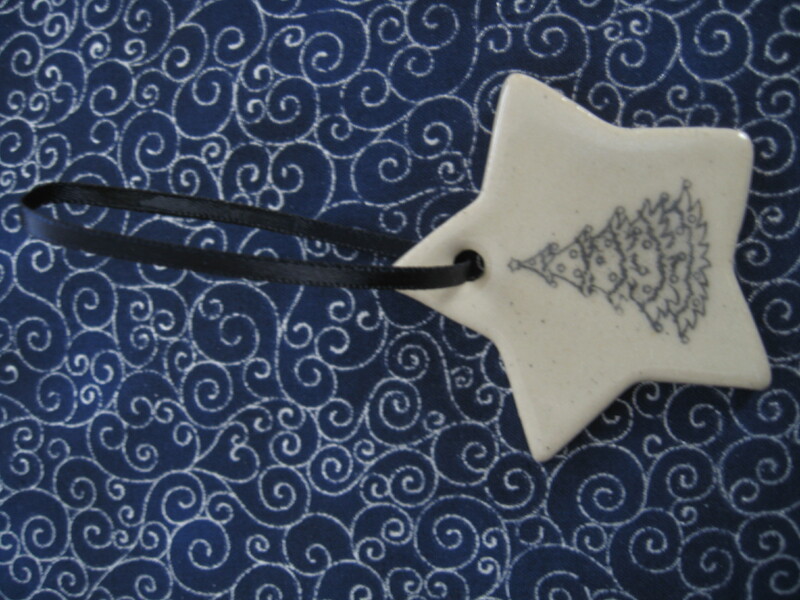 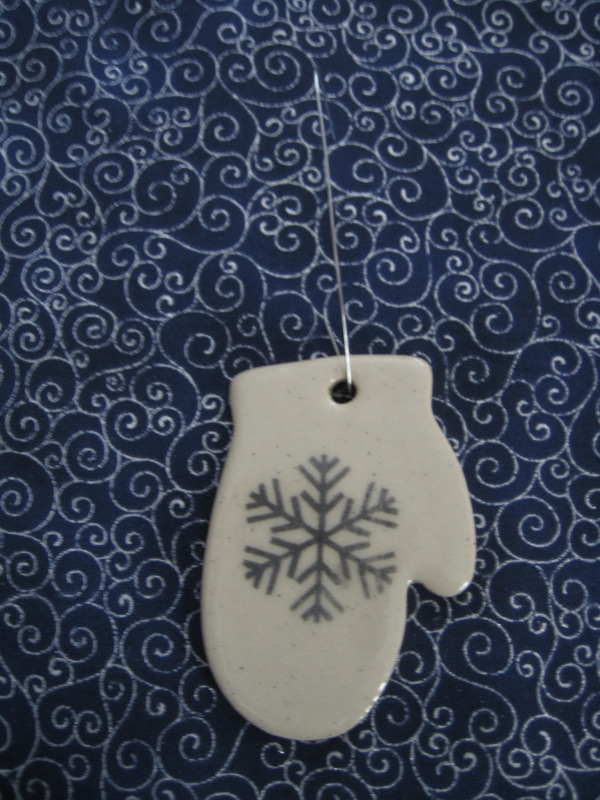 Also, all decorations can be made with the image of your choice. 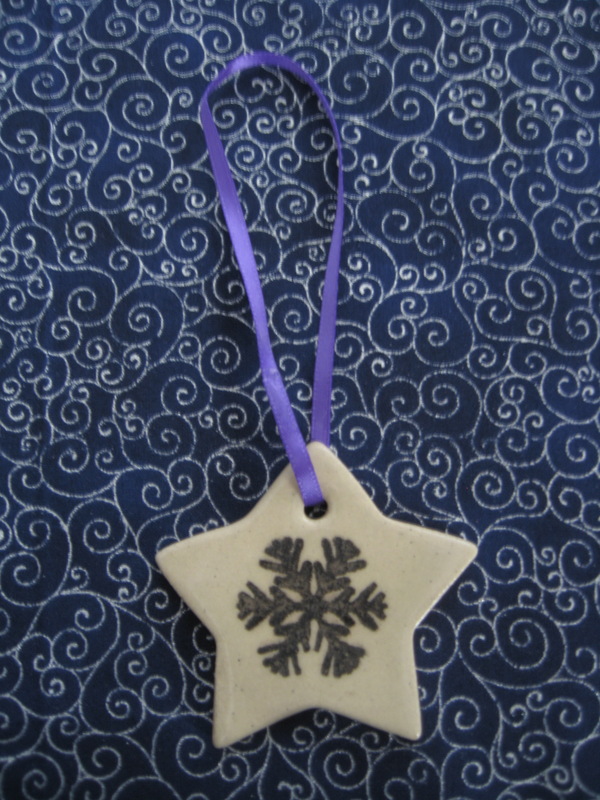 All seasonal decorations come with either a ribbon, in the colour of your choosing, or a silver hook. 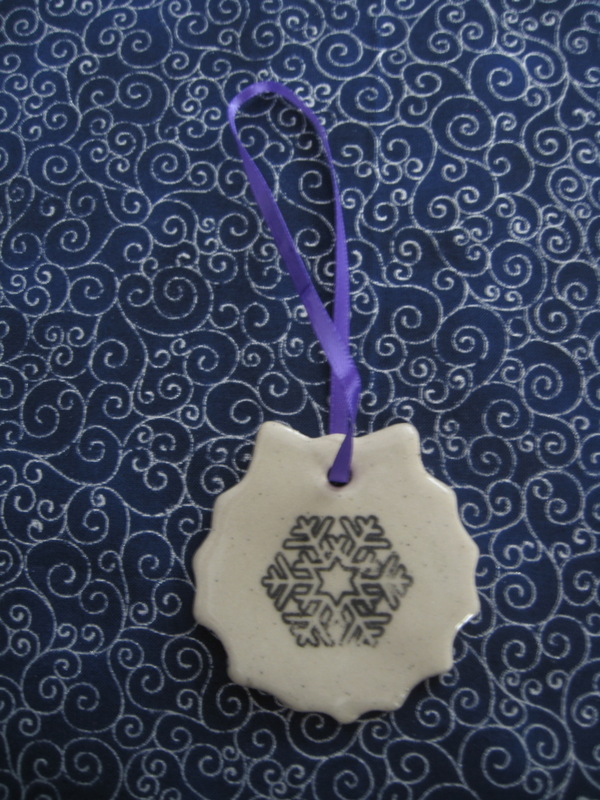 Remember, any decoration shape can be made with any image. 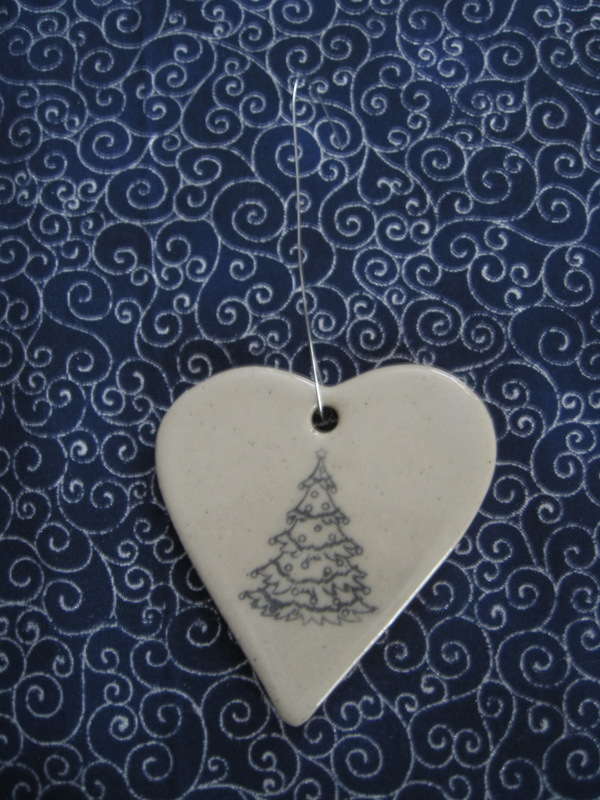 All decorations come with either ribbon, in the colour of your choosing, or a silver hook. 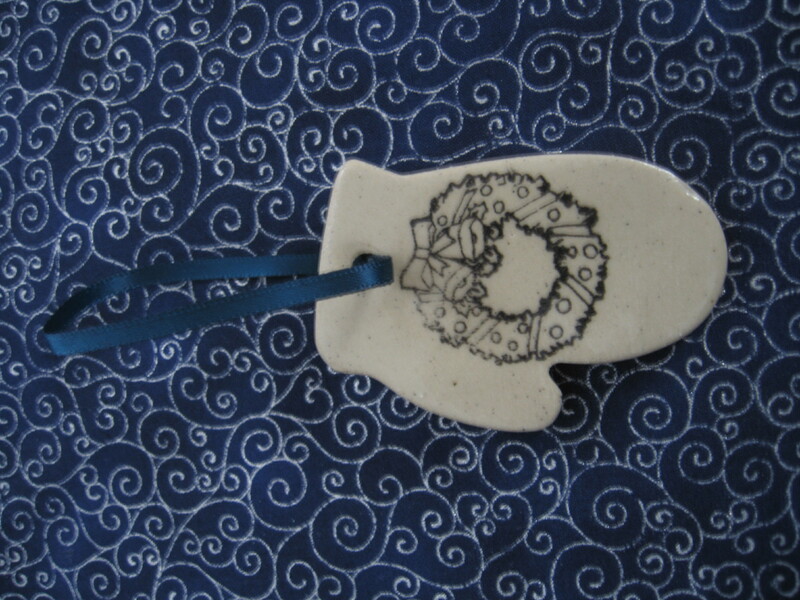 Remember I can make a wreath with any of the images you find on any of the seasonal decorations. 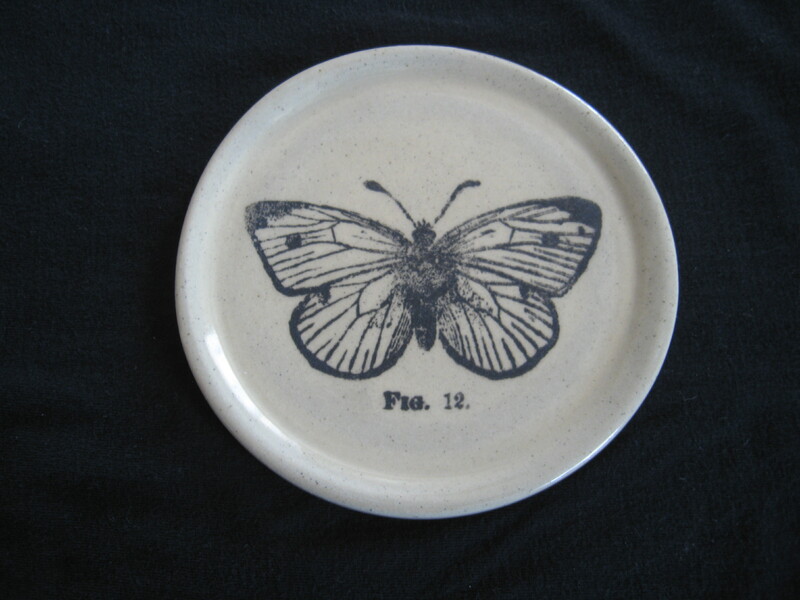 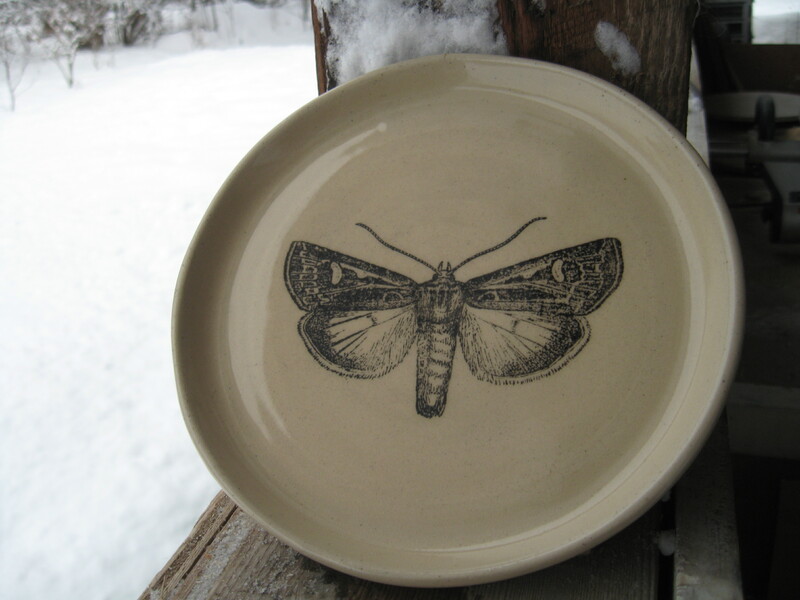 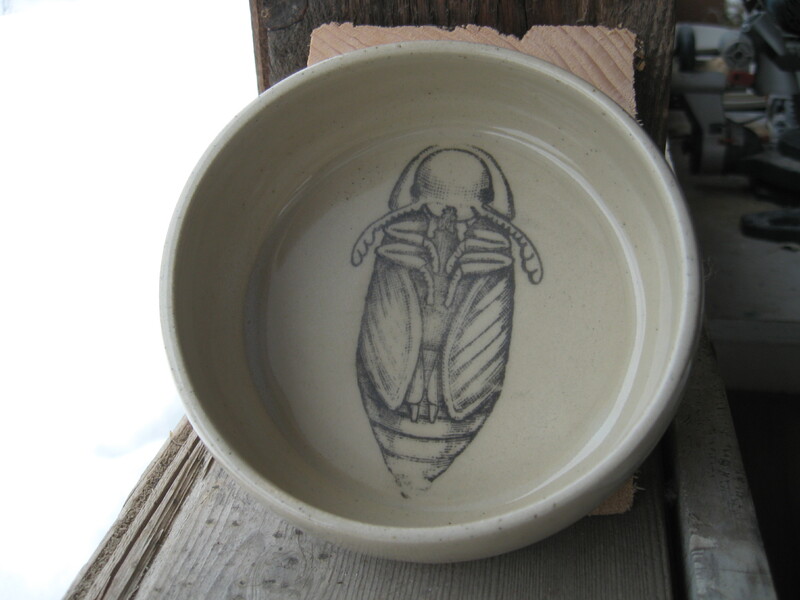 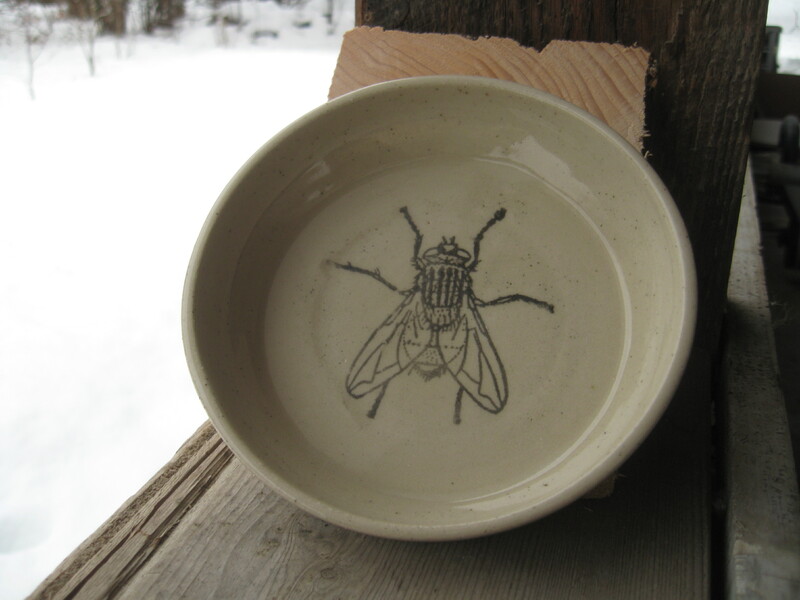 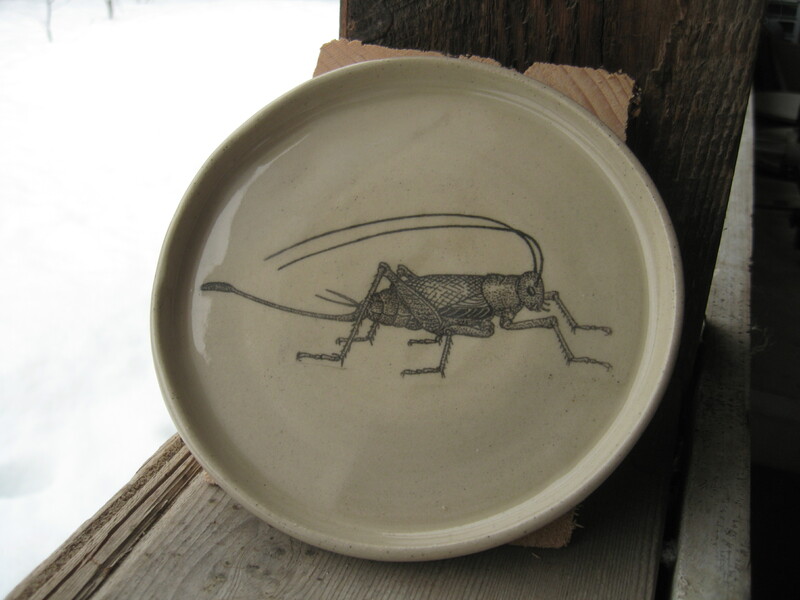 This small beautiful bowl is decorated with a large beetle. 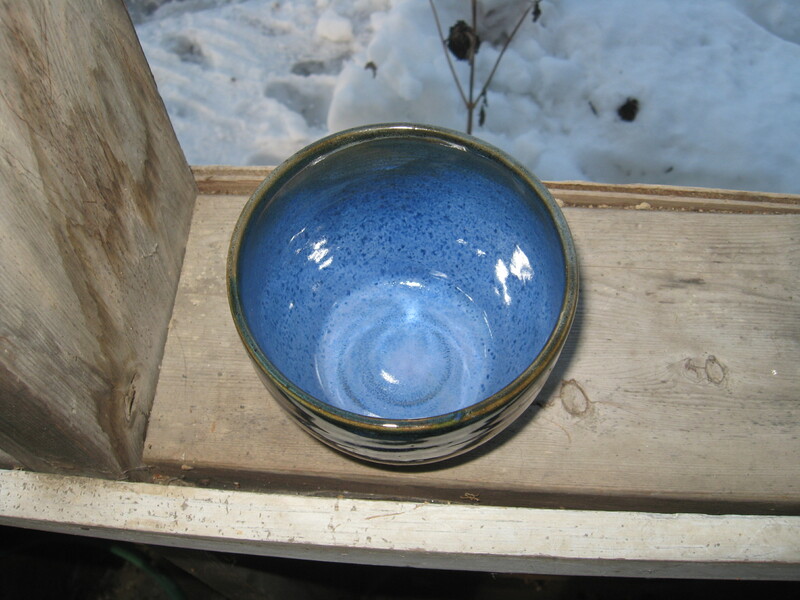 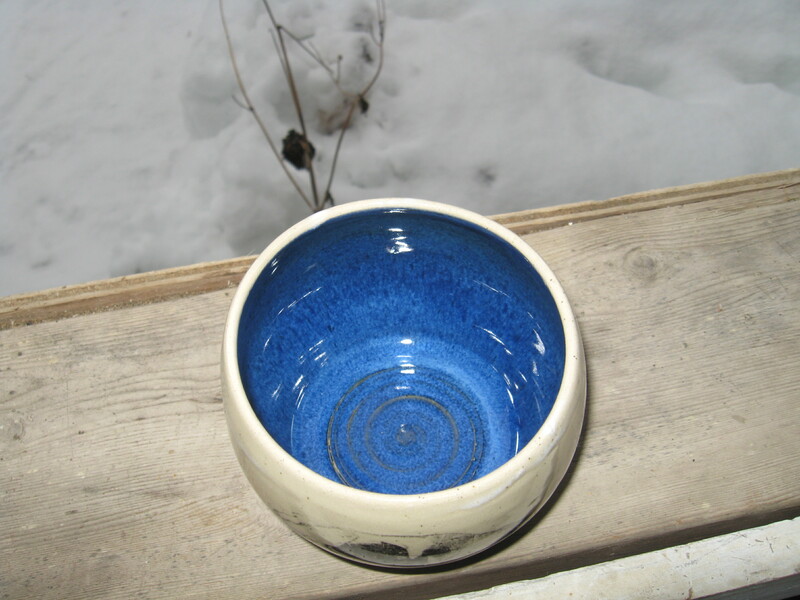 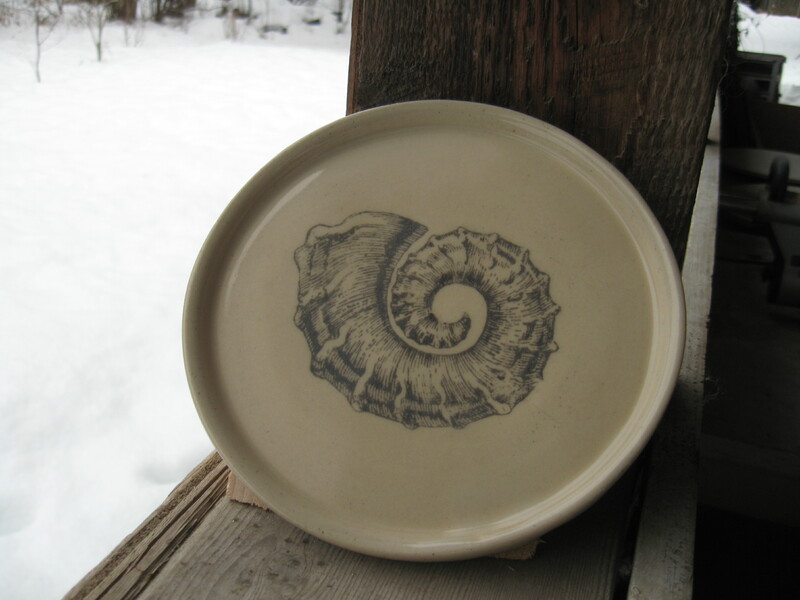 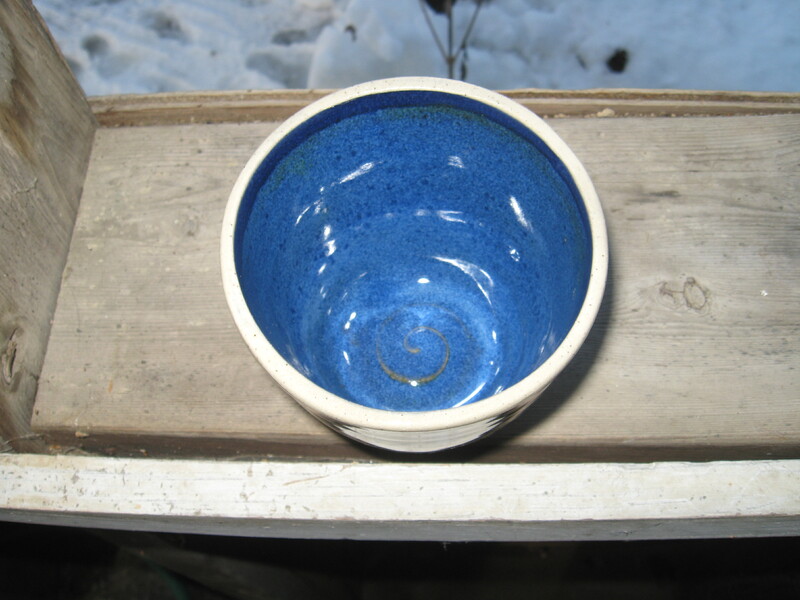 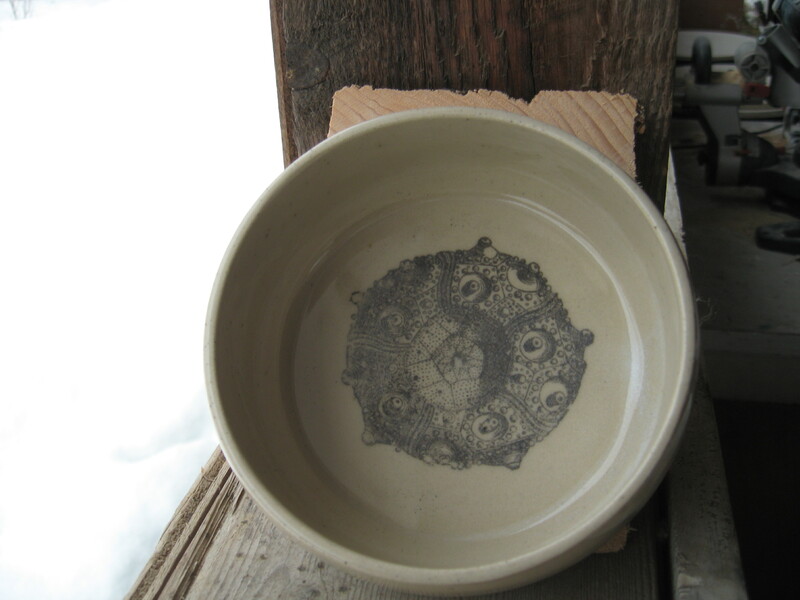 This small beautiful bowl is decorated with a Spondylus or thorny oyster. 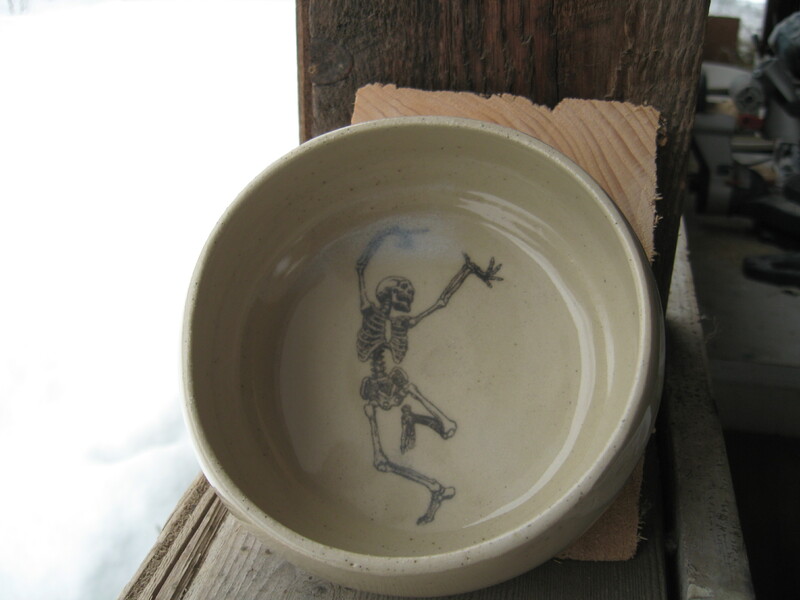 This small beautiful bowl displays a skeletal hand grenade. 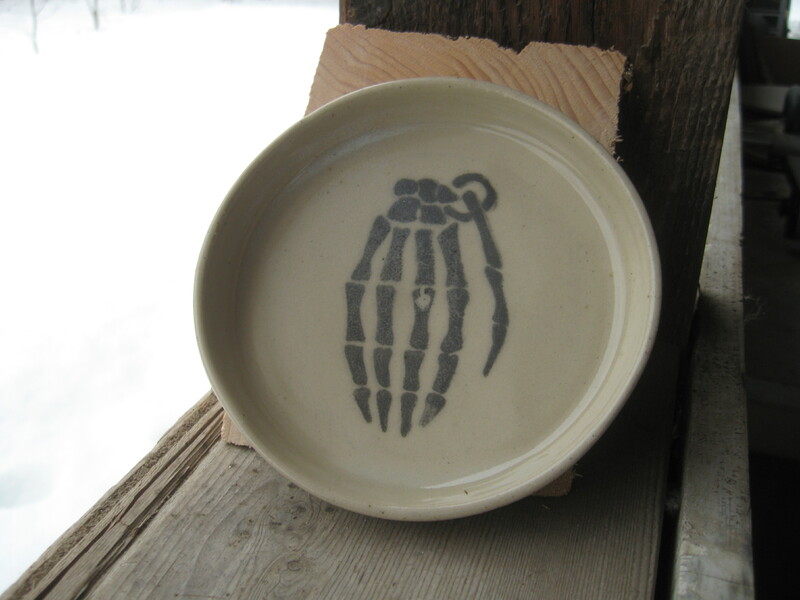 It’s the bomb! 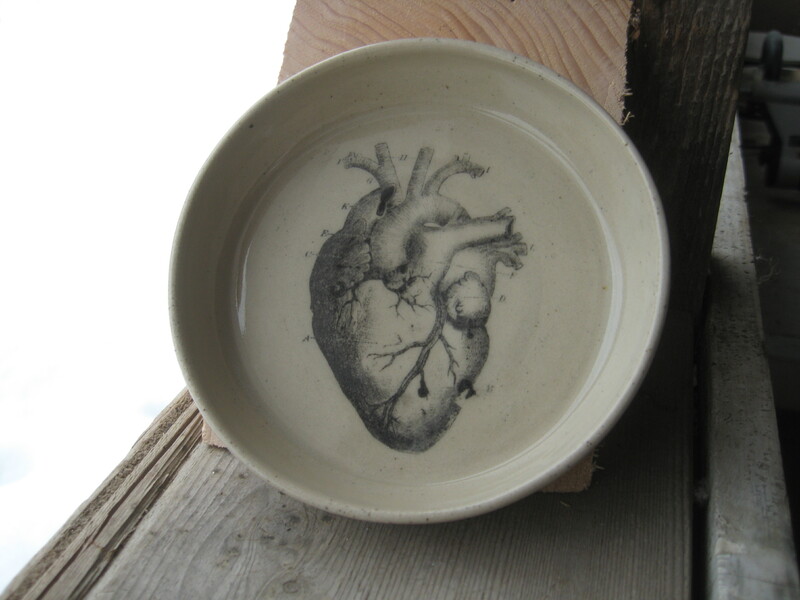 This small-sized beautiful bowl displays an anatomical heart. 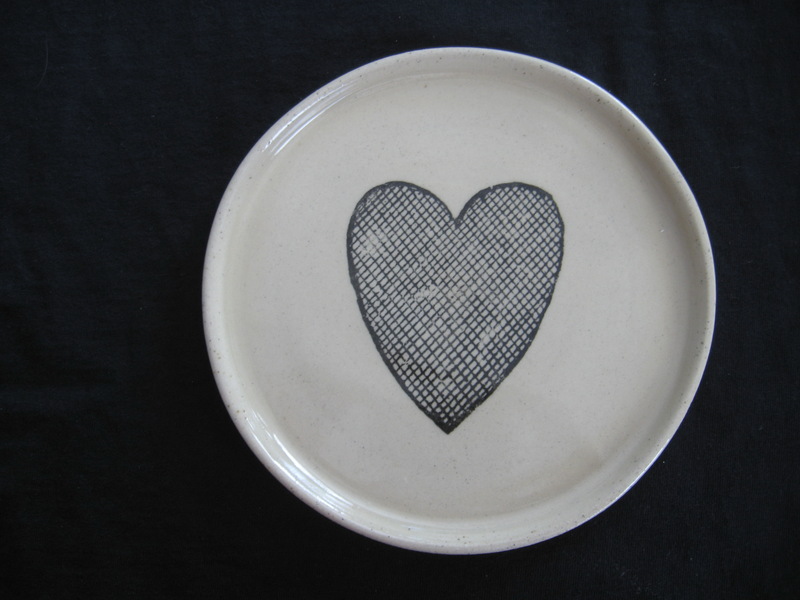 I heart you. 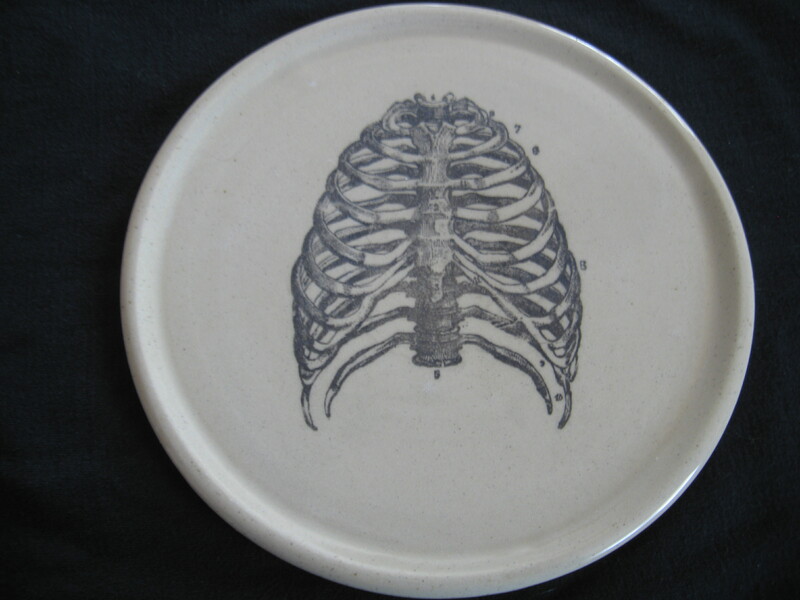 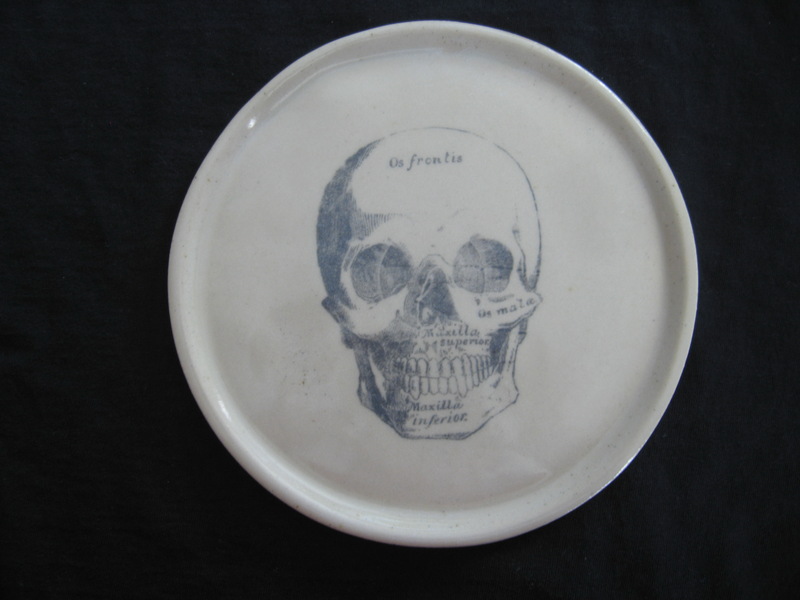 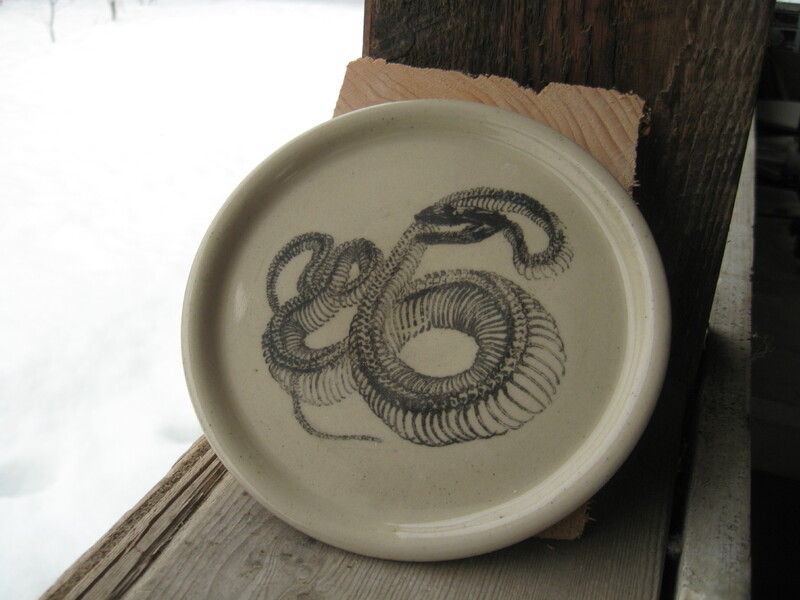 This small sized precious plate displays a snake skeleton – ssssmashing! 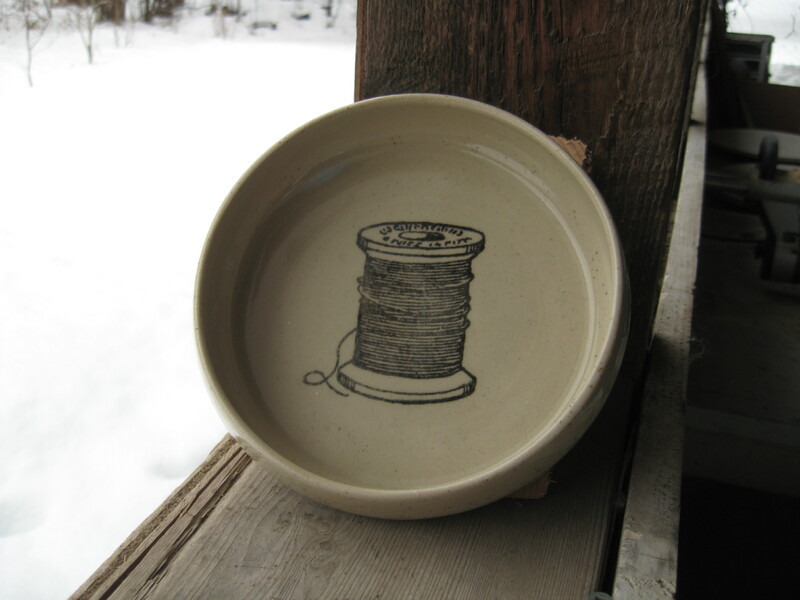 This beautiful bowl displays a classic thread spool. 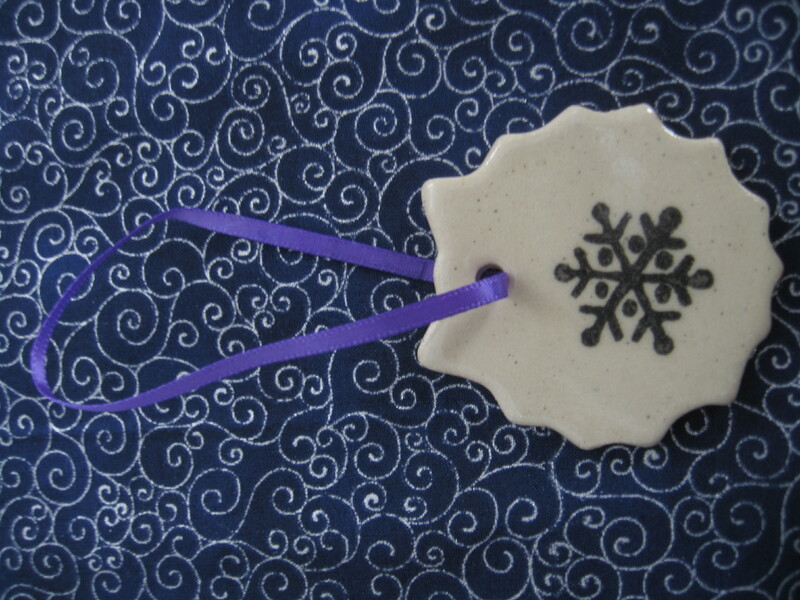 Crafty little vixen. 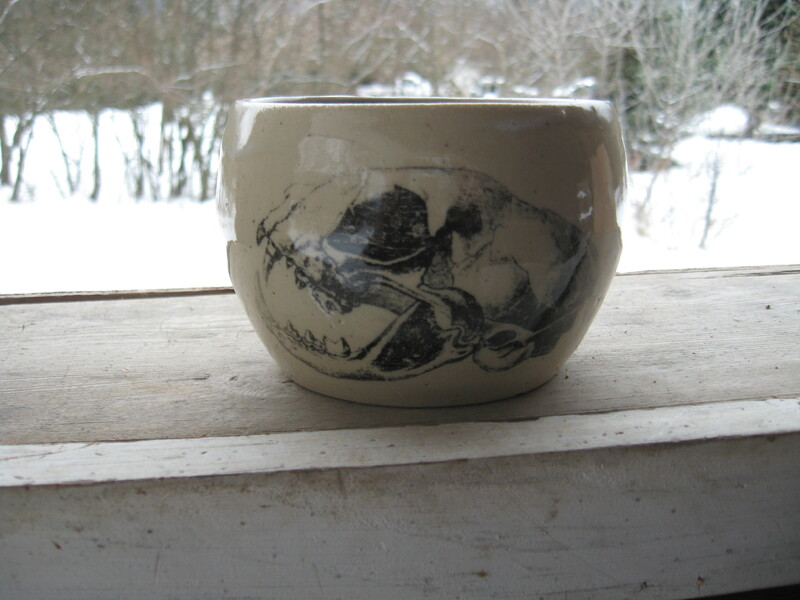 Roar, says this cougar skull on this marvelous mug. 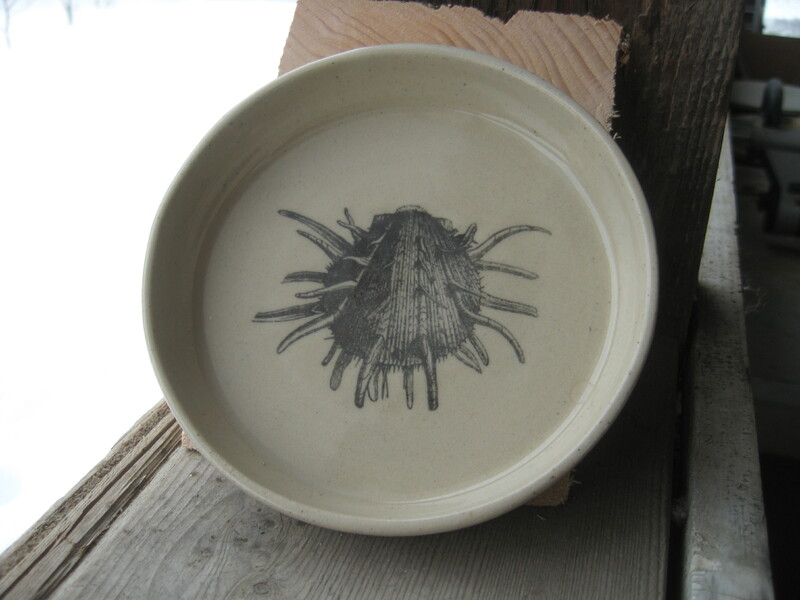 This beautiful bowl displays a delicate sea urchin that is itching to come home to you. 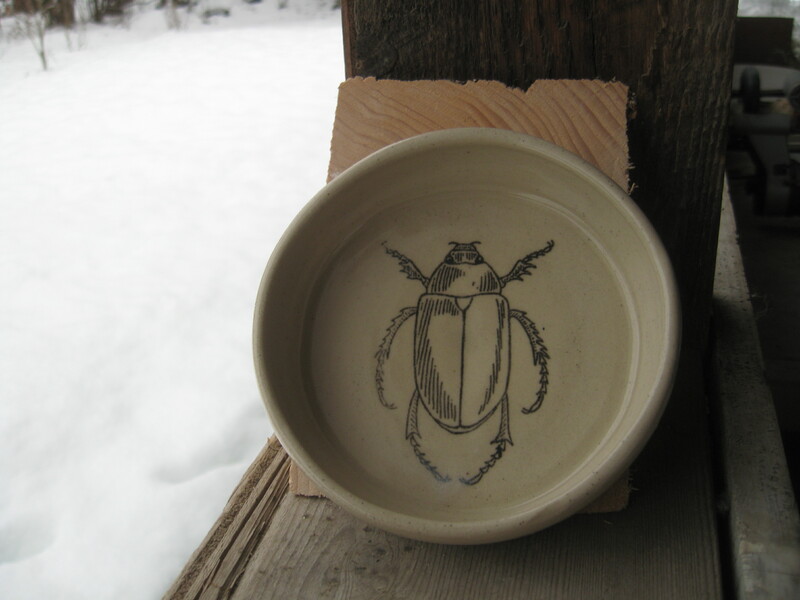 Yup, this wee beetle is actually called the drugstore beetle because of it’s penchant for consuming pharmaceutical drugs. 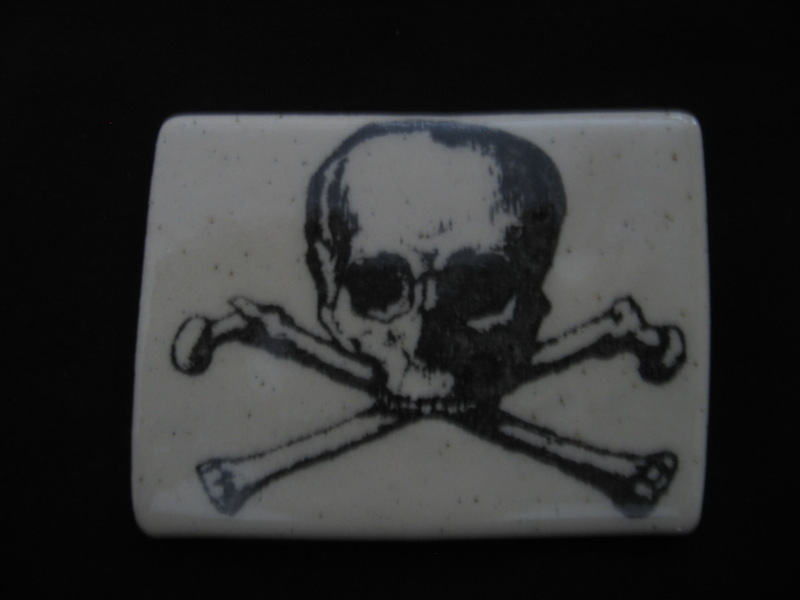 Beware, here there be pirates! 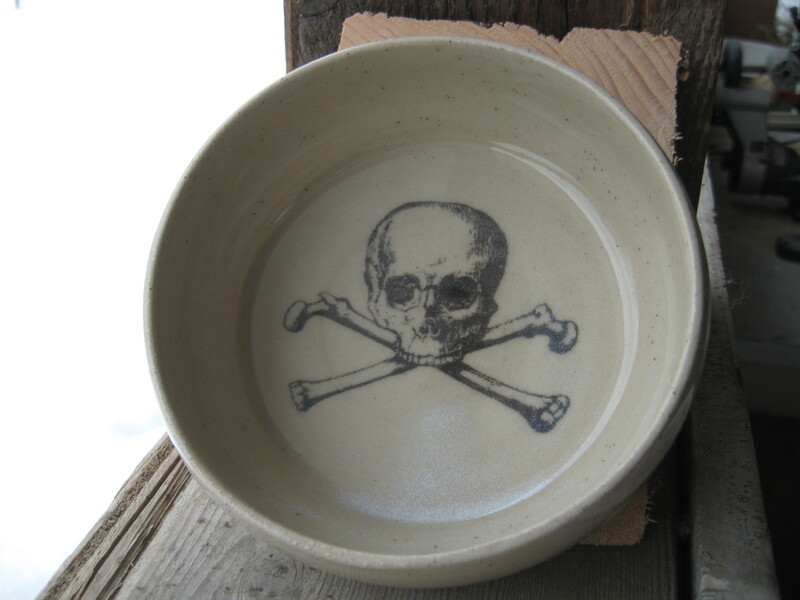 Arrr…on a beautiful bowl…arrr. 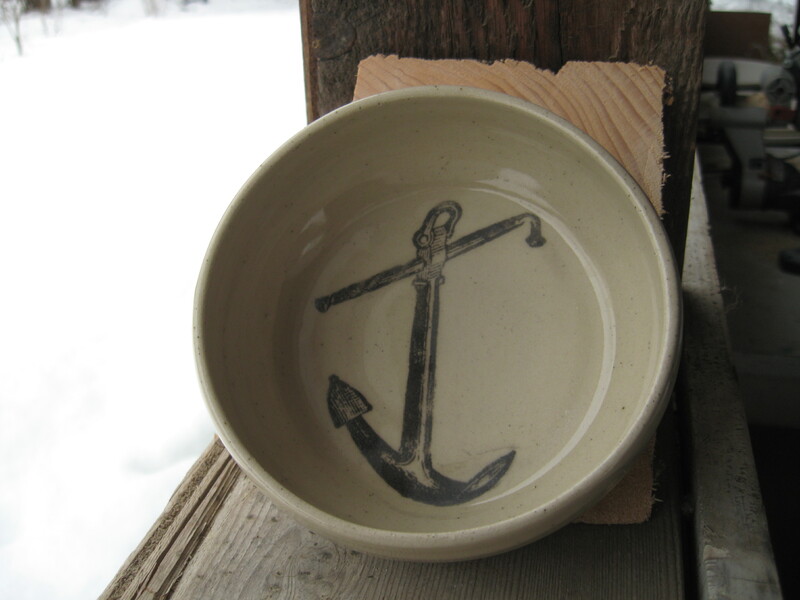 Anchors away with this beautiful bowl. 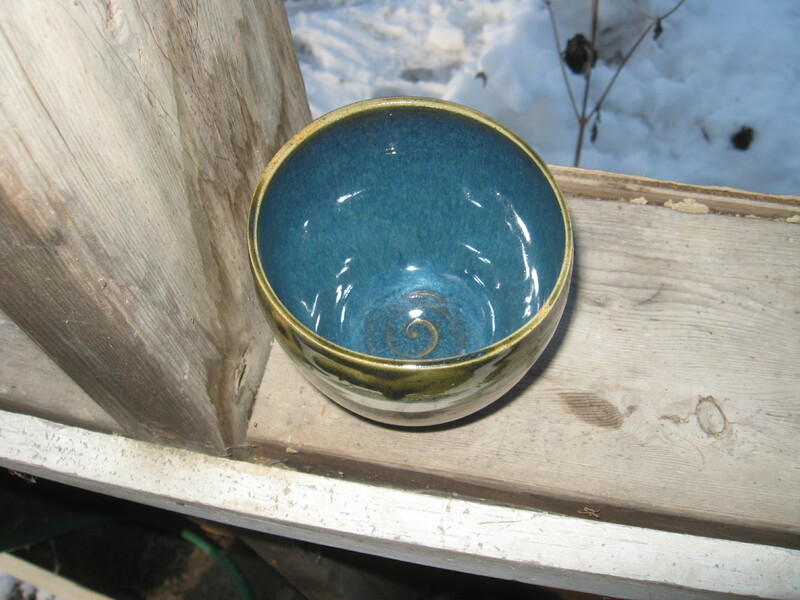 This beautiful bowl displays a wee bell in a glass sphere. 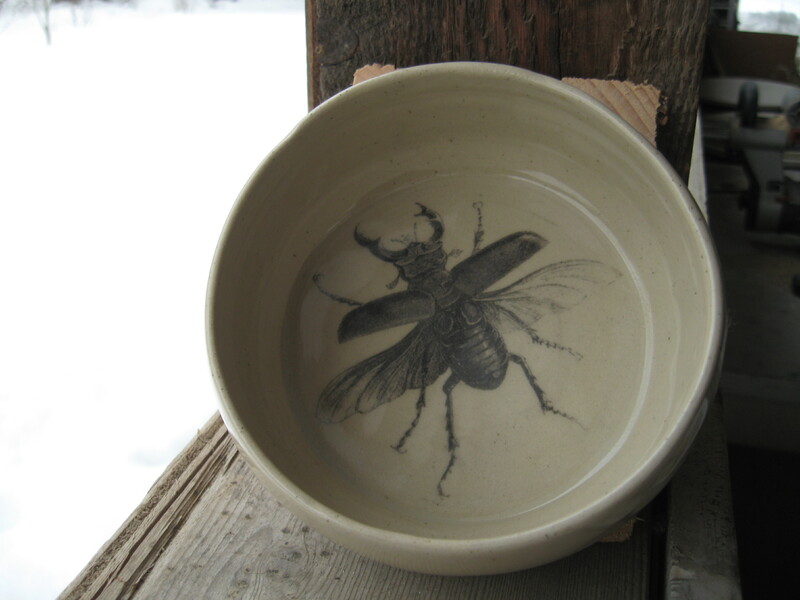 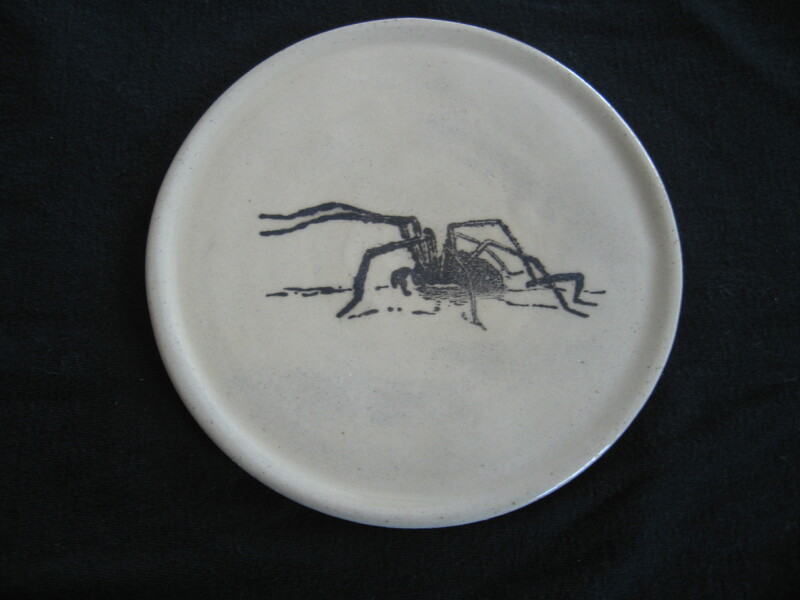 This beautiful bowl is graced with an amazing stag beetle. 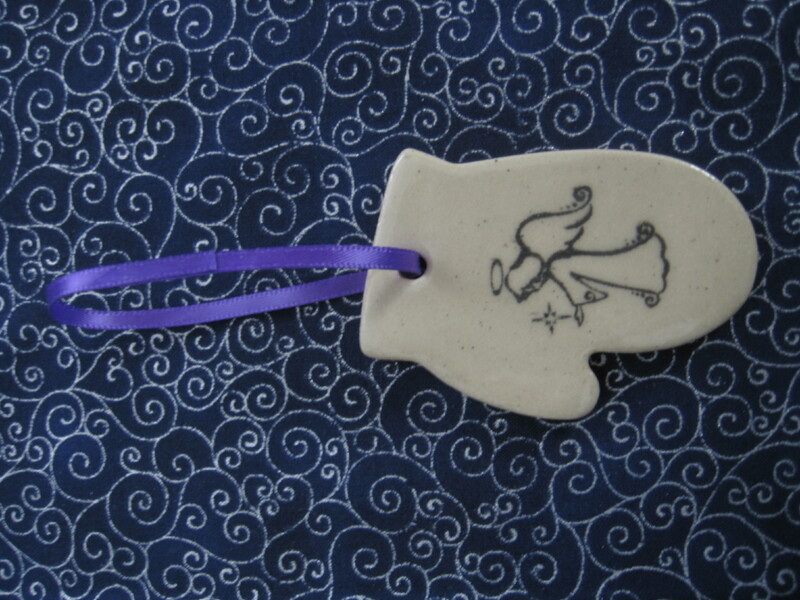 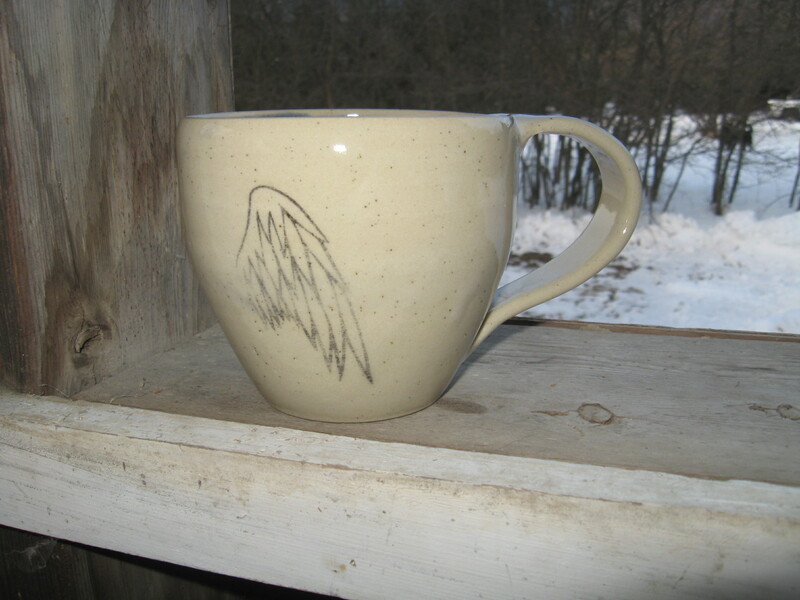 This marvelous mug is adorned with two angel wings….sneaky, sneaky wings. 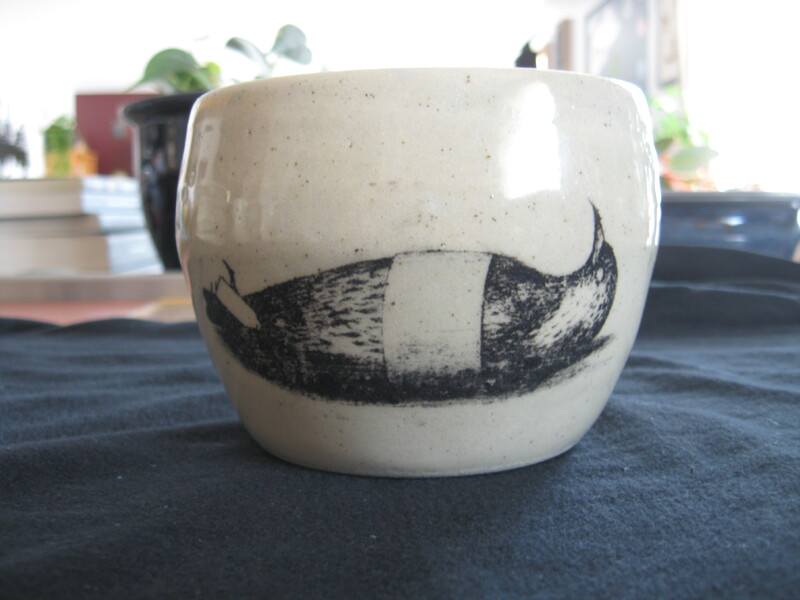 This mustachioed man thinks his marvelous mug is simply divine. 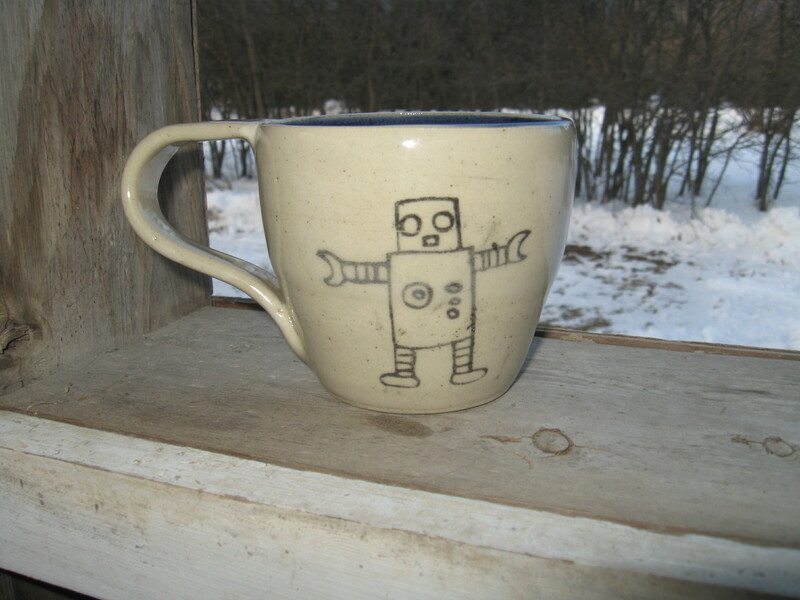 This marvelous mug is adorned with a robot wanting a hug. 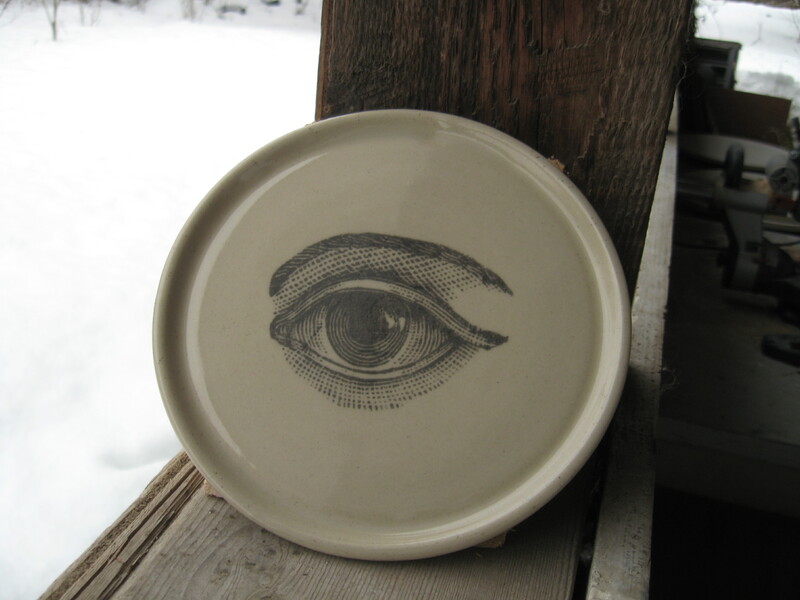 These marvelous mugs pulls the eye in a downward spiral. 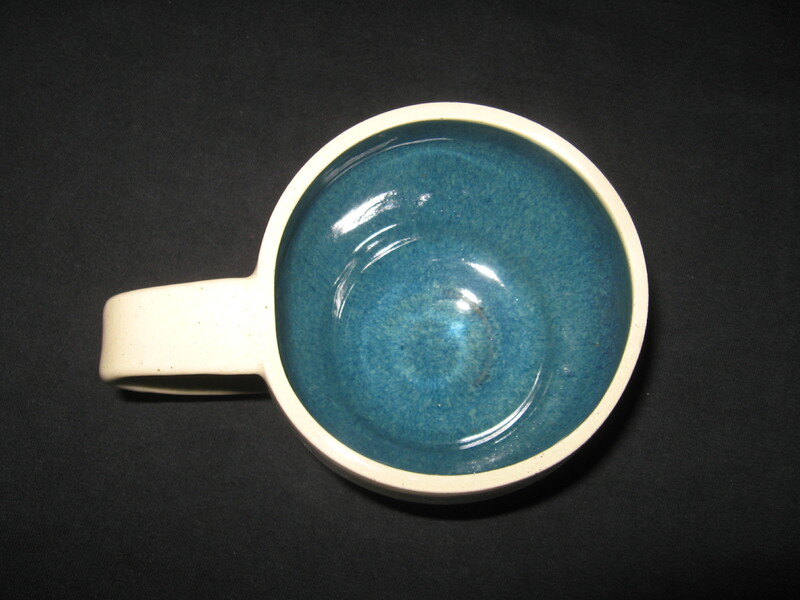 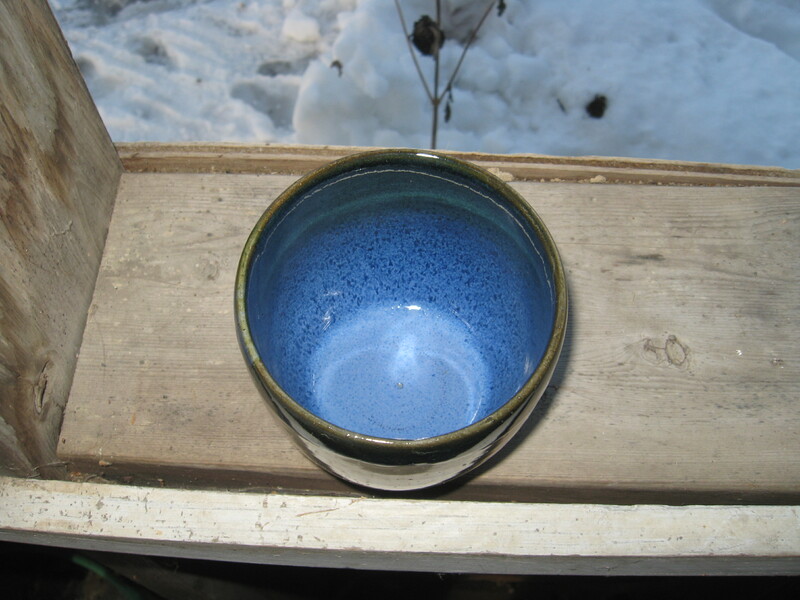 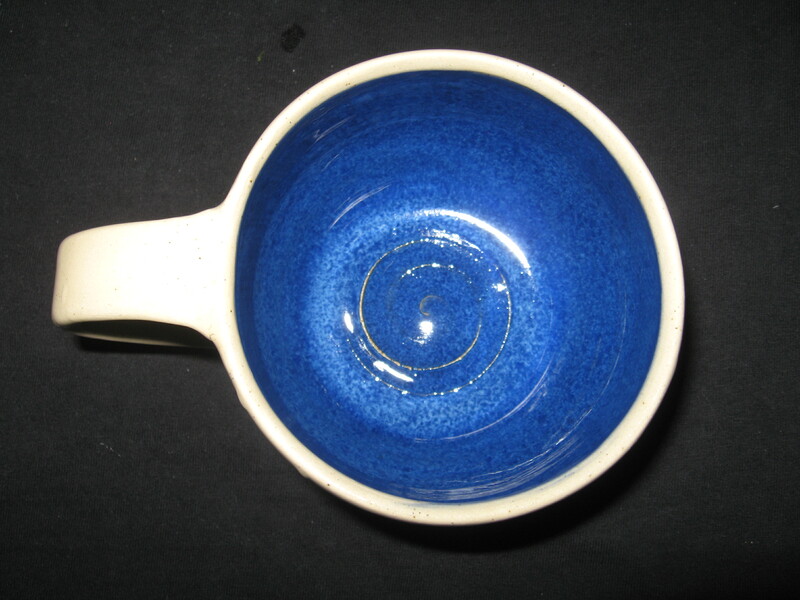 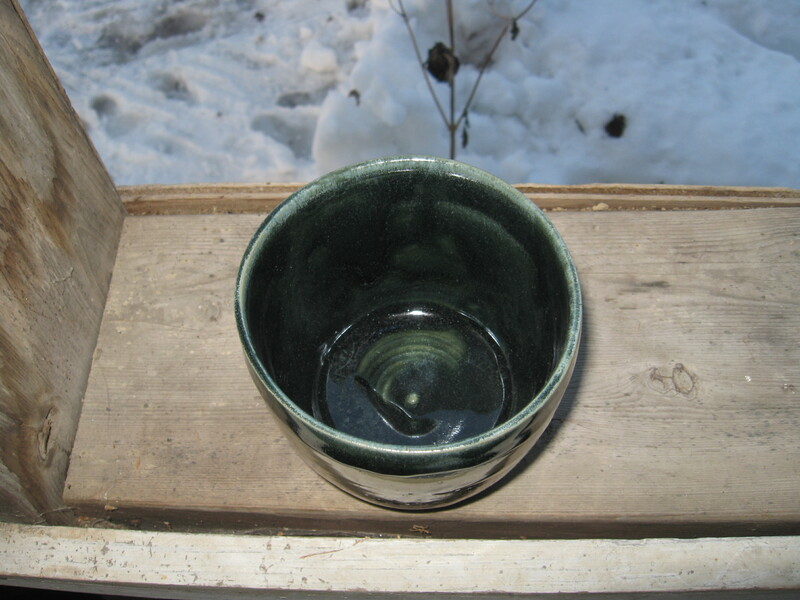 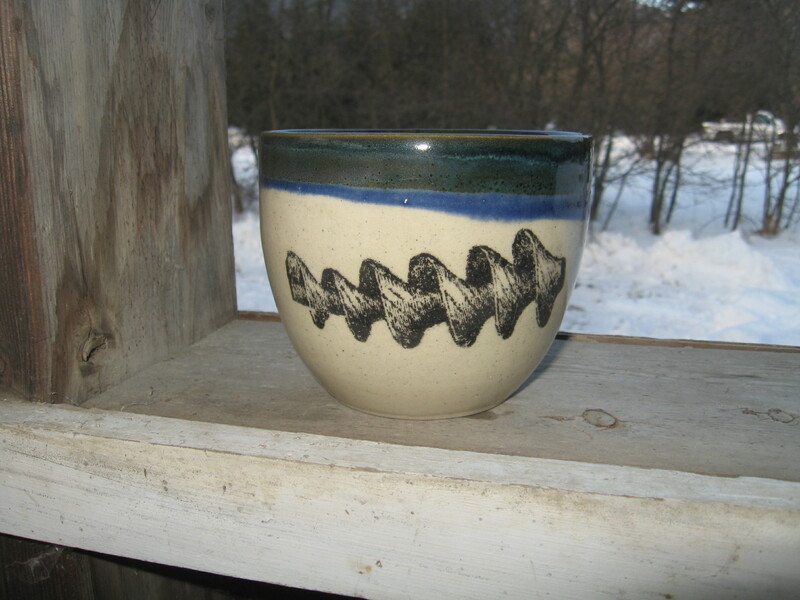 The first one is representative of my old style of dipping the rim of the mug in the coloured glaze. 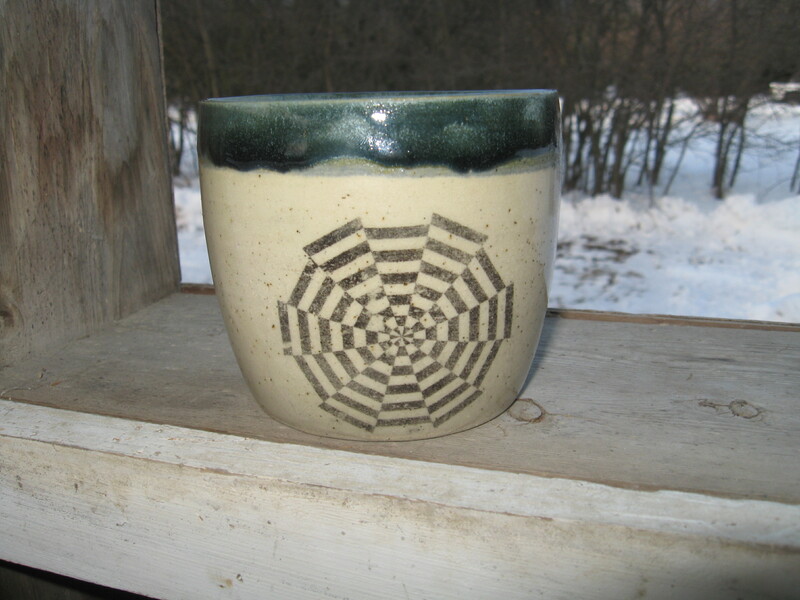 The next mug indicates my newer style of leaving the external portion of the mug more pure with only clear glaze over an image. 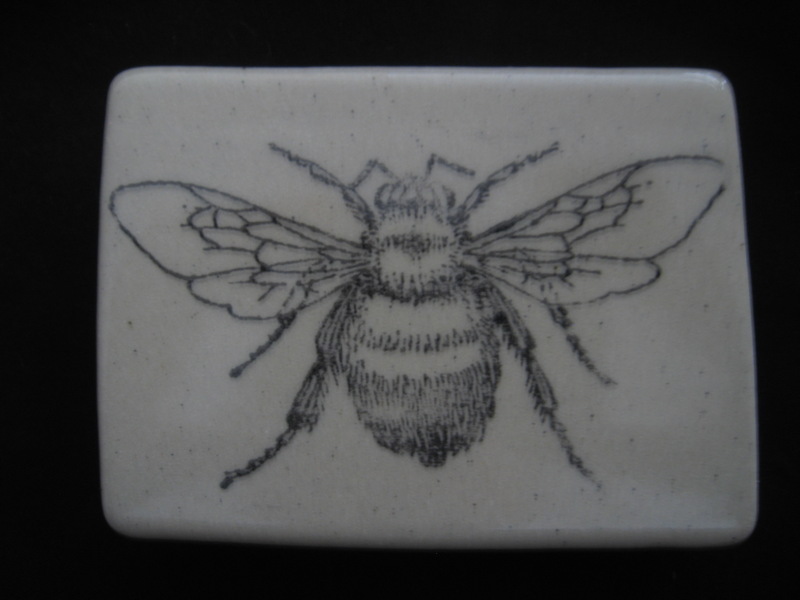 This not only allows me more room for the image (hence, a larger image) but it also provides a greater contrast between the black of the image and the natural colour of the clay. 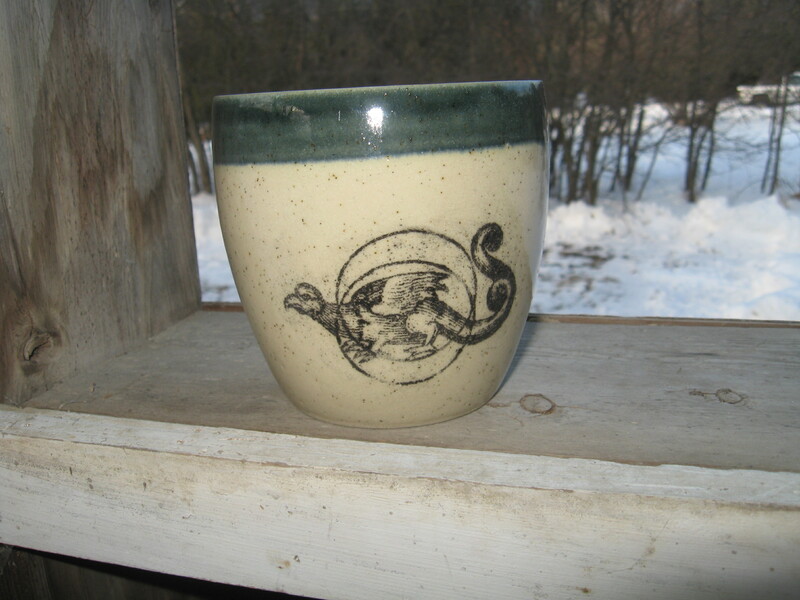 This marvelous mug depicts a basilisk or medieval dragon. 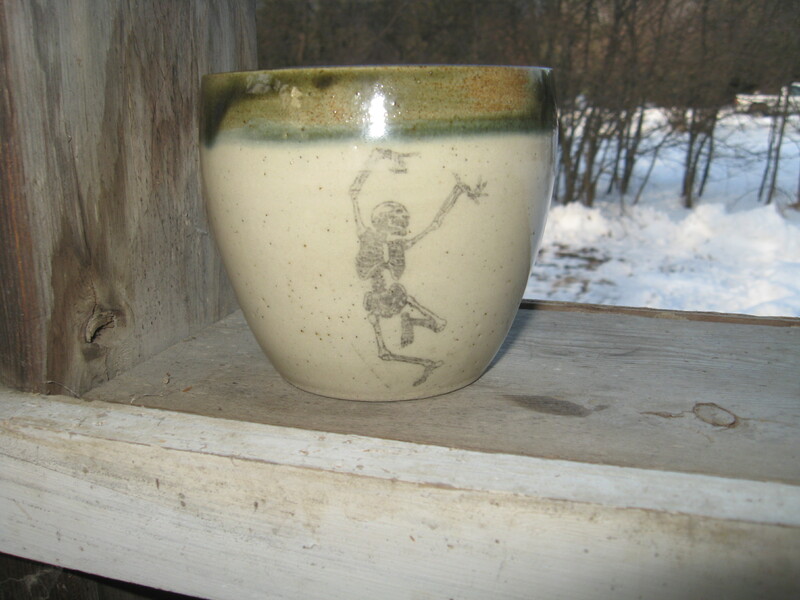 This marvelous mug illustrates a little skelly dancing his way into your heart. 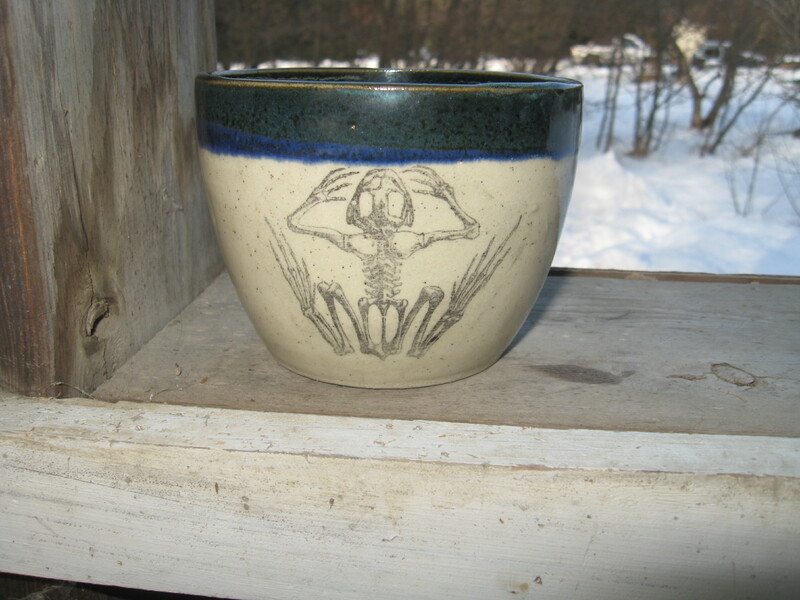 Here is a tumbler with a frog skeleton. 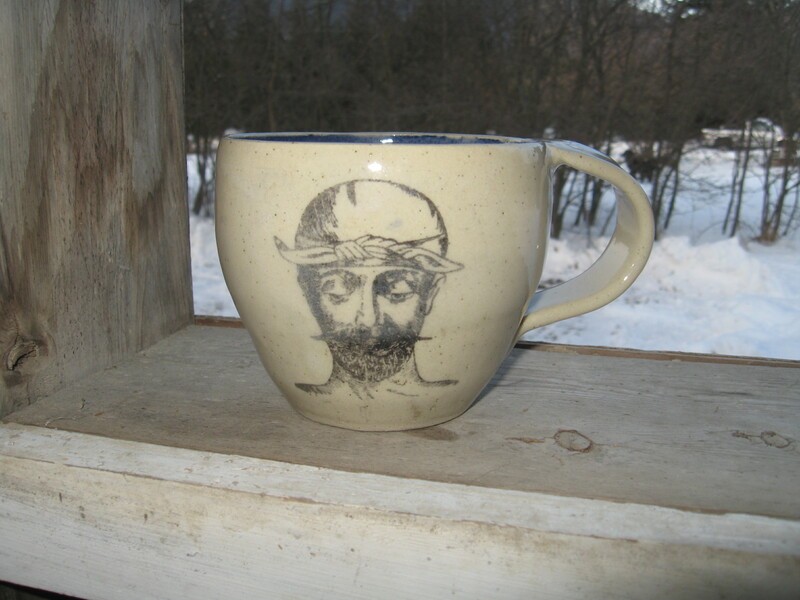 Remember, unless otherwise specified, each mug has the same image on two sides. 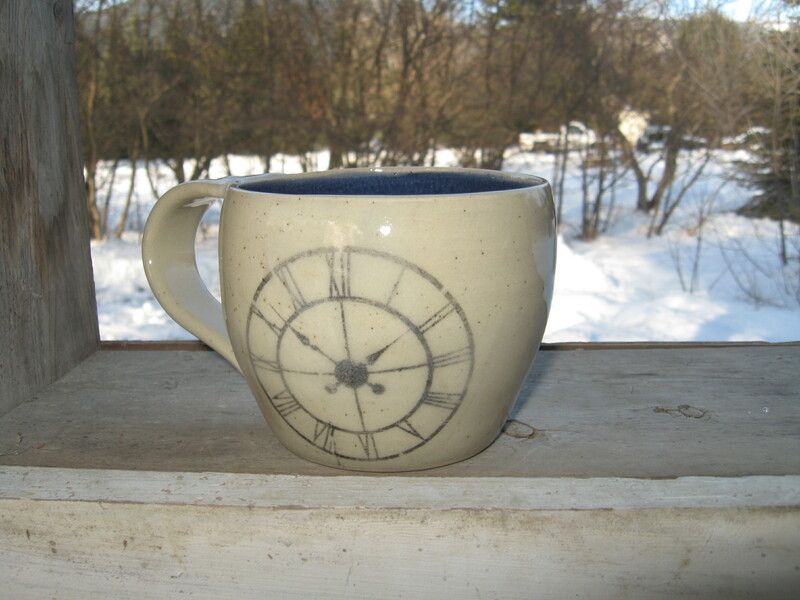 This marvelous mug depicts a clock reading 1:52. 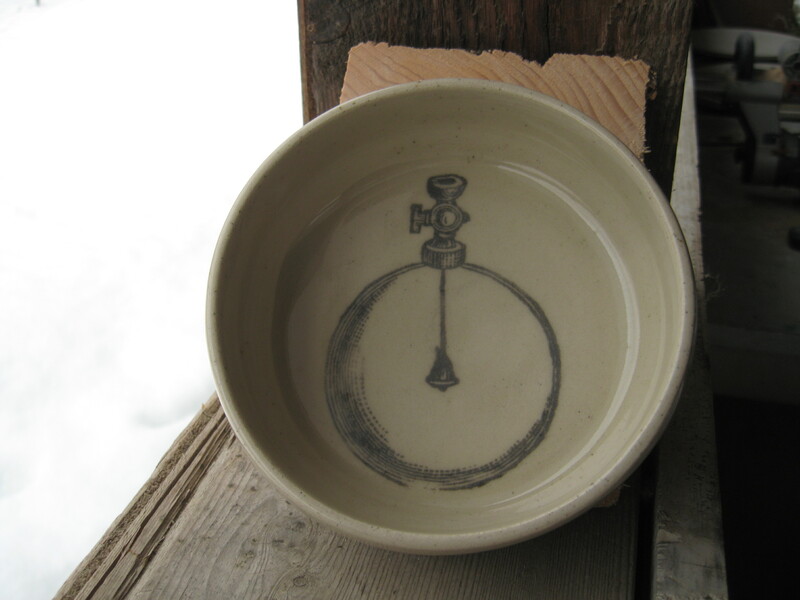 What time is it Mr. Wolf?